caused by under-inking of the plate on three sides of the design. by Alcock and Meredith in 1949 and illustrated on page 14; after 70 years it remains the only known example. a photocopy of this article is provided with the item. One of the outstanding and unique surface printed rarities. Rarer and with more visual impact than any of the surface printed abnormals as it is unique. An unusual opportunity to acquire one of the, if not the, rarest of all surface printed varieties. An Important and memorable Exhibition item. cancelled Contrary to Post Office Regulations by a single '530' of MILNTHORPE, Westmorland. 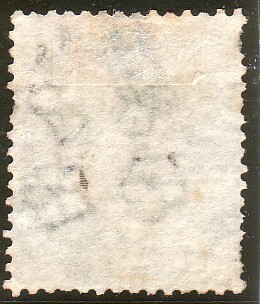 The stamps show evidence of dry printing. Attractive and very scarce item. 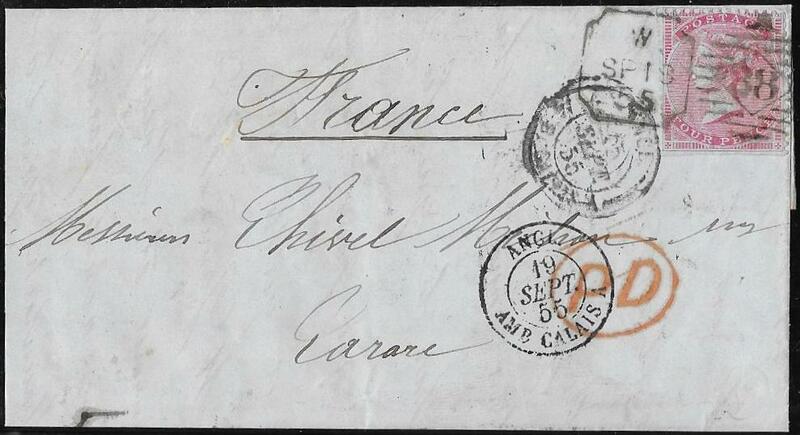 hence each stamp cancelled by the AMB CALAIS date stamp, April 28th 1857. 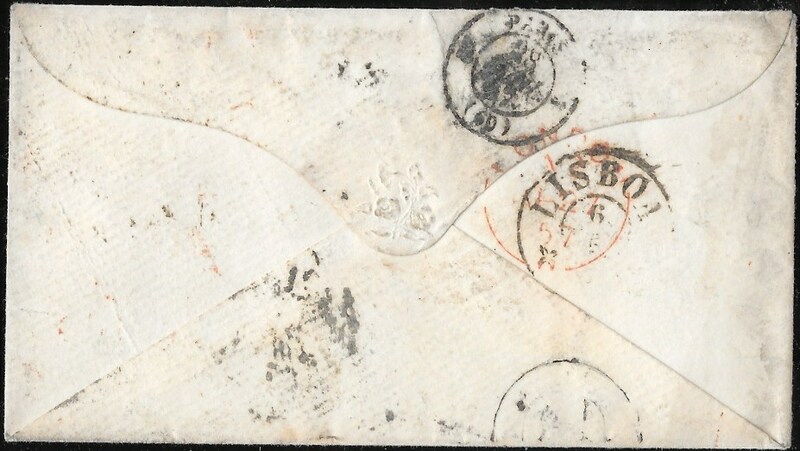 A clean small envelope addressed to Poste Restant, Lisbon. Very rare to find a French date stamp having to be used in this way. 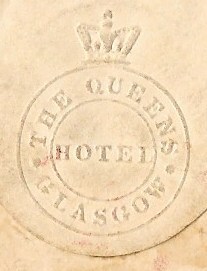 there are no postal markings on reverse but an embossed 'The Queens Hotel Glasgow'. In m/s red is 'over 1/2oz' with a red signature alongside and in black '38 cents' and '48' charges. Liverpool on February 7th 1857 arriving in New York on February 22nd. 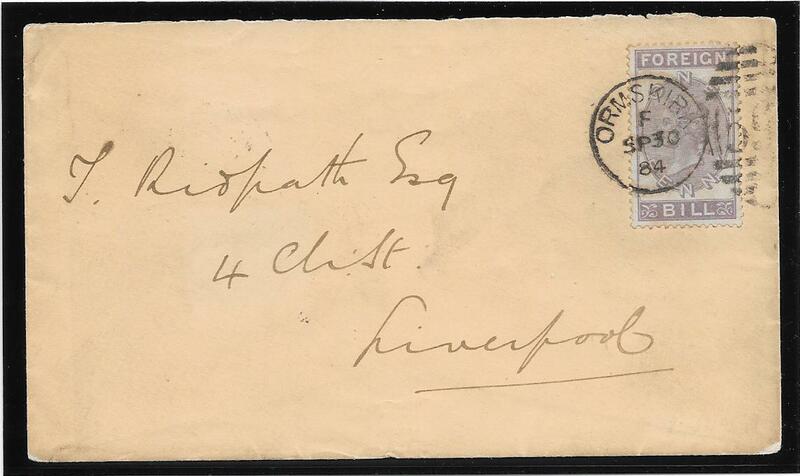 Very unusual not to have postal marking in Liverpool and no cancellation on arrival. The 1/- has some very short perf at the top right but is from the early printings of the much scarcer deep green shade. This shade is priced by Gibbons on stamp alone at £550. 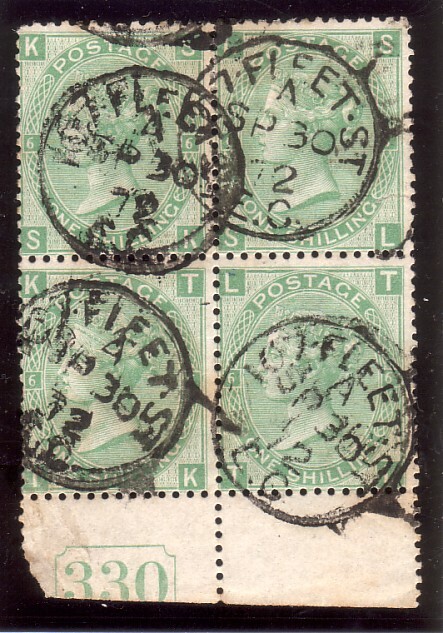 Examples of any Scottish Experimental Duplex on cover with other than the contemporary 1d values are rarely found. An attractive and rare item. NB: see the next item, 152240. 152240. 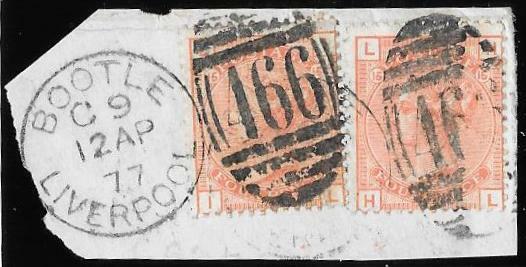 1/- SG72, fine, tied to an ENTIRE to New York by the GREENOCK Type 2, EXPERIMENTAL DUPLEX for April 29th 1858.
which left Liverpool on May 1st 1858 and arrived in New York/Boston on May 11th 1858. The interesting family letter, rather fragile, is easy to read. NB: see the above item, 152239. 152229. 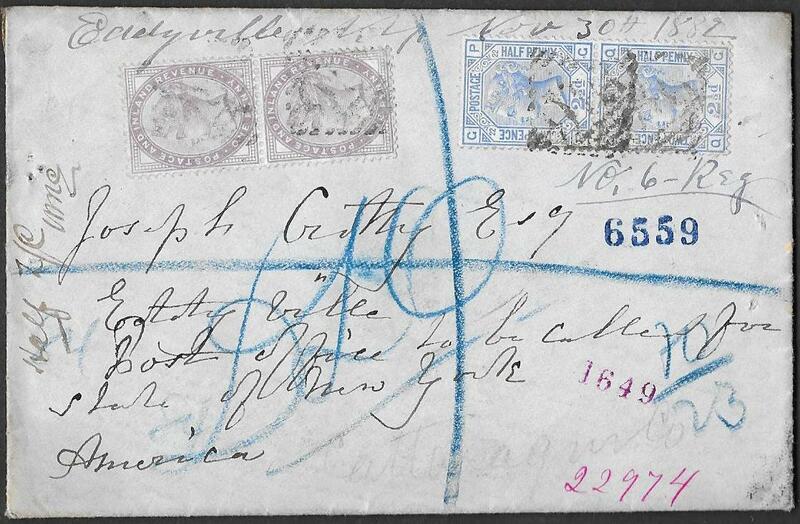 A fine 2/6 SG178, August 4 1899 tied on an envelope from London to Chicago by a large single ring LONDON cds. Cancellation centrally applied upright and ties at left and right sides over the perfs. 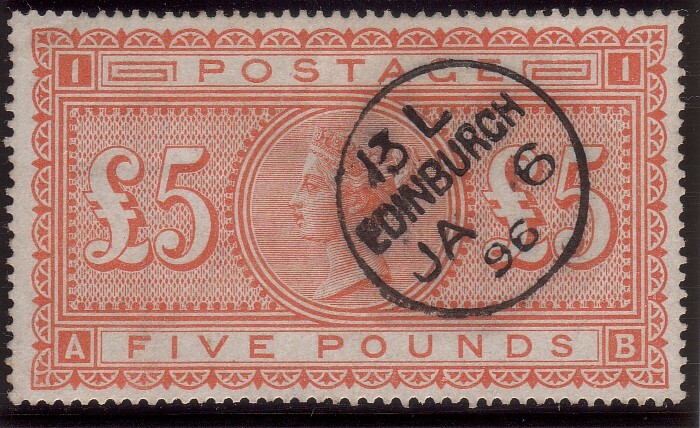 The postage paid by a very rare SINGLE usage of this high value indicating a letter weight of more than 5.5 oz or 156g. This was at a period when many postal administrations were members of the UPU and high value stamps were only needed in exceptional circumstances. and that is on a printed Registered Envelope but the stamp is damaged. 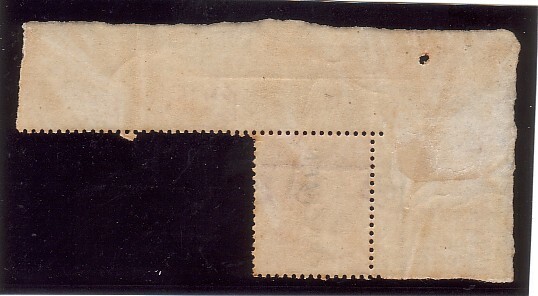 The reverse side of the envelope is partially toned but the front is clean with the one vertical filing fold. A rarity which displays well. 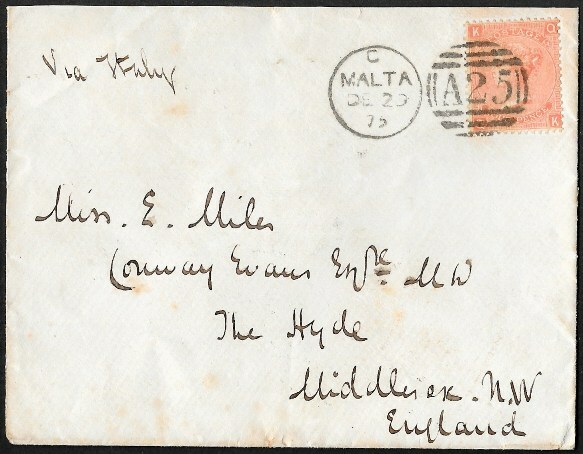 fine example tied on a clean envelope to Middlesex by a fine MALTA duplex, December 29th 1875. 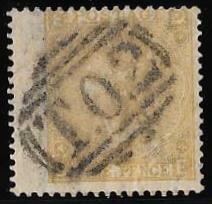 On the reverse is a fine strike of McKay fig 3060, used originally as a Late Fee strike when struck in black. 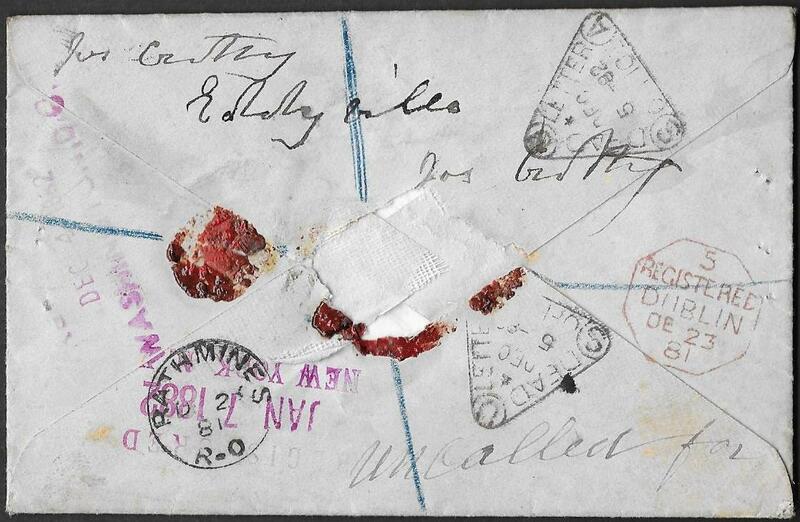 In this example it appears to have been used as a receiver and struck in red, London January 7th 1876. This is the first time we have seen it struck in red as used in tis way - possibly an isolated strike. 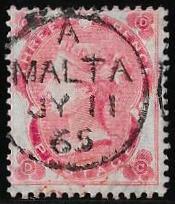 4d plate 14 priced by Gibbons at a minimum of £200 on cover without the premium for usage in Malta. An attractive and very scarce/rare combination of features. 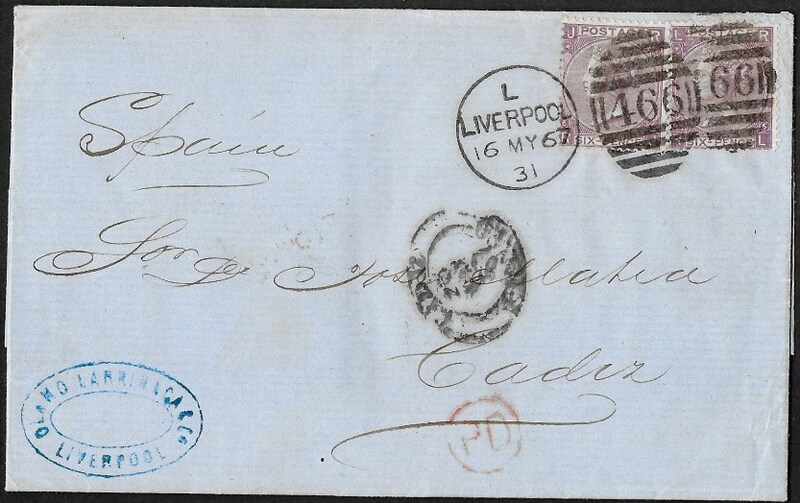 two fine examples in a deep shade tied to a clean entire to Cadiz by a Liverpool duplex, May 16th 1867.
and Gibbons prices a SINGLE on cover at a minimum of £350. An attractive and scarce item. Belfast duplex for May 1879 leaving virtually the whole of the Queen's head clear. The envelope has a delicate printed decoration in lime green of flower motifs on branches/stems. 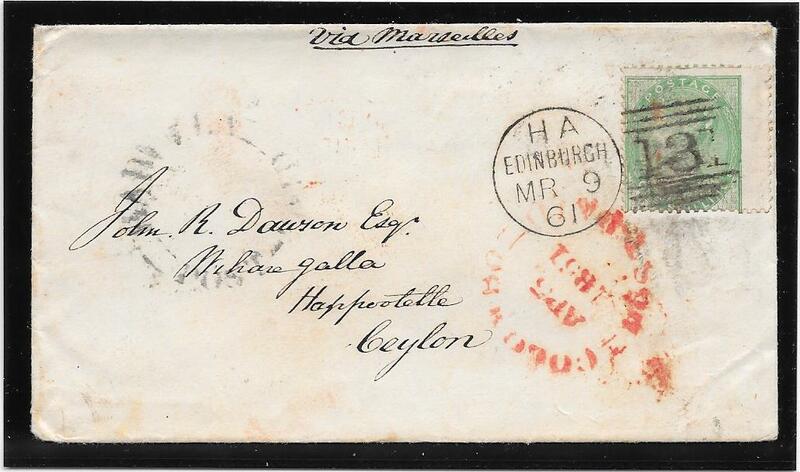 Very unusual and an early example of a coloured printed illustrated envelope. NB: the item is finer than the scan suggests. IMPERFORATE 1d Lilac CONTROL E with RPS Cert. 151381. 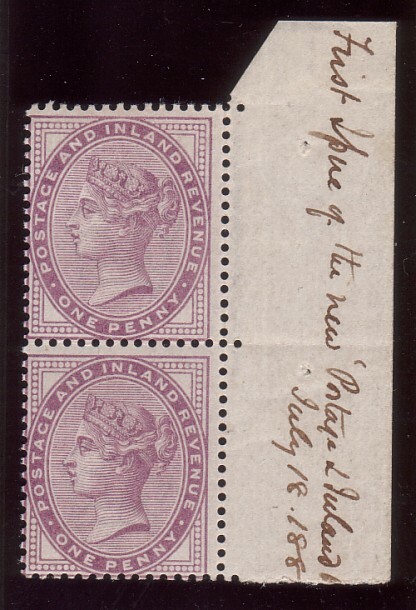 1d mauve SG174: the Extremely Rare IMPERFORATE Control E.
Very fine mounted mint with small hinge remains at the top. The imprimatur sheet of control E is complete and therefore this is a genuine IMPERFORATE stamp. 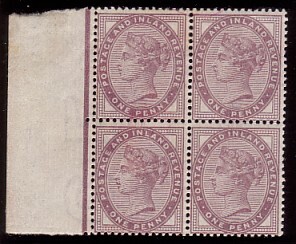 Imperforates are known for controls L and M but these are with 'Jubilee' lines. Gibbons prices a non-control pair at £7,500 in the mauve shade. with smaller side and bottom margins; it was not certificated. The example offered here has a 2009 RPS Certificate. A superb rarity and one of only a few extant. uncertificated Control L imperforate example, for sale at £7,500. It was described as 'a wonderful Victorian rarity'. 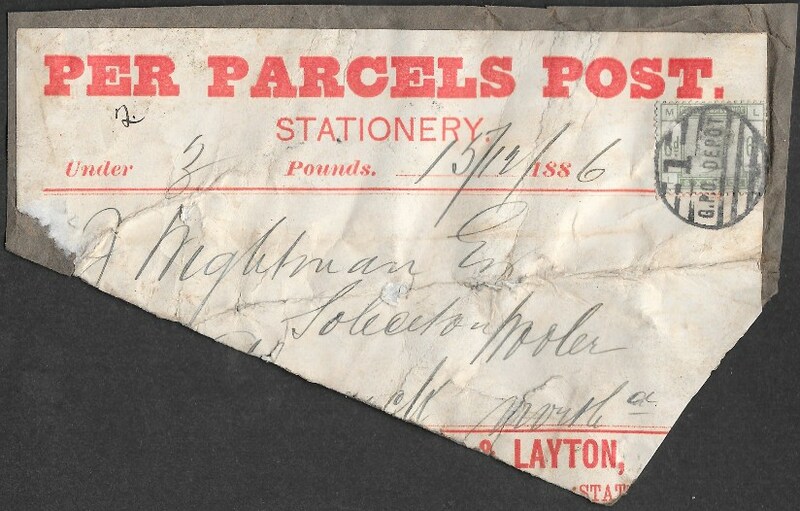 fine colour and tied to a part 'Per Parcel Post Stationery' printed label 'Under 3 Pounds' with the date December 15th 1886. 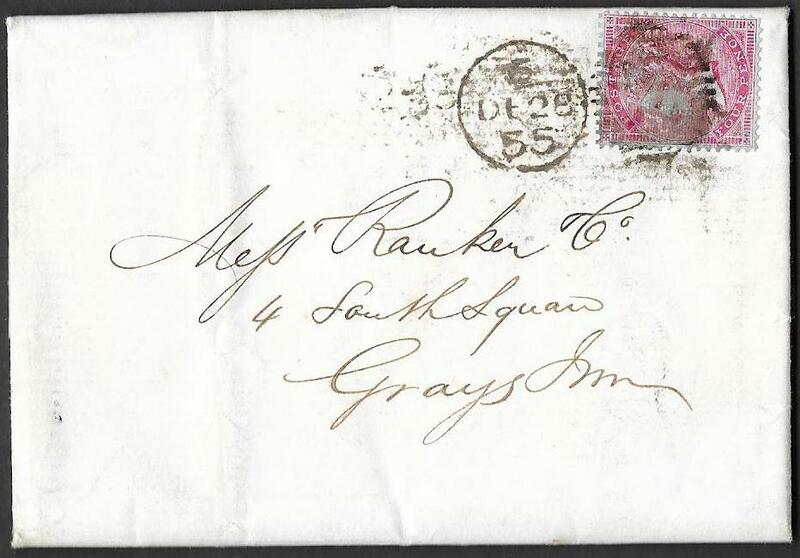 The 6d postage paid by a fine example of SG194 and tied by a very fine strike of the GPO Depot in bars, McKay Fig 3543.
a SUPERB G.P.O- London Parcel Post Depot Scroll for this same date 15 December 1886, McKay Fig 3638. This scroll cancellation is rarely found and this is the first example we have been able to offer on the original Parcel Post label. A rare pairing which would make a very interesting display page. NB: It is hard to see how a finer example of this rare scroll could be found. Some wrinkling and creasing as per the scan. 152219. 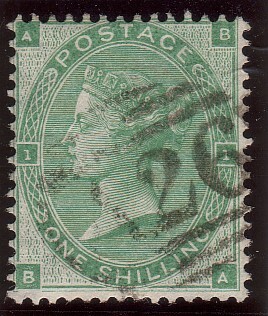 6d dull green, SG194, 'LH': the green is stromger than in the scan. 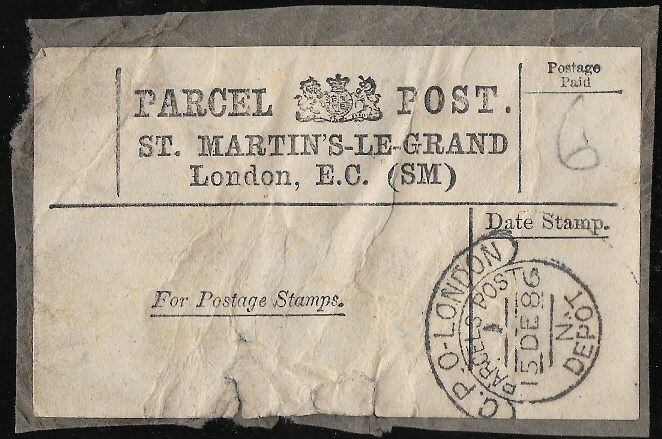 Cancelled by a part strike of the rare GPO London Parcel Post Depot scroll for May 20th 1885. This would go well with item 152227 above. tied to a small piece by the 'C' in bars of CONSTANTINOPLE lightly applied. 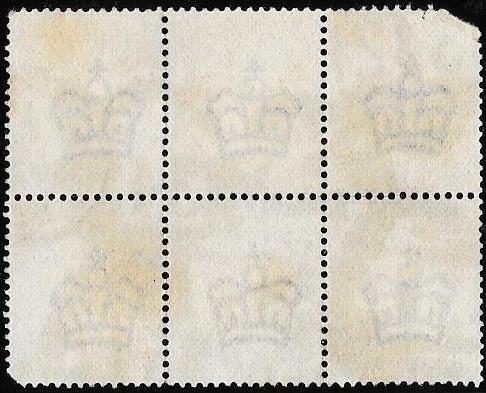 The cancellation leaves a lot of the Queen's head clear. A very attractive example with a scarce usage. tied to piece by FINSBURY PARK Sorting Office duplex, MAY 5th 1883. SG104; SG108; SG122; SG123; SG125; SG146; SG161 and SG162. 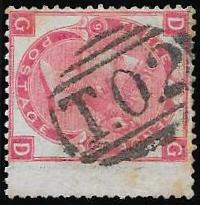 This emphasises the late usage of this stamp: the latest usage we have seen or can trace. which is NOT as pronounced as the scan suggests. 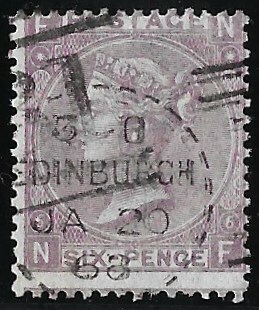 with an EDINBURGH Dotted Circle Type B2, January 20th 1868. 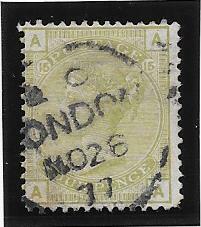 This cancellation unrecorded (Arundel) on any surface printed issue. 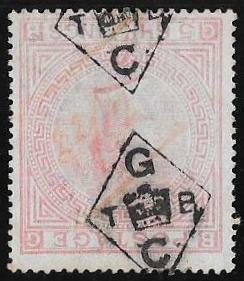 cancelled by an EDINBURGH dotted circle, Type C, October 7th 1880.
this stamp has NOT previously been recorded (Arundel) with ANY Dotted Circle from ANY location. The watermark, large garter, has been shifted upwards and it has additional marginal watermark letters. A remarkable item that deserves to be displayed. and centrally applied, for October 24th 1883. Rarely found with such a complete cds. 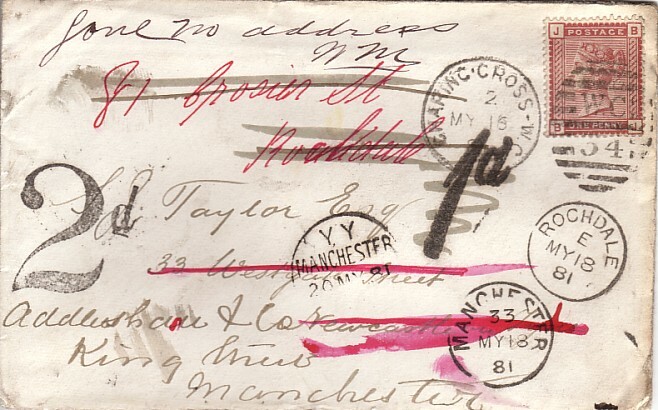 the MANCHESTER STATION LATE BOX scroll for December 9th 1883.
notes that this canceller was sent from the London Office on June 14th 1883. However, he records it used from January 2nd 1886 to March 4th 1898. 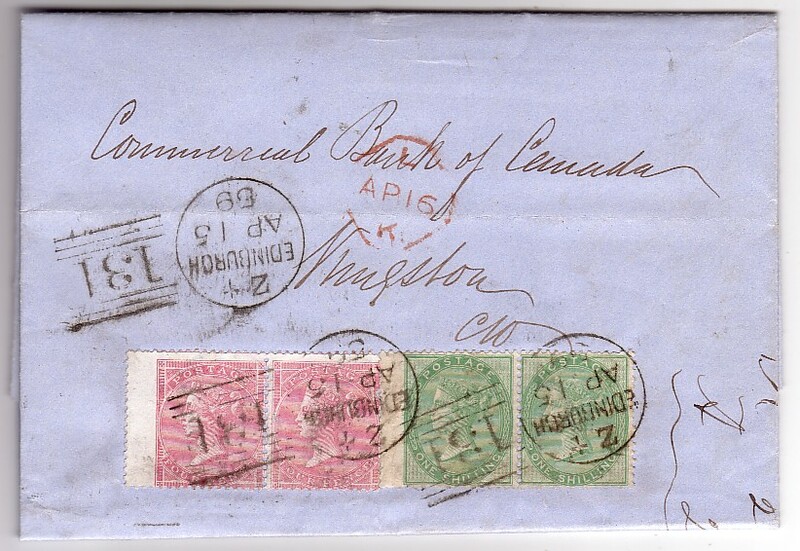 We have not seen this cancellation used on this 3d issue and cannot trace another example. 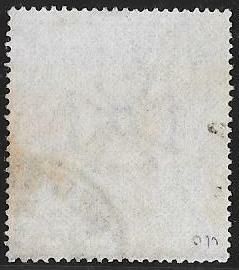 The stamp is a pale shade which enables the cancellation to be more clearly seen. Likely to be the earliest known usage of this rare cancellation. and the watermark emblems displaced. The Specimen overprint when applied has caused a very light partial crease beneath it. Gibbons Spec J25a(s), priced in the latest, 2011, QV Volume 1 at £800. An excellent example of this attractive unissued design. 4d SG66 (7bars), 6d SG70 (8bars) and 1/- SG72 (7bars) with the Rideout Number 1 Machine. The 4d and 6d are very fine and the 1/- has toned perfs but very rare with this cancellation. The 4d and 6d values are seldom found with any of these cancellations. 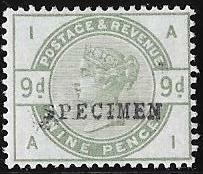 it is also shows the perforation variety ‘short ‘A’ row’. A superb and rare trio which displays well. 152209. 4d SG66, very fine used with Rideout Number 2 Machine cancellation. Seldom found on values other than the contemporary 1d. numeral and dater with code CR for May 30th 1859. 152210. 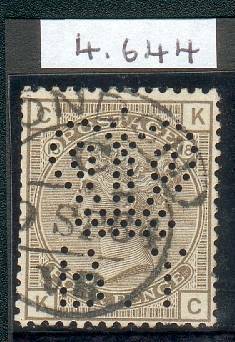 6d 70 very fine used with the Number 2 Machine numeral. 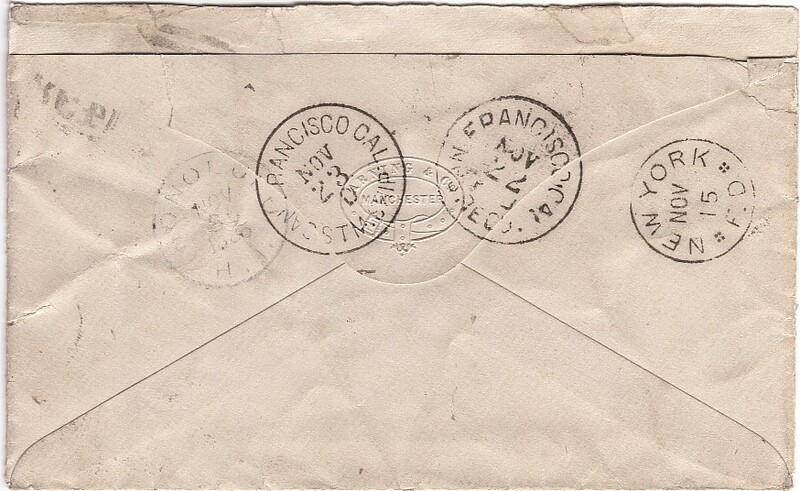 the side margin of the pair overlaps on to the back of the envelope. by EALING cds's for December 18th 1896. 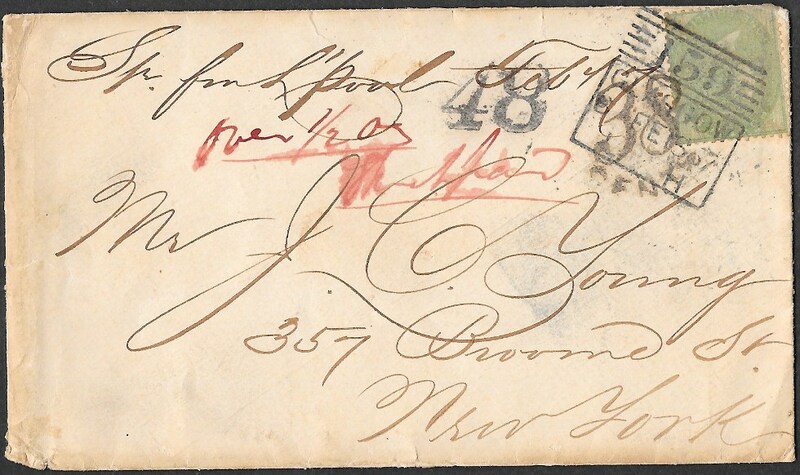 No postal markings on the reverse and the marginal rule with some damage/wear. A scarce and attractive item in superb condition which would Display well. 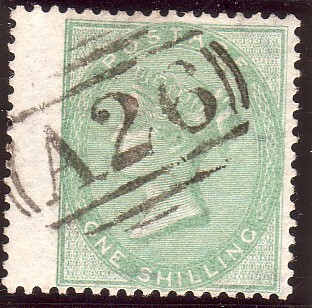 side margin overlaps onto the reverse side, and with a 1/2d SG197. Tied to a piece by EALING squared circles for December 11th 1896.
at Ealing, two types of cancellers were being used. The next item shows a third type. 152146. 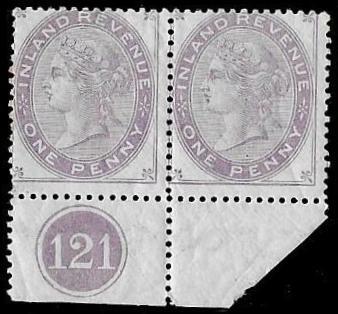 1d lilac Die 2 fine Control V pair, perforated margin: the side margin overlaps on to the reverse. 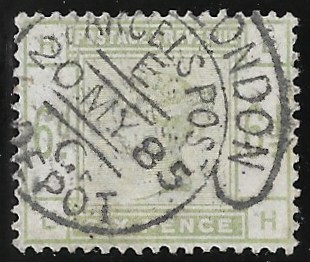 Cancelled by EALING double ring date stamps for July 29th 1898. 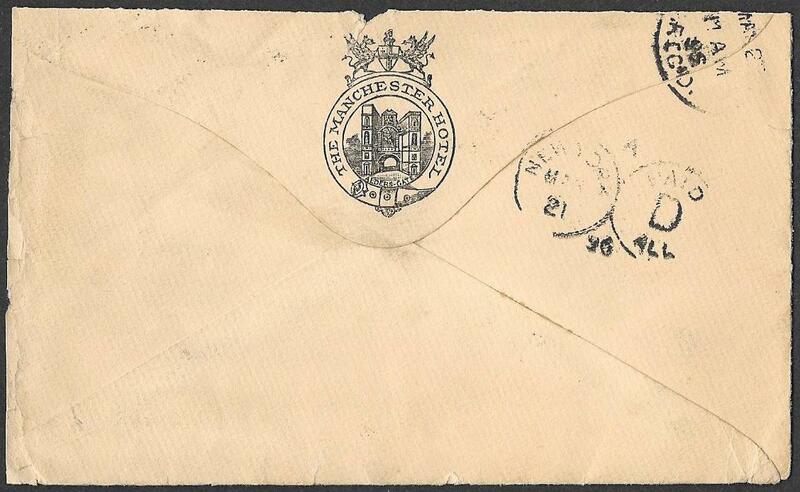 On a clean and uncreased envelope to Colchester with no postal markings on the reverse. NB: the apparent browning is not present - a trick of the scanner. and also illustrates different types of Ealing cancellers. 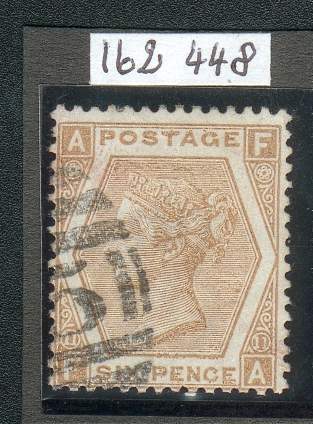 6d SG69: a very rare pre-printing crease. 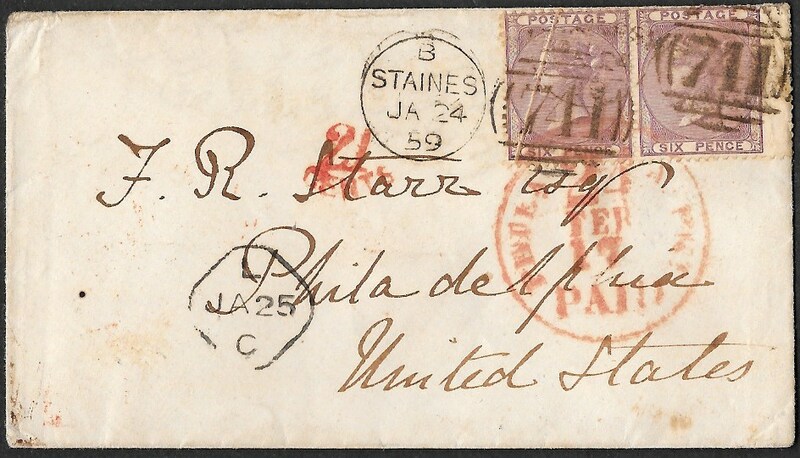 a scarce pair in a scarce shade on a small envelope to the USA and tied by a STAINES duplex for January 24th 1859. 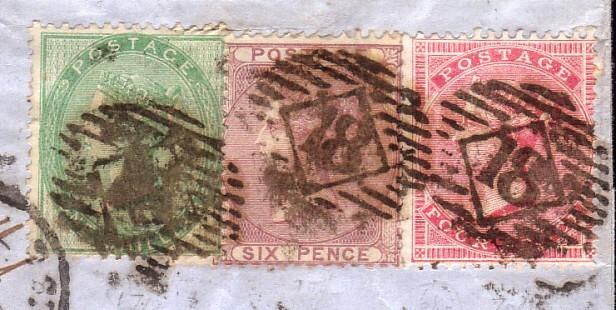 The top perfs on the right hand stamp have been worn by being so close to the edge of the envelope. The left hand stamp has a pre- printing paper crease that touches part of the Queen's head and face. 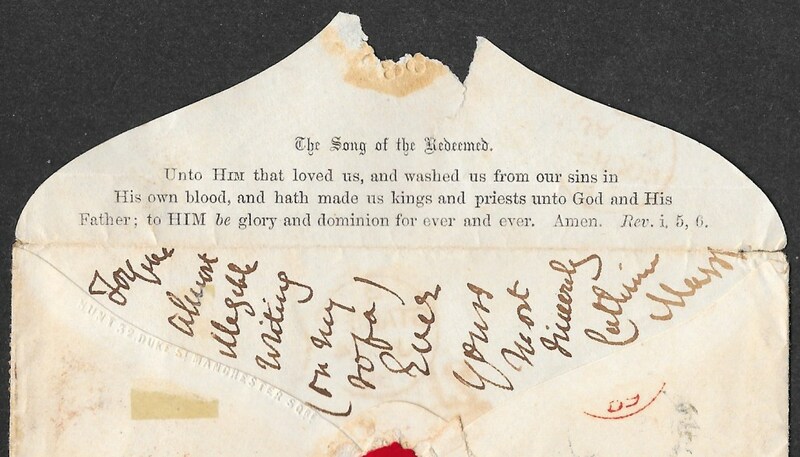 On the inside flap unusually is printed 'The Song of the Redeemed' and a signed handwritten message. and cannot recall one on any other surface printed stamp. An attractive and unusual item that would make an interesting Display. NB: An estimated Gibbons price for a SINGLE SG69 on cover is £380. which left Liverpool on January 29th 1859 and arrived in Boston on February 16th 1859. 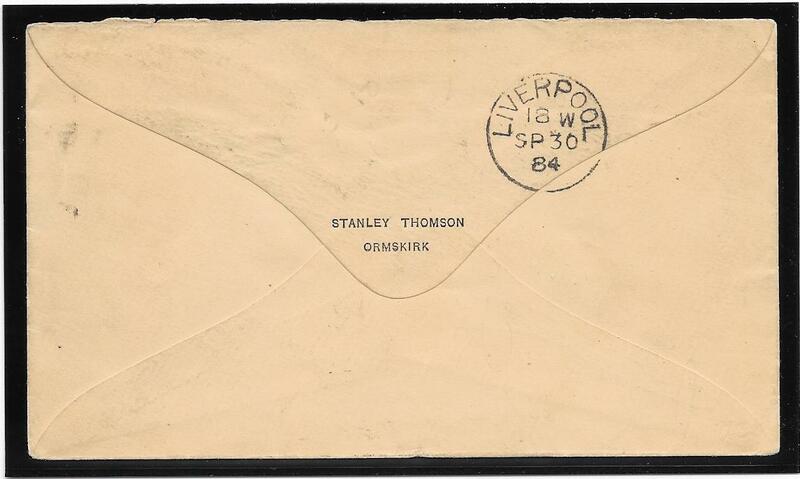 On the front of the envelope is a Liverpool receiving date for January 25th being a type used on transatlantic mail. The letter would have been retained until the next sailing to the USA ie by the 'America'. very fine/superb used strip of three tied to small piece by MALTA duplexes. cancellation leaves QV’s Head almost completely clear. This error is priced by Gibbons at £8,000. and also believed to be the only used multiple extant with this watermark variety. Stamp ‘TG’ is cancelled by the Malta cds and ‘TH’ lightly cancelled. An Exhibition Quality item of significant rarity. 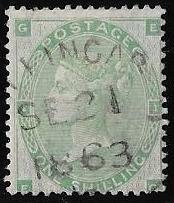 a single used example of SG84d, with a Scottish duplex cancellation, for £8,000. 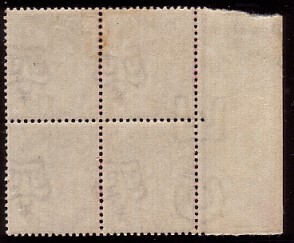 two rejoined horizontal blocks of EIGHT and a bottom marginal inscriptional strip of FOUR. 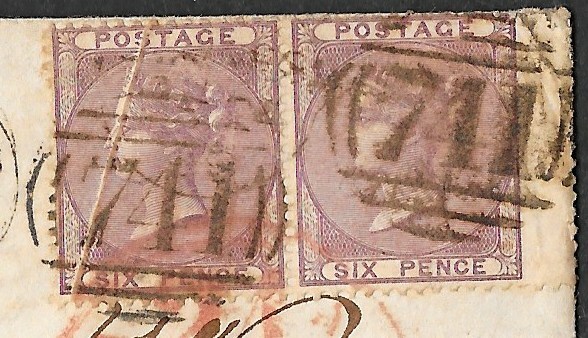 A corner fault on ‘HA’ and each stamp is pen cancelled and clearly all were attached to the same item. 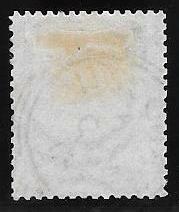 No gum with some ink markings on the reverse from the surface to which it was originally affixed. record the largest used block of 3d plate 8 to be one of 8 – two are known. For some other surface printed values they quote rejoined blocks as the largest known. This is the largest such multiple we have seen of this 3d value; we cannot recall seeing even a block of 4 pen cancelled. A block of 4 in this plate is priced by Gibbons at £425. Very fine colour and more than likely to be the largest pen cancelled multiple extant of any surface printed issue. A remarkable and significant rarity of Exhibition Quality and Importance. otherwise a fine lightly cancelled example of this shade on lightly blued paper. Priced by Gibbons at £450. 152186. 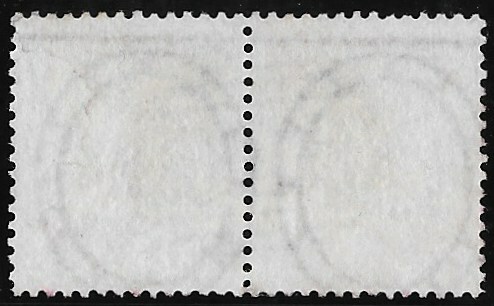 4d SG62e: a pair printed on white paper. 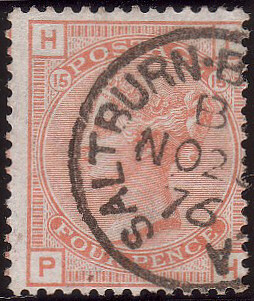 Newcastle - on - Tyne sideways duplex for October 1855.
the right hand stamp one short perf at the top and a clear QV profile. not adding sufficient 'prussiate of potash' to the pulp. A rare variety, priced by Gibbons at £1100 for a single example. and from our researches we cannot trace another pair. Highly glazed paper and in a Deep Bright Carmine shade. A very rare multiple the scan of which does not do it justice. 152189. 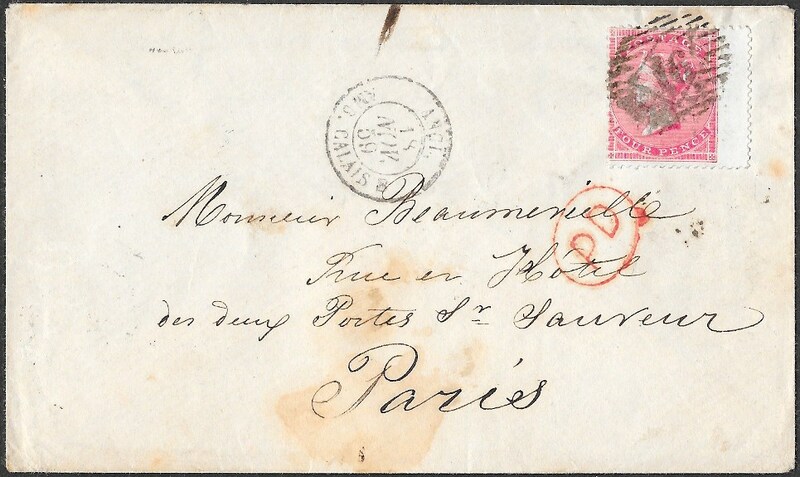 4d SG66, fine wing margin example on an envelope to Paris, November 1859. 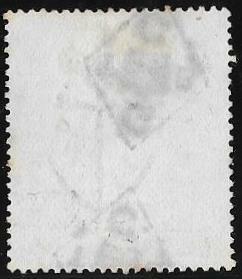 Tied by a London 16 in diamond and bars and with the variety: INVERTED WATERMARK. Gibbons prices a used SG66 with inverted watermark at £400 which means an estimated price on cover of £600. In our experience this is underpriced as this is the first example on cover we have been able to offer. NB: the brown marks on the front are less pronounced than in the scan. 152188. 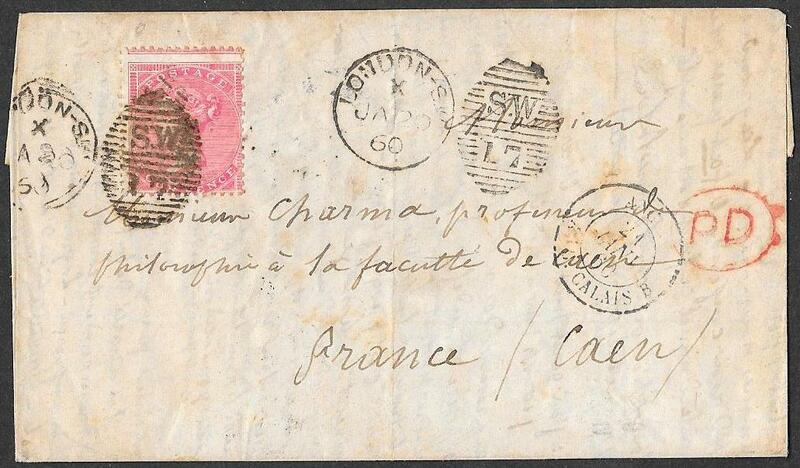 Piece to France with a fine 4d SG66 tied by a fine/very fine '72' Cresswell Machine duplex for November 16th 1857. The LPHG records this cancellation in use in November and December 1857: Code 10 is unrecorded by them. The use of this stamping machine ceased on December 31st 1857. This duplex is rarely found cancelling a value other than the contemporary 1d. This example and Item 152047 are the only ones we can recall with a contemporary surface printed value. A rare item which displays well. NB: the staining around the dater portion of the duplex is nowhere near as pronounced as in the scan. by the London CRESSWELL stamping machine impressions for Code 5 December 8th 1857. 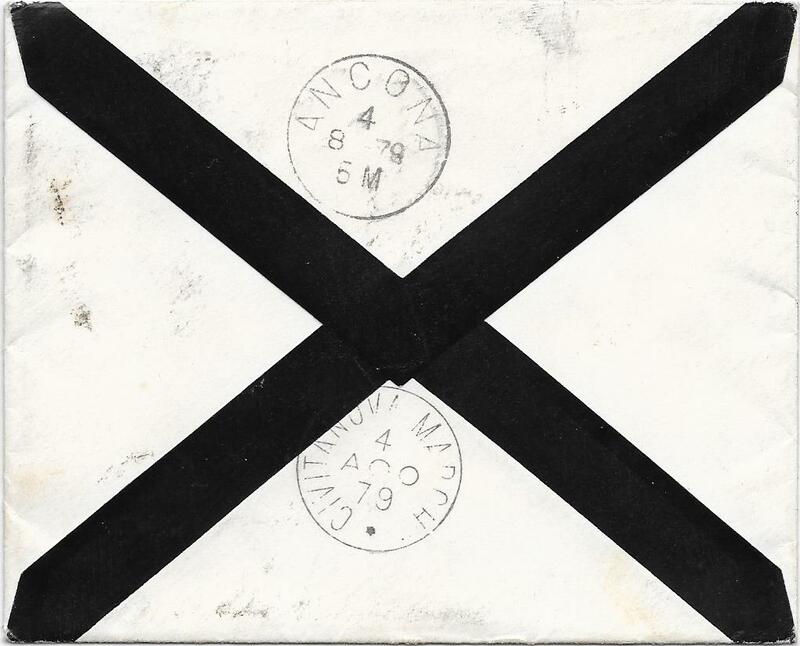 The envelope has on the front and back various non-overlapping transit marks. The Cresswell duplex is numeral '72' with the small,16mm, dater. This numeral duplex is only recorded in use only in November and December 1857 and Code 5 is unrecorded. The Cresswell duplexes are usually found on the contemporary 1d on cover. This example and Item 152188 are the only ones we can recall with a contemporary surface printed value. A multiple usage of such a value makes this a superb and attractive item. Very rare and of Exhibition quality. 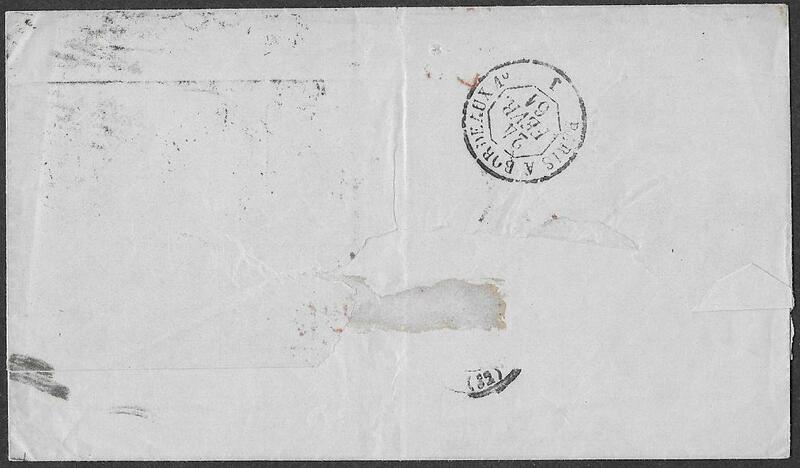 NB: the envelope is in much finer condition than the scan suggests. 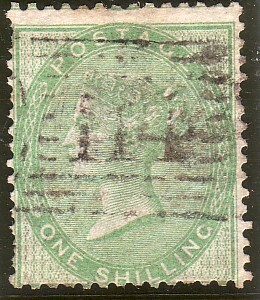 cancelled with a finely struck 1896 Edinburgh cds leaving a clear Queen’s profile. Excellent overall condition with possibly a very minor rub on the reverse in the top left corner. One of the finest we have seen for some time and the scan does not do it justice. Gibbons priced at £4,750 plus 75% for superb used. 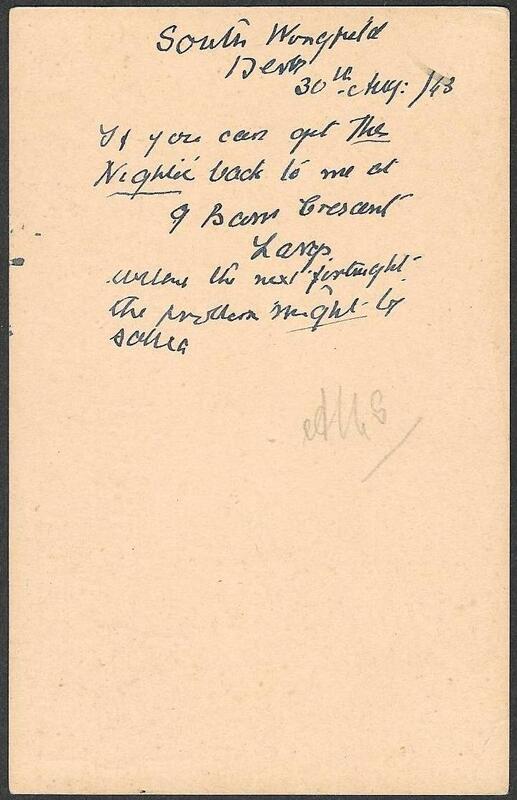 NB: there is NOT a crease under the cancellation as the scan may be suggesting: it is the watermark. 152144. 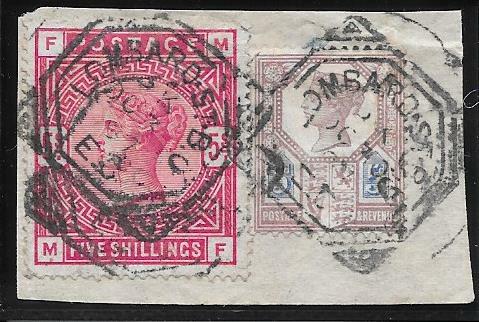 6d SG70 and 4d SG79 on a clean and fine commercial Registered Letter from London to Macclesfield. 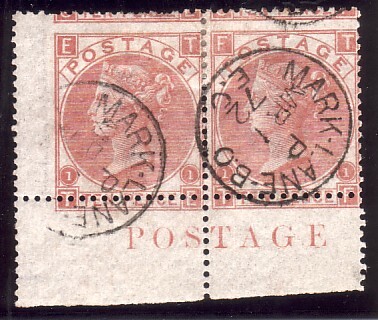 LOMBARD STREET Registered Letter strike Mckay fig 2191: a unique Lombard Street variety used in the 1860's. 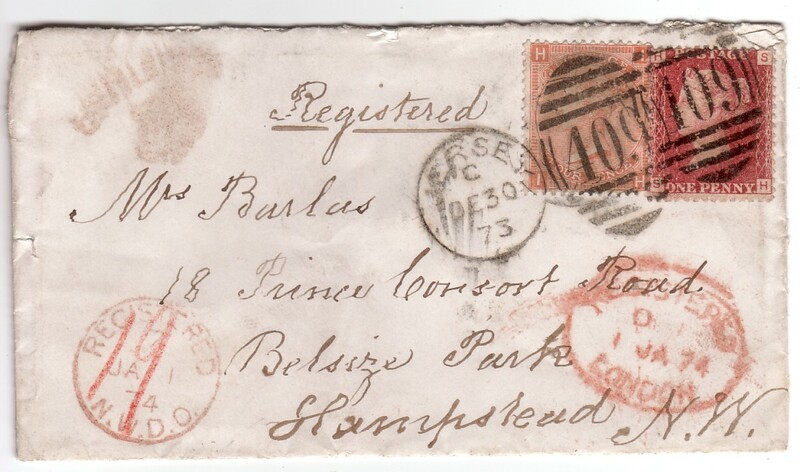 There is also on the front a London Registered oval for April 26th 1862. 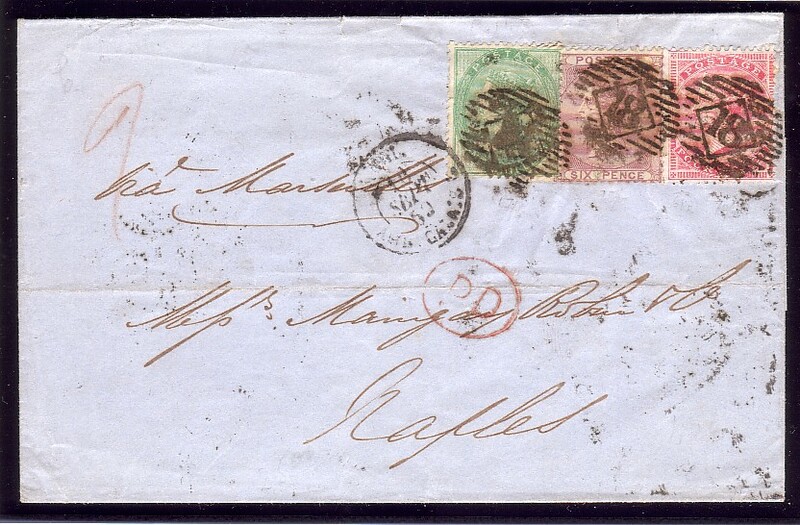 The 6d paid the registration and on the reverse is a Macclesfield cds for Sunday April 27th 1862. Some perfs of the 4d overlap with the 6d but no damage. Gibbons prices the 6d on cover at £240 and the 4d on cover at £300. 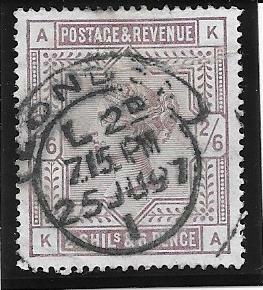 A rare internal UK usage of both stamps. 152145. 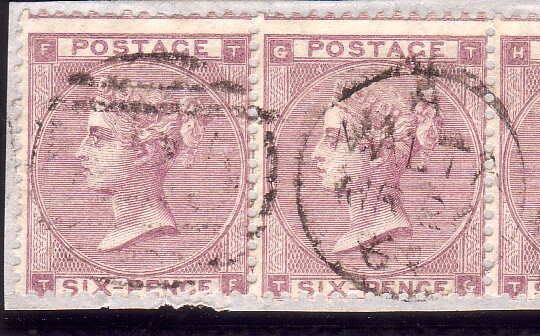 6d SG96 plate 6, 'SA-SB'. 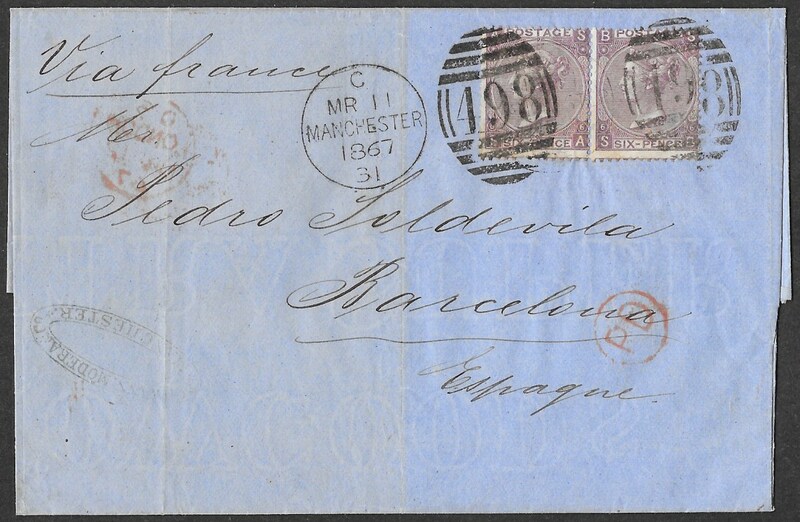 Fine used PAIR, in the scarcer deep lilac shade: on a wrapper from MANCHESTER to Barcelona, March 11th 1867. 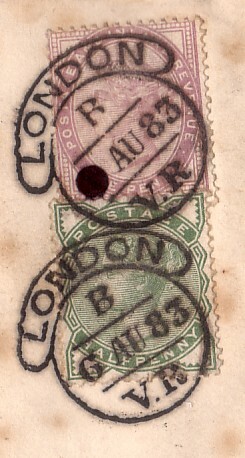 London and Spanish transit marks on reverse. 'SB' has an unusual inclusion/adherence to the plate, present before printing, below the bottom of QV's head. 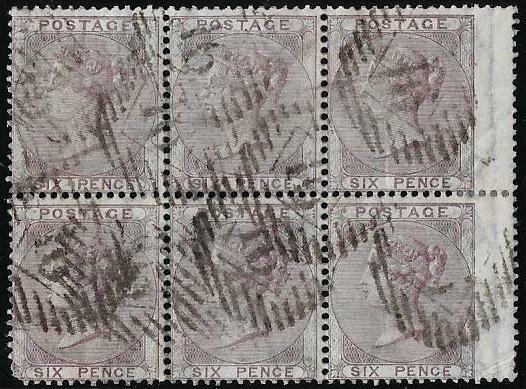 Gibbons prices a SINGLE 6d SG96 on cover at £350: difficult stamp to fine in multiples especially on cover. 152137. 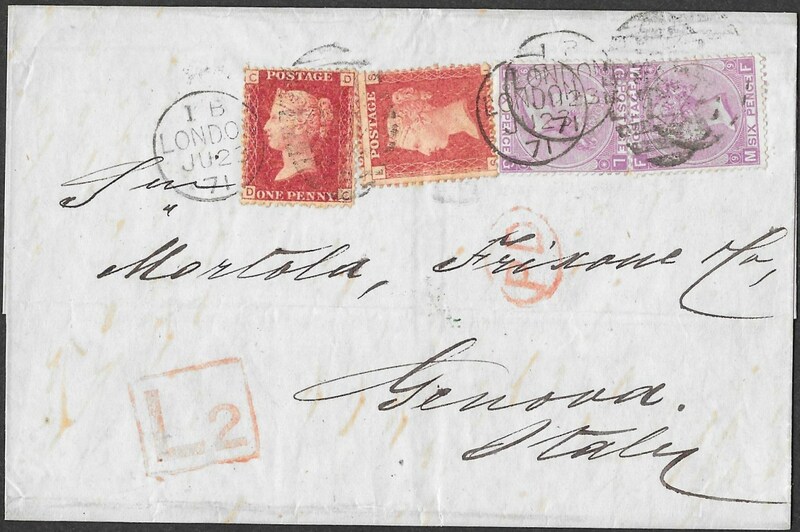 Two fine 6d SG108 Plate 9 on wrapper to GENOA from London, June 23rd 1871. 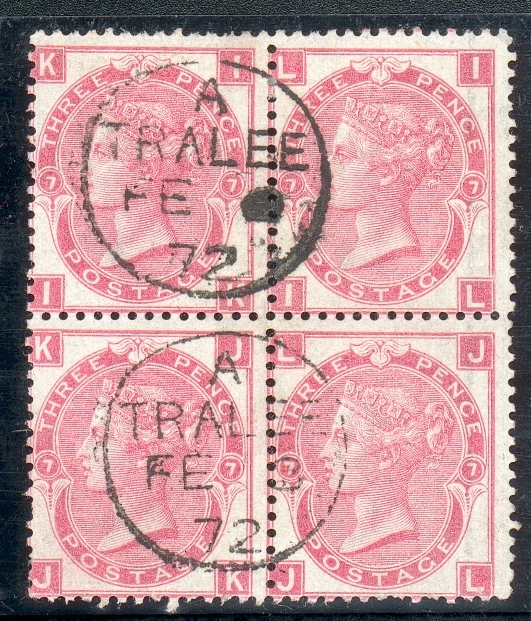 A LATE FEE 2d, Boxed L2 in red, has been paid by two 1d's from different plates. 'SL' is plate 139, virtually a totally clear QV head with 'DC' from plate 143: both are from scarce plates. Unusually the two 6d's have been affixed in a 'tete beche' orientation. Gibbons prices a SINGLE 6d plate 9 on cover at £140. A very fine item with an attractive and scarce combination of features . 152090. 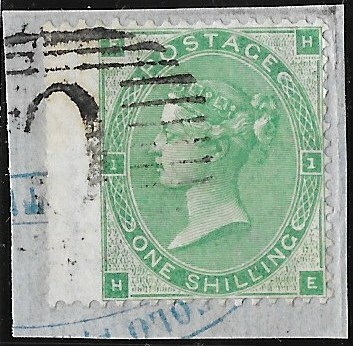 A very fine used 4d SG66 cancelled by a superb strike of the Pearson Hill Second Trial Machine. Code A was Afternoon Duty and the date at October 5th 1857 is an early usage as the EKD is September 21st 1857. This cancellation is usually found on the contemorary 1d and is rare on any other value. the other was on a cover, December 1857, and offered by a specialist dealer at £4,000 in 2011. 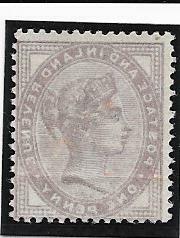 On this stamp alone, it is extremely rare and the example offered here is of Exhibition quality and importance. NB: More examples of Trial Machine Cancellations in that Section on the Homepage. a fine used example cancelled only by FOUR Inspector marks. This is the most such marks we have seen on a single stamp. 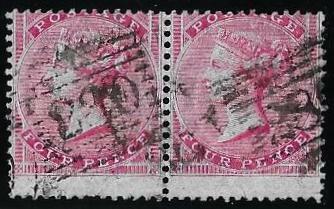 Spec J79d 'Figure 11 on left damaged (stamp NF)' which Gibbons prices at £400. The scan does not do justice to the variety. Invalid usage of 1d lilacs. 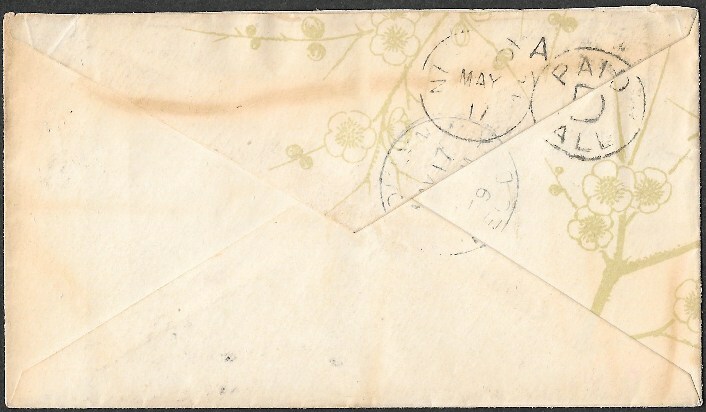 wavy line machine cancel for April 20th 1922: no postal markings on reverse. 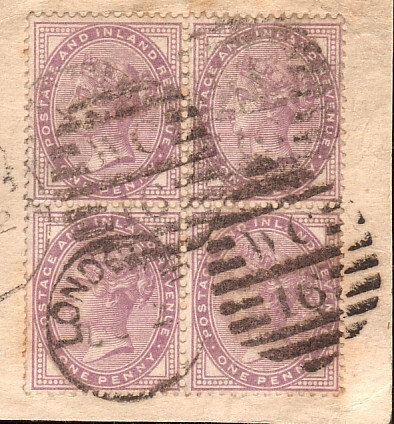 The 1d lilac had been demonitised by 1915 so the these stamps after that date were invalid to pay postage. There is no surcharge so this item got through the postal system unchallenged. 152097. 1d UPU card sent from ALFRETON Derby to Shrewsbury and cancelled by an Alfreton machine for August 31st 1963.
with what appears to be the initials of the sender or the recipient. This postcard was demonitised in 1915 and should have been surcharged but it was not. which got through the system without a surcharge, that we have seen. A rare item which would display well. 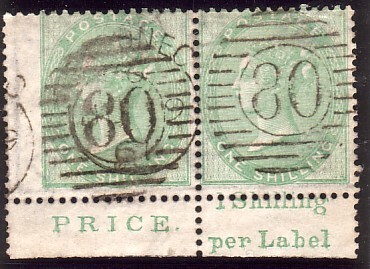 The next two items are examples of very early receipt stamps postally used. are the only examples used in this way that we have seen. 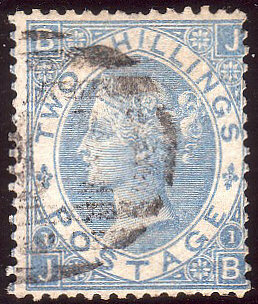 1d SG F3, pale tourquoise-blue printed on grey paper tied to a clean, neat envelope to Penkridge by a fine Stafford duplex for March 7th 1898. This stamp was originally issued in December 1853 for usage on receipts but mint examples became postally valid in June 1881. 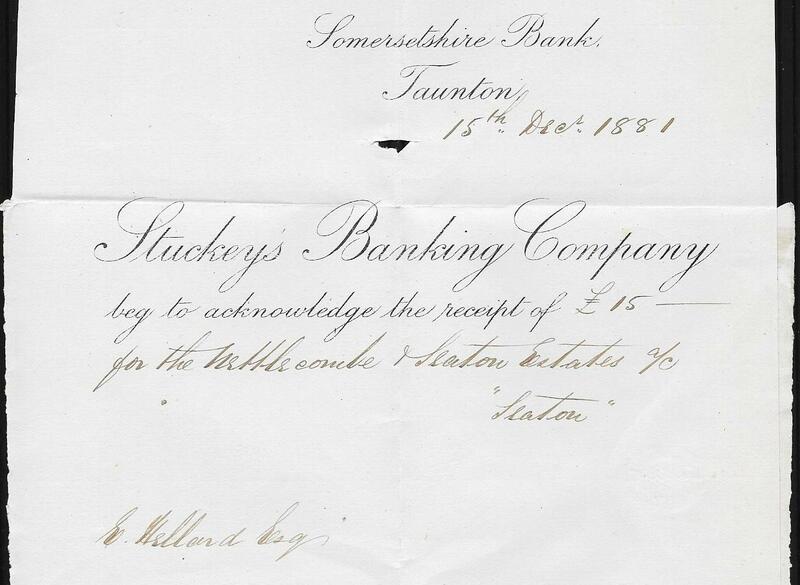 This example has been used on a receipt in 1855 and the original pen cancellation can be seen under the postal franking. Hence this stamp has been reused and as such is postally invalid but it got through the system without a surcharge. 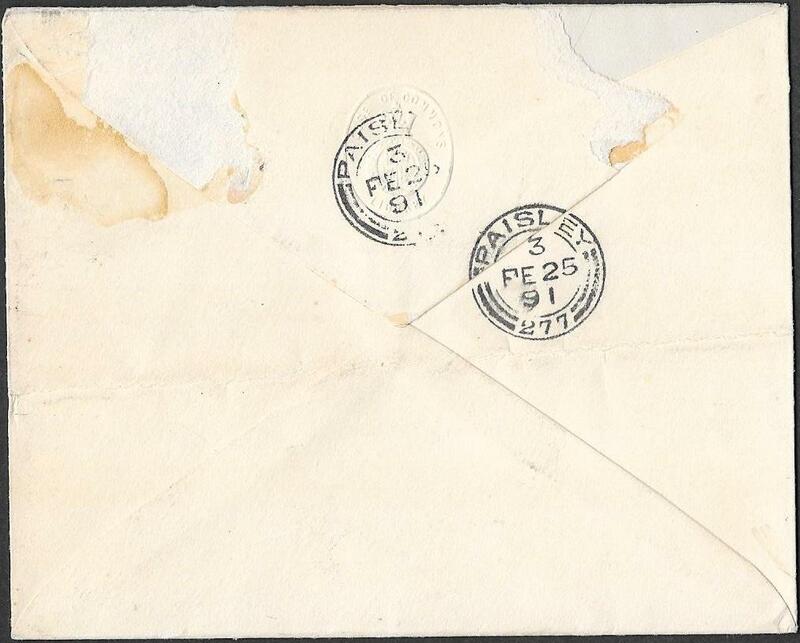 The envelope has a peripheral tear at the right on the front only which affects the stamp. 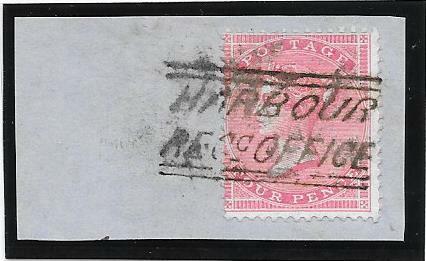 Despite the fault, this is a very rare rare fraudulent usage of this stamp which Gibbons prices on cover at £350 for a valid use. Likely a unique usage of this stamp. peripheral age marks are also fainter than the scan suggests. 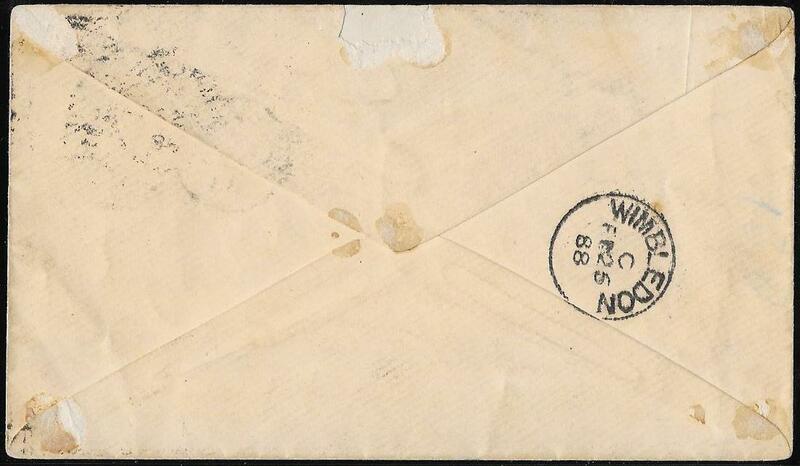 There are no postal markings on the reverse of the envelope. Very fine 1d SG F4, light blue printed on blue paper. 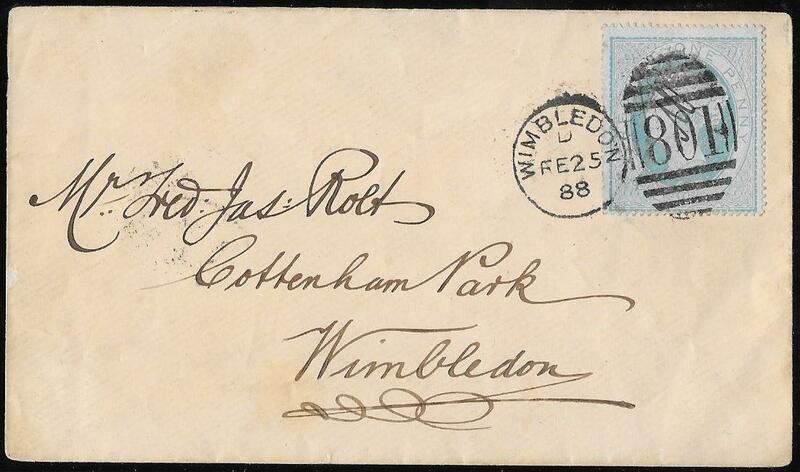 Tied to a neat envelope used locally in Wimbledon by a very fine Wimbledon duplex for February 25th 1888. This stamp was originally issued in December 1853 for usage on receipts but mint examples became valid for postal use in June 1881. 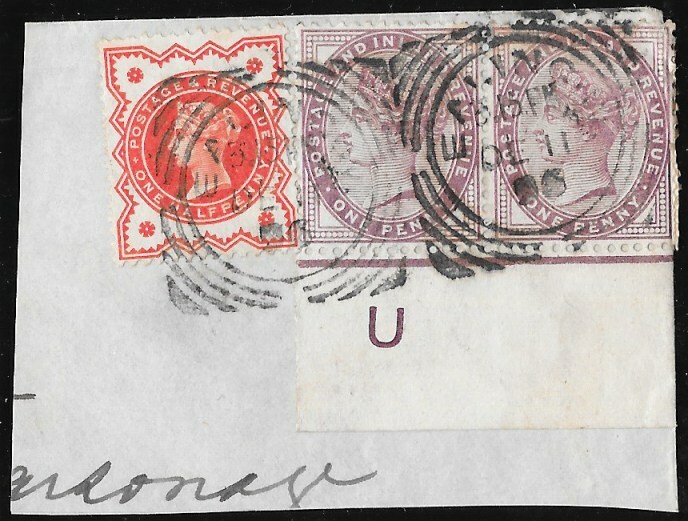 This example has been used on a receipt and the original pen cancellation can be seen under the postal franking. date stamp on the reverse for February 26th 1888. NB: the brown area near the bottom of the address is a trick of the scanner. This item and 152082 would make an excellent display pairing. by a very fine TAUNTON squared circle for DECEMBER 15th 1881 with a Stogumber receiving cds for the following day on the reverse. 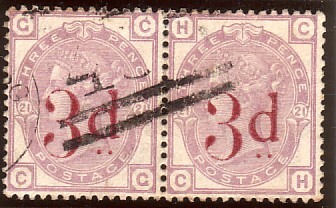 1d lilac Die 2 was issued on December 13th 1881 and the example offered here is used on the THIRD day of usage after issue. 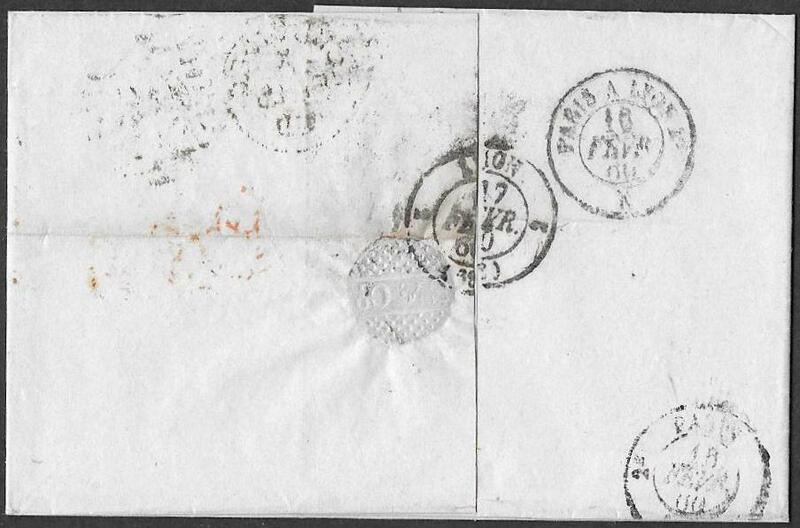 This is the earliest usage we have seen, or can find from our researches, either on stamp alone or on cover. 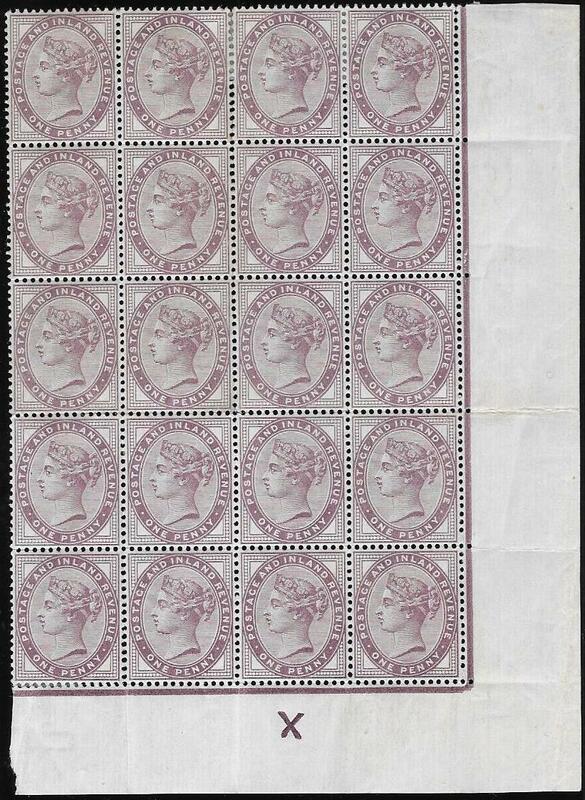 used on cover on its day of issue, July 12th 1881, at £10,000. NO example for the day of issue of Die 2 is recorded by him. The example offered here used on only the third day after issue, is a rarity and would make a very fine Exhibition item. 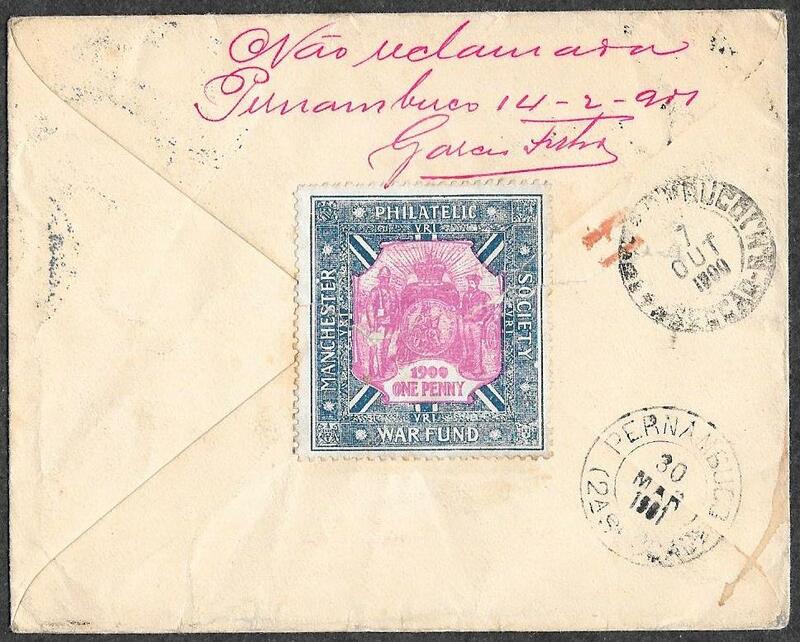 Rare early usage of 1d lilac die 2 on an interesting envelope. addressed to a Post Office in New York. Registered Dublin hexagonal date stamp for December 23rd 1881 on reverse. 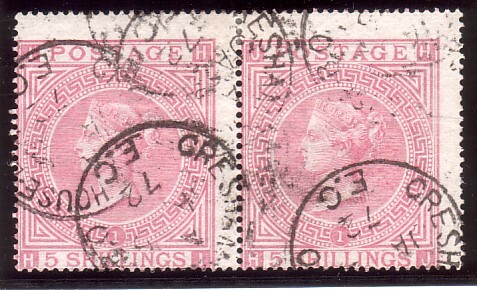 The postage and registration fee paid by a vertical pair of 2 1/2d plate 22, SG 157 and a vertical pair of 1d lilac die 2. 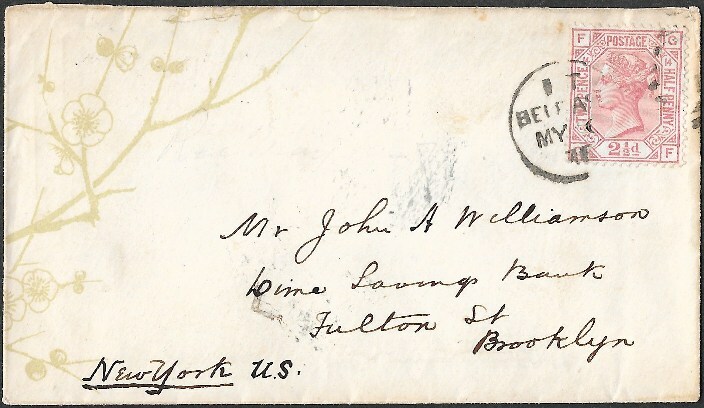 Letter received in New York January 7th 1882. The letter mentions that it contains TWENTY POUNDS: at least £1,000, if not more, in today's money. and then 'Post Office to be called for, State of New York'. 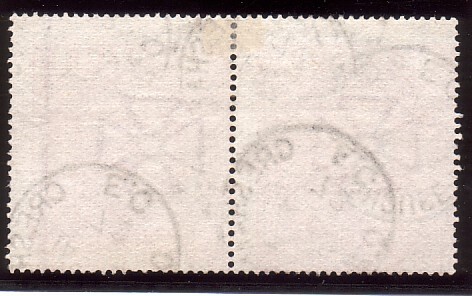 triangular date stamps for December 5th 1882, eleven months after the letter was received at the New York Post Office. No return address on the reverse so presumably the Postal Authorities opened the letter by removing the central seals. The name and address in the letter are not very clear so one hopes the money was returned safely to the sender. 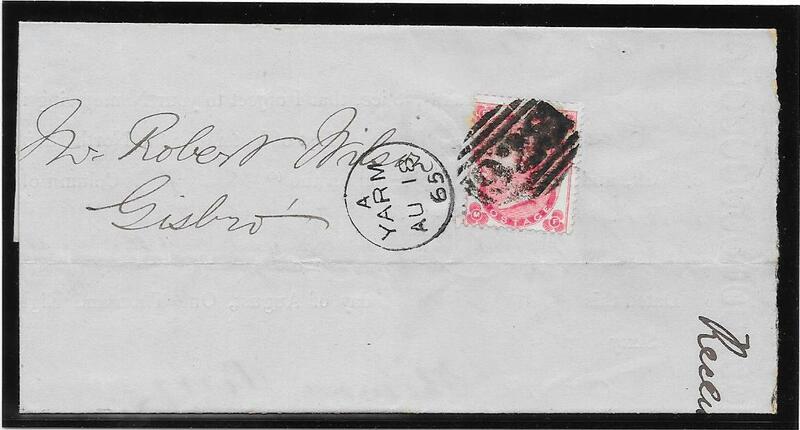 was issued on December 13th 1881 and this pair used on December 22nd 1881.
it is likely to be the earliest known usage of die 2 on a registered envelope. 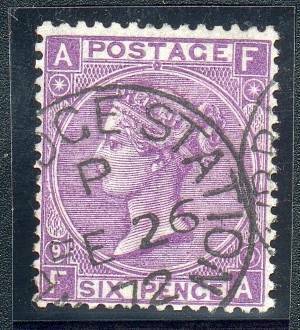 The 1d lilac is from the early printings and in a shade close to or at the scarce bluish lilac, SG172a. A remarkable item, full of character, that would make a memorable and fascinating display page. NB: the scan does not show the 1d lilac shade at all well. 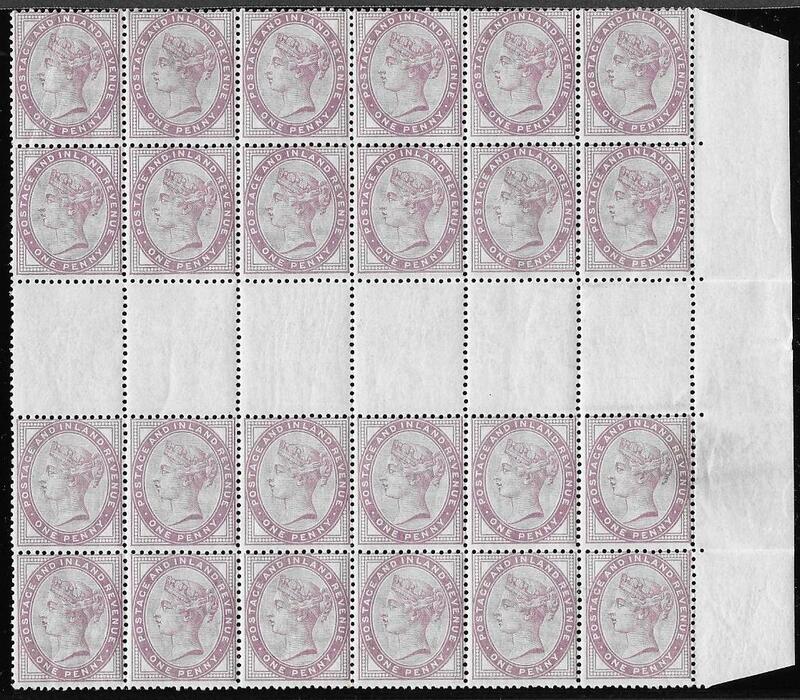 See an earlier Item in this Section,152064, for a 1d lilac Die 2 used on an entire on December 15th 1881.
and a 'block of three', 1d bluish lilac, SG172a. 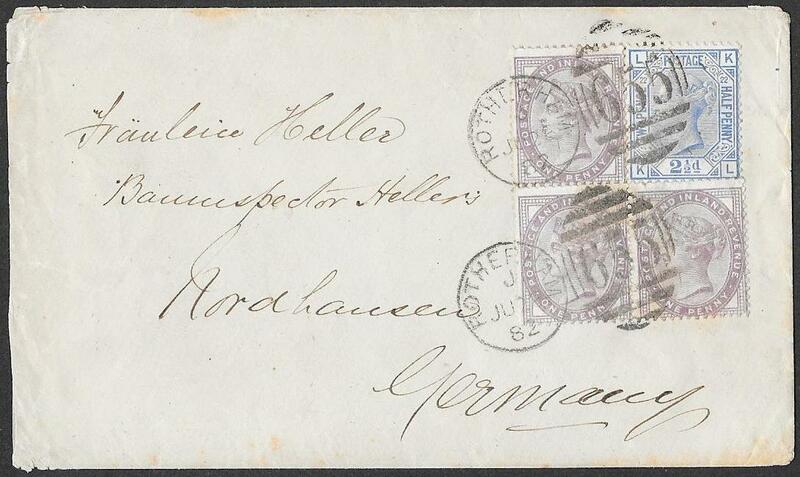 on the reverse for Nordhausen, June 30th 1882. The shade of the 1d lilac confirmed by a 1994 Certificate. A single 1d lilac in this shade priced by Gibbons at £140 on a stamp alone: no cover price is quoted. A rare franking of this difficult stamp. NB: the browning at the envelope edges is very much fainter than the scan. 152057. 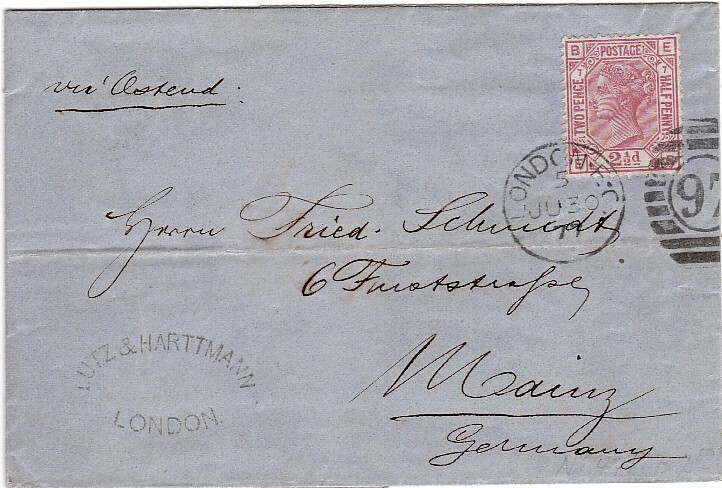 SG141 Plate 16 and 1d Plate 196 tied by a Charing Cross Duplex, January 10th 1880, to a superb mourning envelope to Stuttgart. 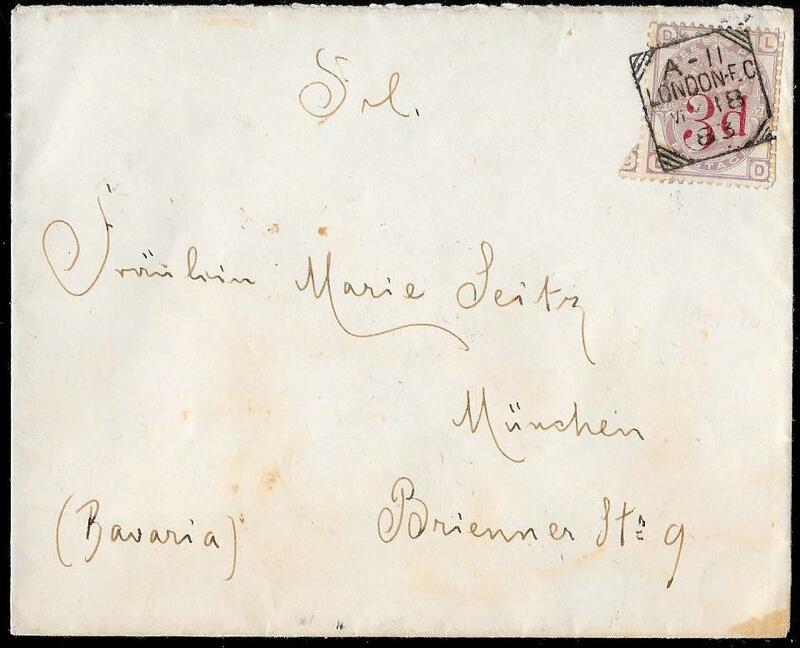 Addressed to The Count of Tauffkirchen: he was a Bavarian Diplomat and more information is available on the internet. 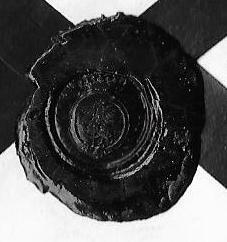 On the reverse is a wax seal with a Crowned Eagle and this may have originated from a German Embassy. this is illustrated by Parmenter in 'London Late Fee and Too Late Mail'. This strike used in the West Central Charing Cross Branch Office: rated Very Rare and recorded in use from 26 January 1874 to 22 July 1878. However the example offered here is dated January 10th 1880, about 18 months later, so it may be an isolated strike. A rare and attractive item of Exhibition quality. 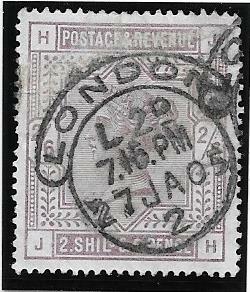 by the London '38' duplex with indented sides, Code W, September 18th 1855. Parmenter in 'London Late Fee and Too Late Mail' casts some doubt on this usage. there is no indication of a late fee payment on the letter, its usage supports Parmenter's comment. 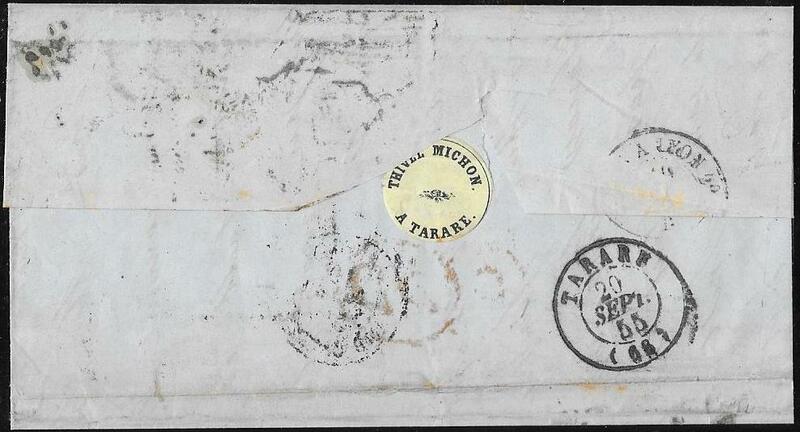 On the reverse is a paper seal: 'THIVEL MICHON A TARARE'. This cancellation is rarely found on cover with a value other than the contemporary 1d. with the first 4d surface printed value is an extremely rare item. NB: Gibbons prices SG62 on cover at £750 with an 'ordinary' cancellation. the only example we can recall seeing with a contemporary surface printed value. A multiple usage of such a value makes this superb and attractive item very rare indeed. 152051. 4d SG66, fine/very fine used, cancelled by a large part cds and part bars of the RIDEOUT first trial, Number 1 Machine. From the date, April 16th 1859, this has seven bars at the top: recorded in use from Feb 4th 1858 to 14th Oct 1859. The code normally used in this period was 'HS' but this example has the code REVERSED ie 'SH'. 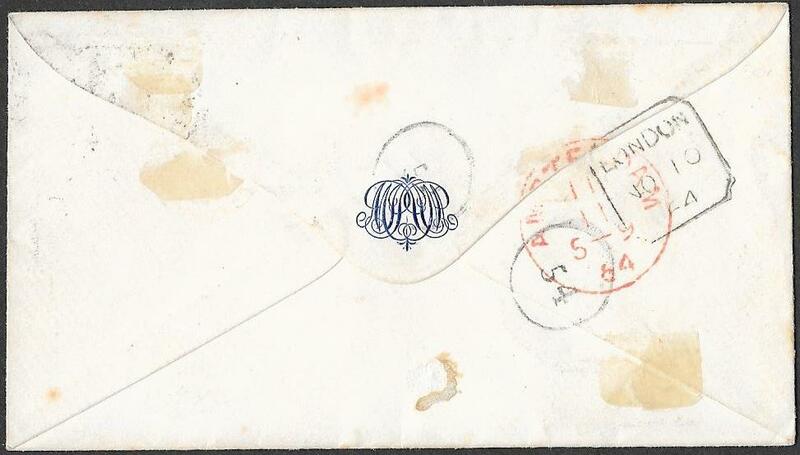 and by Parmenter in 'Early Experimental and Inland Branch Duplex Cancellations'. and that is the one in Parmenter's publication. is the only known reversed code on a surface printed value. 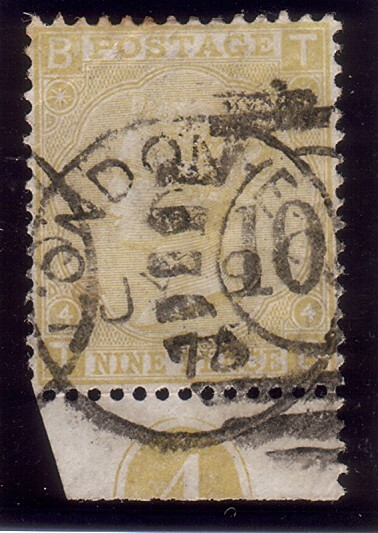 NB: the Number 1 Machine with 8 bars at the top is known used with the 'SH' code but only on April 21st 1858.
a front and part back with an unrecorded date of usage, October 1859, of the reversed 'SH' code. 1PH2DieA cancellation, February 23rd 1861: recorded from October 3rd 1860.
first we have seen on this 6d value. superb and rare early type of London EC squared circle for May 18th 1883.
as with our own Royal Family's letters, that the personal letter was sent from a member of a Royal Family. Gibbons prices SG159 at £450 on cover before 100% is added for the dated cancellation. A rare and attractive item with a unique combination of features. NB: the envelope is far cleaner than the scan suggests. We have not seen this early experimental cancellation used on this stamp alone or on cover. 15192. 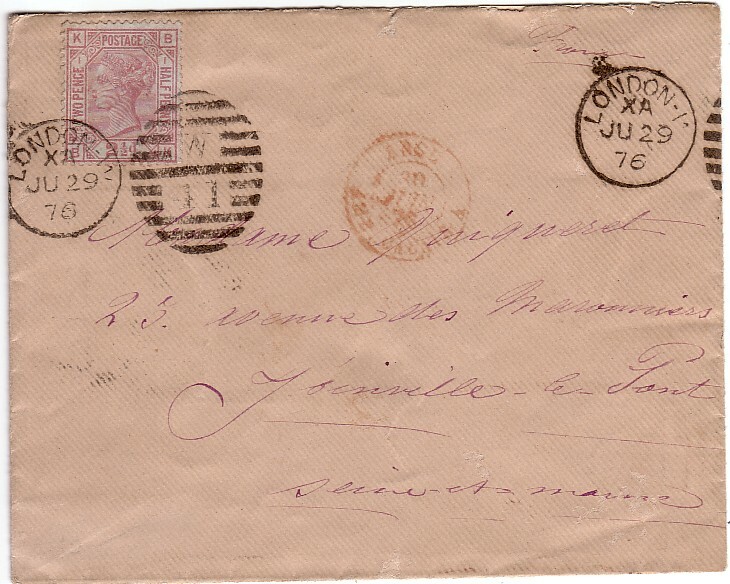 2d plate 22, SG157: fine used on a wrapper from London to St Malo, France, June 1882.
with a similar date stamp on the reverse top flap as an arrival date stamp. via the Channel Islands, and cancelled on arrival in St Malo. St Malo cds, this is the first we have been able to offer on cover. 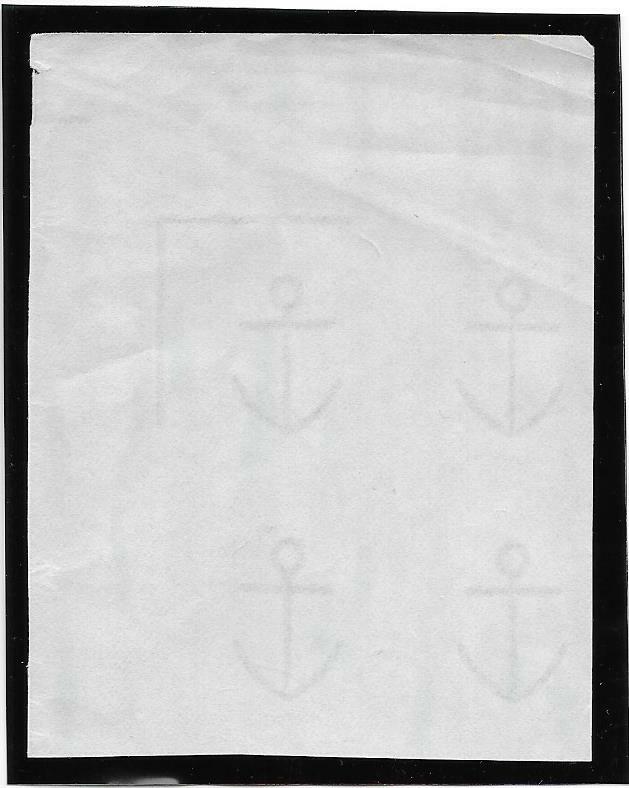 NB: the wrapper is complete and NOT trimmed at the right as the scan suggests. 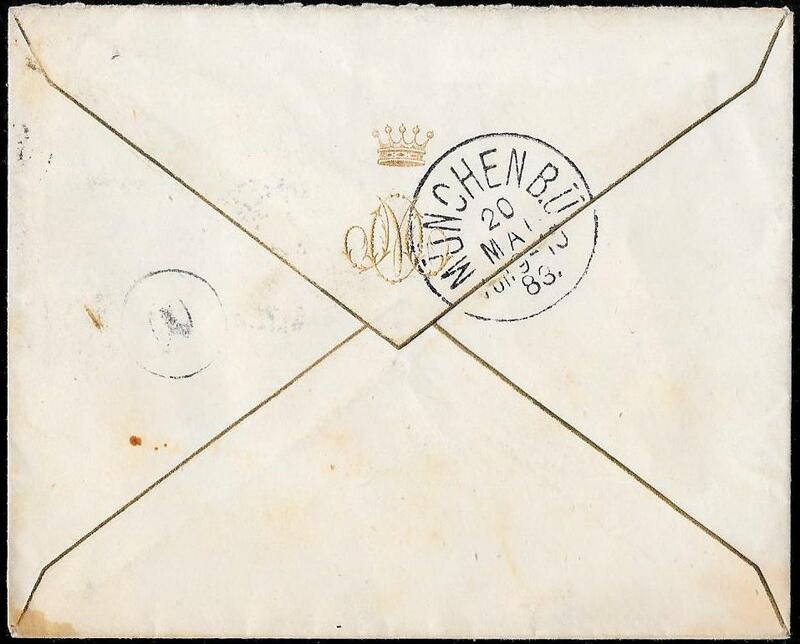 used on a registered letter to Reichenbach, Saxony from Bradford, Yorkshire, August 11th 1885. The stamps are cancelled by a dumb canceller and there is a Reichenbach receiving cds on the reverse. The 9d, printed in highly fugitive ink, is very sensitive to moisture and light: the example here is in a fine green shade. 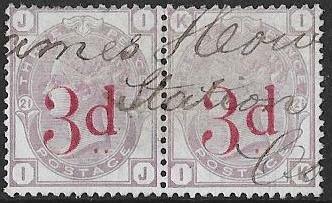 When the 9d was first sold from August 1st 1883, there was no postal need for this stamp other than on some heavy parcels. It could be used postally and a small number of examples are known. provides details and illustrations of only 8 examples, one of these is only a part front. The example offered here is not one listed by him. Moreover, only one of these has the 9d and a 1/2d stamp - on a registered cover to the USA, a correct rate. for a letter weighing between 1.5 and 2 ounces with 2d registration fee: no surcharge markings so it got through! Some minor wrinkling to the NE corner and this item is unrecorded by Brauers. The price by Gibbons, in the 2017 GB Concise Catalogue, is £4,750 for the 9d on cover and reflects its rarity. Hence this is a very rare item and the first we have been able to offer. NB: the envelope is cleaner than the scanned image. superb used block of 6 with ‘620’ numerals of Plymouth. 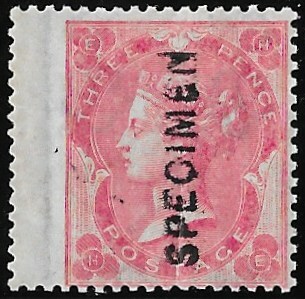 Large part of original gum and four stamps with a clear Queen’s profile. a block of six pro rata at £1,160. When the 125% premium added for the light cancellations this rises to £2,600. This is one of the finest used blocks we have seen and the finest we have been able to offer. A very rare and attractive multiple with a clear RPS Certificate. 151562. 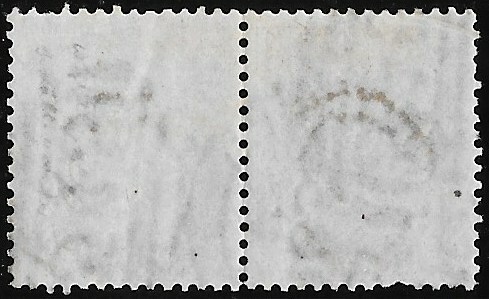 4d SG66: superb used pair with Inverted Watermark. 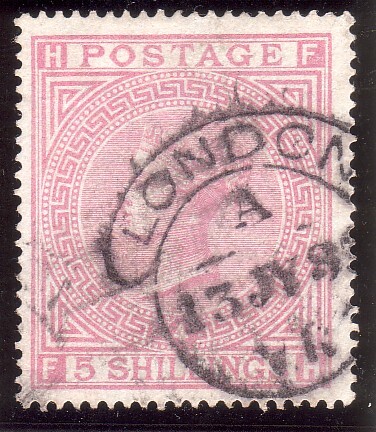 One stamp with a London cds for July 12th 1859. A rare multiple so fine with this watermark variety. Gibbons, SG66aWi, prices a single at £400 without the 125% premium for the cds example. Hence Gibbons price for this item is in excess of £1,000. Superb item and the finest we have seen. 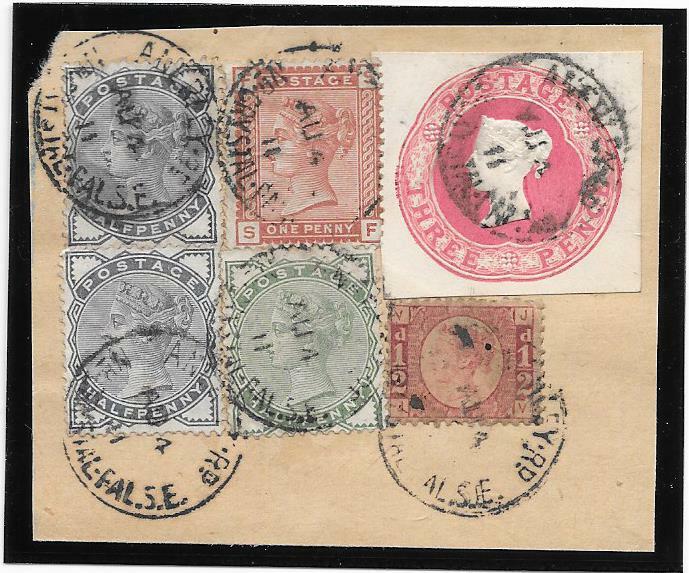 All are in fine condition with the 1/- overlapping the wing margined 6d. This example is the best with this combination of stamps we have been able to offer. 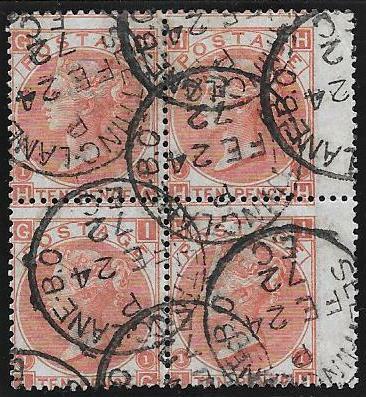 In the March 2018 Edition of the GB Journal, a detailed listing is given of the 39 covers known with this rare combination. 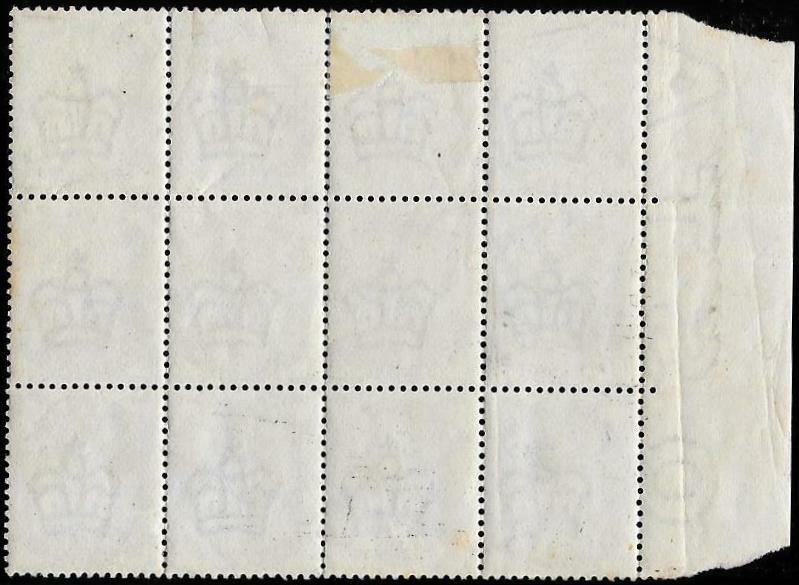 Of these only 19 are franked with just the three first surface printed values including the example offered here. A rare and fine item. with clear Certificate signed by Robson Lowe. thus allowing this distinctive shade to be seen to advantage. exceedingly rare by having an INVERTED watermark. for lightly used is well in excess of £10,000. First example we have seen in this shade with inverted watermark. A significant surface printed rarity. 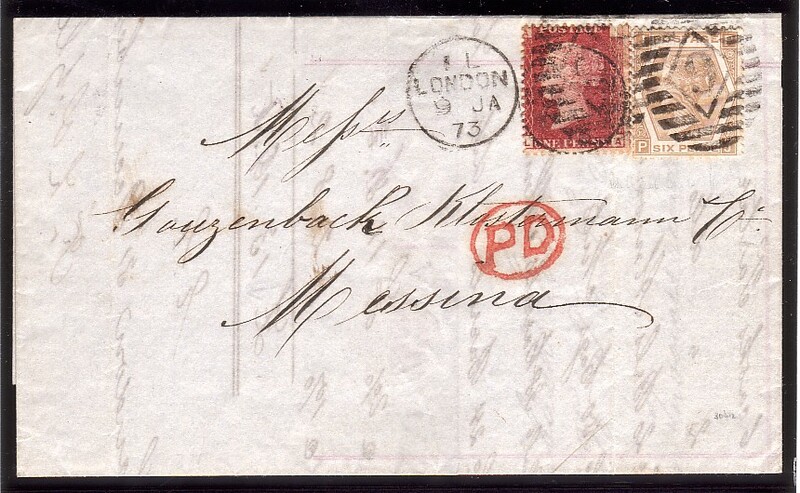 Messina from London, January 9th 1873, with a clear RPS certificate. Used in conjunction with a 1d plate 154 (very small fault). only a few examples known on full cover. grossly under priced from our experience. All these prices are without a premium for the cds’s. A truly remarkable and unique grouping showing the plate make up on this part of the Post Office sheet. ‘BE-CF’, ‘DE-EF’ and ‘CG-DH’ which they say are now mostly split. full deckle edge, overprinted ‘SPECIMEN’, with full original gum and appears unmounted. Very fine with the wmk emblems significantly displaced downwards and to the left. This has resulted in the guide line, and most of a rose emblem watermark, in the margin. Even on the issued 3d we cannot recall seeing part of the emblem watermark in the margin. Warrant number 208 in the top margin and the ONLY such example we have seen. and much underpriced for the example offered here. 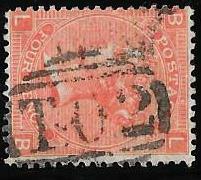 the adjacent stamp 'TB', with Plate Number attached to the bottom margin, was sold. The size of the right hand margin of 'TB' explains why 'TC' is 3-margined. 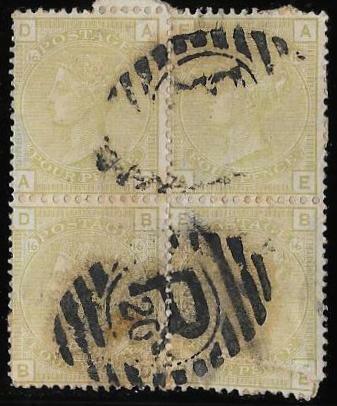 have been removed from the Imprimatur Sheet and of these 'AK-AL' with Plate Number is in the Royal Philatelic Collection. Gibbons prices an Imprimatur in this Plate at £4,000 in the QV Volume 1 Specialised Catalogue (2011). in our view and experience this rarity is significantly undervalued by them. 151569. 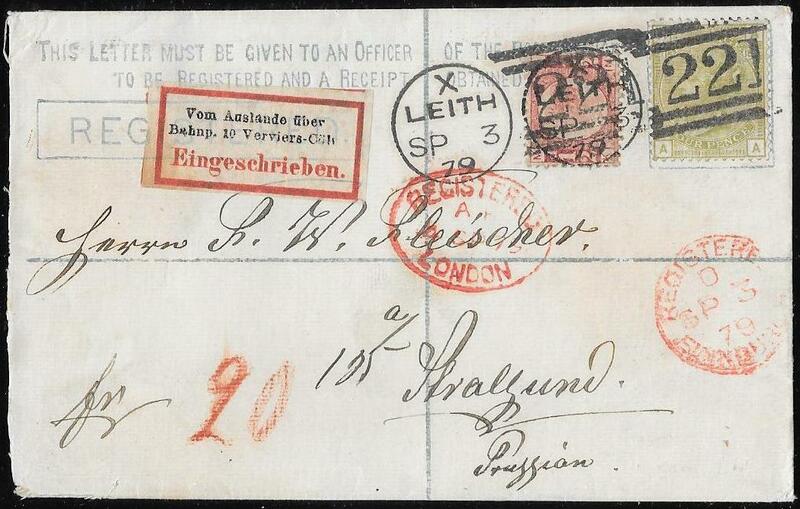 Very fine Registered Envelope from Leith to Prussia, September 3rd 1879. 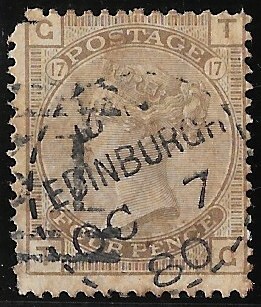 Leith duplex on the reverse cancelling the embossed ' Registered Two Pence' die. 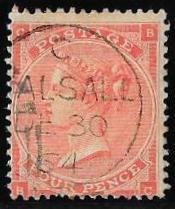 The unusual franking is made up of a bantam 1/2d and a 4d SG153, Plate 15, lettered 'AA'. The very fine 4d sage green - superb colour - shows the listed variety, Spec J64d: Stamp 'AA', 'Large '5' in '15'. 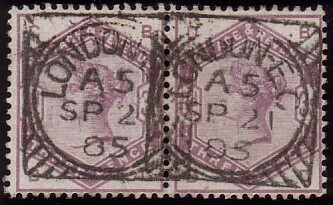 The cancellation leaves both plate numbers almost totally clear. 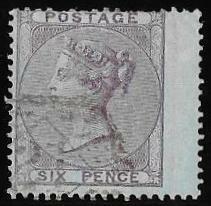 This variety priced by Gibbons in the latest, 2011, Edition of QV Volume 1 at £800 on a stamp not on cover. The estimated Gibbons price on cover is £1,500 plus. Although we have handled several of this variety, this is the ONLY example we have ever seen used on a cover. 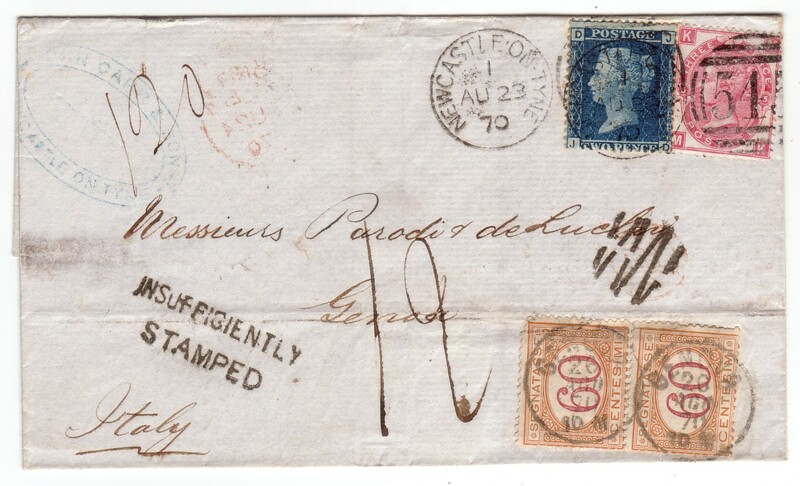 A very rare Exhibition quality item and likely to be a unique survivor with this variety on a registered envelope. and neither is it present on the reverse side: tricks of the scanner. SG115, Plate 5, ‘DH’, tied to small piece by overlapping Stock Exchange cds’s, July 26th 1872. 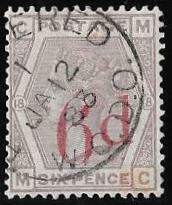 The double cancellation applied by the perpetrator to hide as much of the forged stamp as possible. 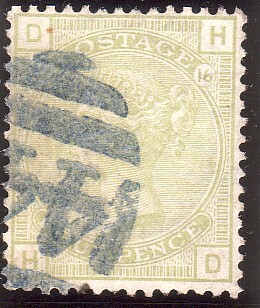 Offered with a genuine plate 5, ‘DH’, showing the genuine stamp had a wing margin as well as a watermark. Priced by Gibbons in the latest Edition, 2011, QV Volume 1, at £850. A very fine example of this historic forgery which remains an unsolved crime to this day. 1053. 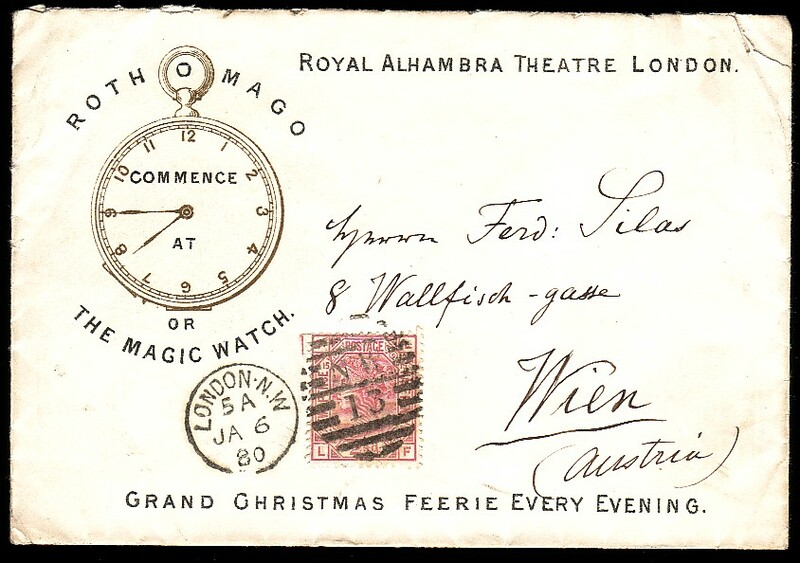 1880 Advertising Envelope, London to Vienna , January 6 1880. The Magic Watch’ with a golden pocket watch showing the time of the performance. fairy spectacular in 4 acts and 17 tableaux by H B Farnie. It opened on December 22 1879. 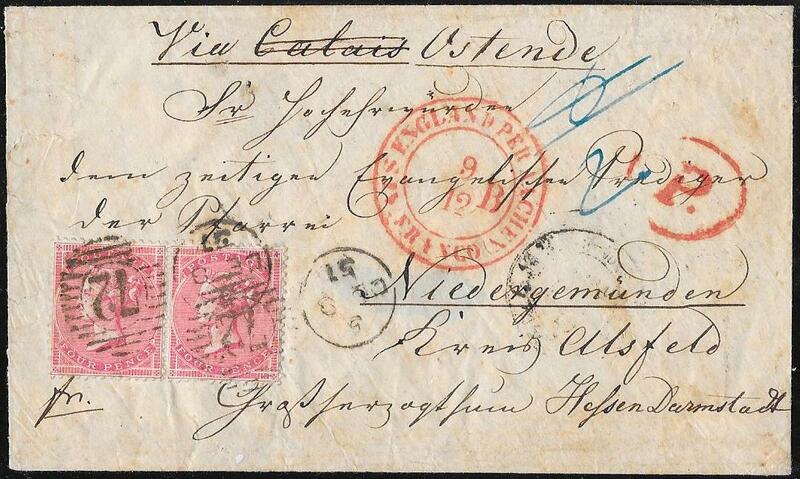 The 3d rate to Austria has been paid by a 3d plate 15 SG143. A superb and very rare item - probably one of few survivors especially to an overseas destination. 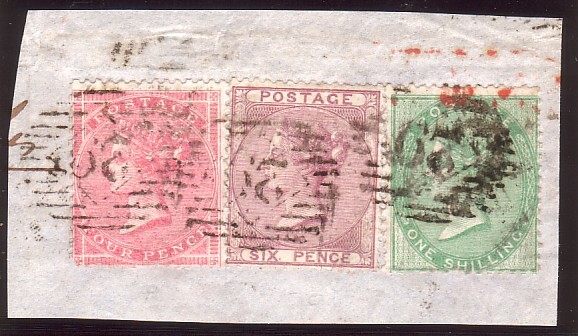 with the very scarce MANCHESTER ROLLER canceller across three of the stamps. On the fourth is the Irish numeral '147' of COALISLAND, Co. Tyrone. This was applied on the item of mail on receipt in Coalisland as the roller canceller had not fully cancelled 'PA'. namely to Bristol, Birmingham, Liverpool and Manchester and examples of them are all scarce. 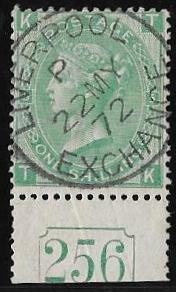 A combination of a scarce English roller cancellation and an Irish numeral that we have not previously seen. Gibbons prices a SINGLE SG101 at £275. Very rare/unique usages on a surface printed multiple. 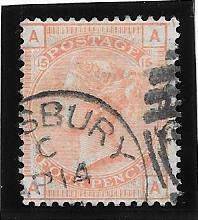 fine used, cancelled by the SALISBURY, '683', Official Trial Cancellation. 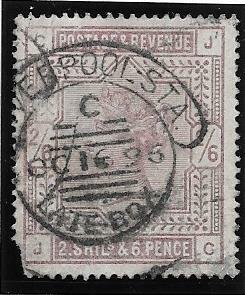 Initially this type of trial cancellation had four central pins that pierced the stamp as well as cancelling it. The later trial had the pins removed and the item offered here has the pins removed. A very scarce and fine example: the trial was abandoned. 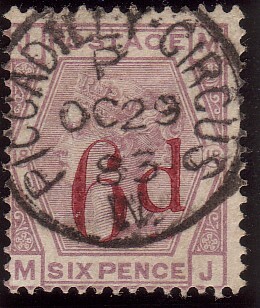 few other irregular perfs, lower left corner letter 'K' in a circle variety. 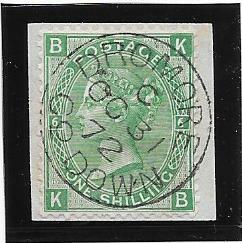 Although the stamp is centred downwards, the upper half of the circle around 'K' can be seen. Priced by Gibbons in 2017 at £2,750. A rarely offered variety and this very collectable example offered at a fraction of the Gibbons price. rejoined pair with 'T.0.2' cancellations of the elusive Travelling/Temporary Office series, T.0.1-6. This is the first multiple usage we have seen on any surface printed value. NB: scroll down for other used examples from the T.0.series on surface printed values. 151992. Dated piece from JERSEY (Channel Islands) via/to London. 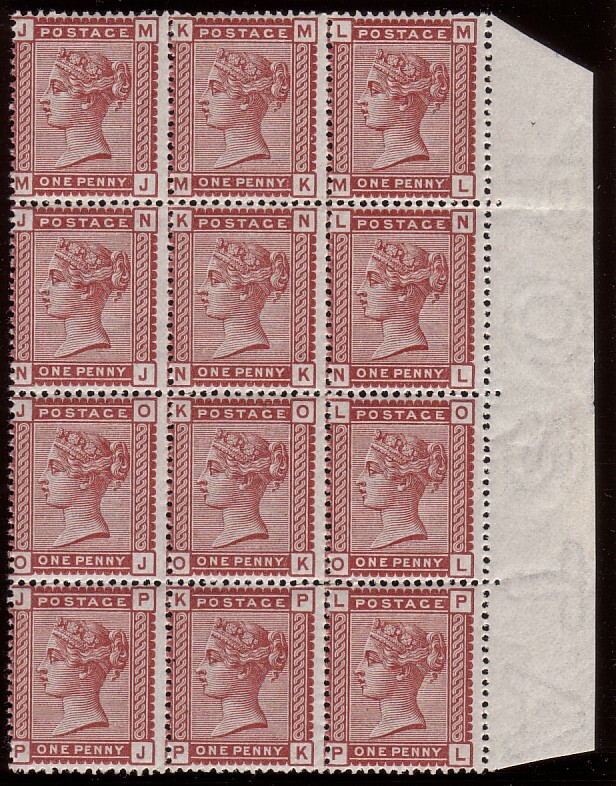 1/- SG72, fine/very fine with clear profile except for a slightly trimmed bottom left perf. 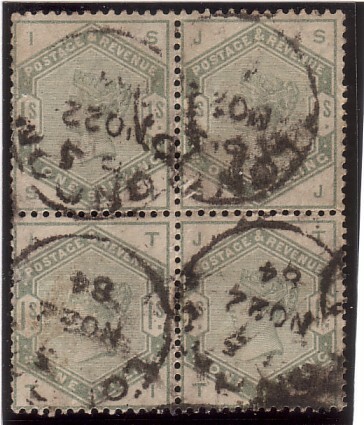 The four stamps are cancelled, contrary to PO regulations, by only three '409', First Type, numerals of JERSEY. 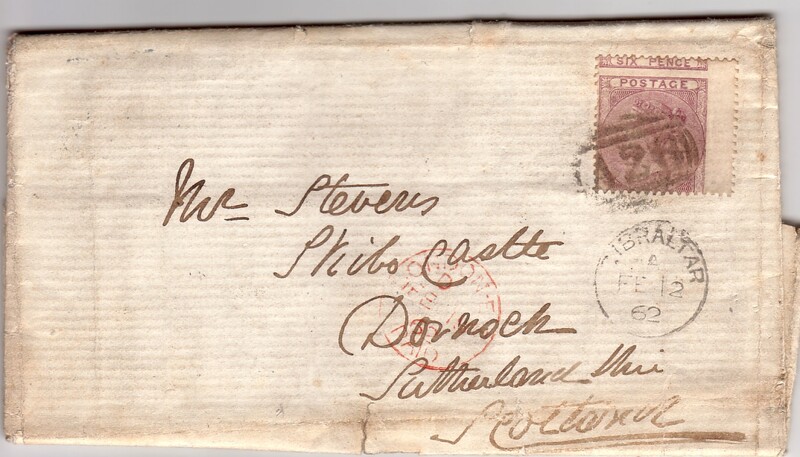 On the top flap is a superb Jersey date stamp for May 21st 1857 and a London receiver for May 28th 1857. Parmenter records this first type of Jersey numeral to January 7th 1857, hence this example extends its usage. from the GPO on June 23rd 1857 and has been recorded in use from July 1857. Hence the first type examples offered here are believed to be the latest known before the replacement came into use. A rare and attractive item. 151946. 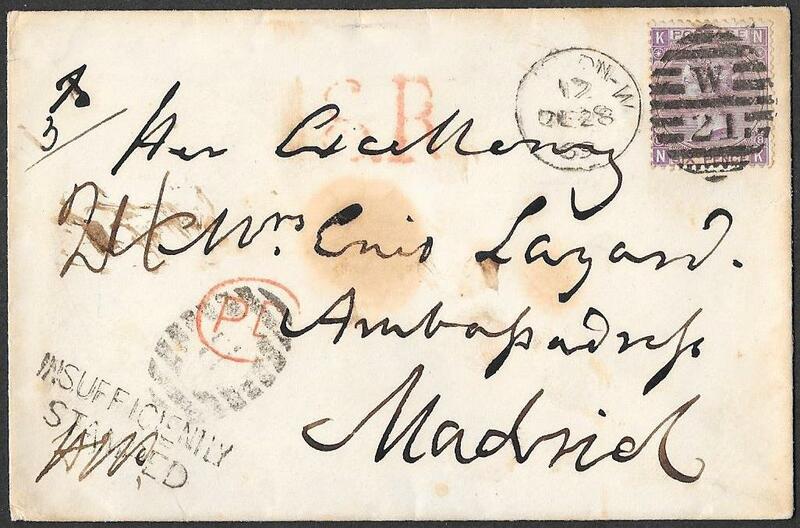 6d SG108 plate 8, fine, tied to an envelope from London to Madrid, December 28th 1869. An interesting address: Her Excellency, Ambasadress, Madrid. and a handstruck ' Insufficiently Stamped', with m/s initials, applied below the B in bars. The B in bars is given a RARE grading by Parmenter in 'Barred Numeral Cancellations of London'. An unusual and rare/unique combination of features. NB: the envelope is in a finer condition than the scan suggests. 151943. 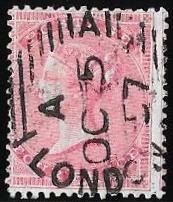 4d SG66, fine, tied to an entire by a London SW/L7 duplex, January 20th 1860. 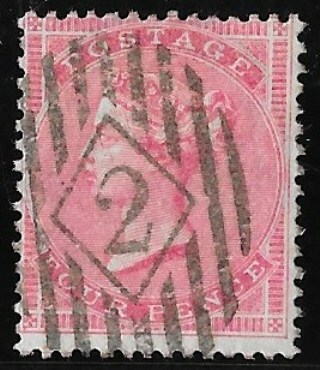 Stamp placed contrary to regulations at the top left resulting in a very scarce additional strike of the duplex. and one we cannot recall previously seeing. The letter is written in French, some hinge remnants on reverse, to a Professor at Caen University. 4d priced by Gibbons at £225 on cover. 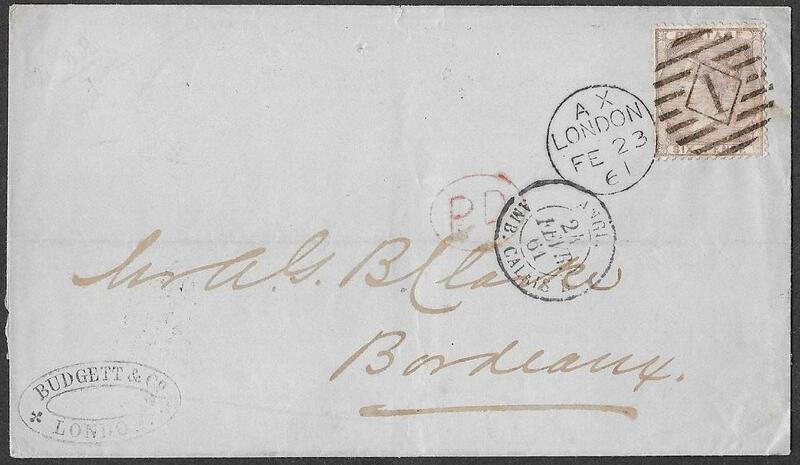 NB; The apparent browning across the envelope is NOT present. The effect is caused by the bright light of the scanner. 151944. 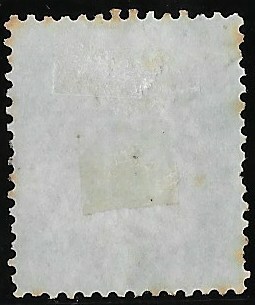 4d SG 80, a few light wrinkles top right corner, tied to an entire, vertical filing crease, by a BIRMINGHAM duplex, January 23rd 1866. 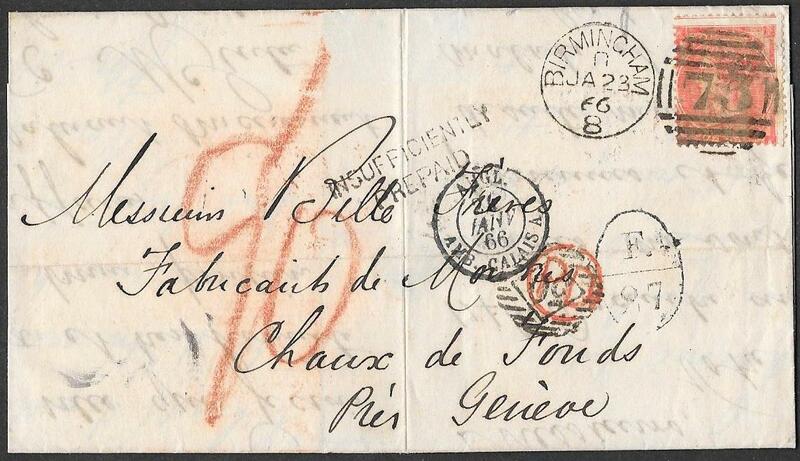 Sent to Switzerland, the single rate postage at that time for a letter was 6d; hence it was under franked. Originally it cancelled with the red 'PD', but the under payment was noticed by an Inspector. 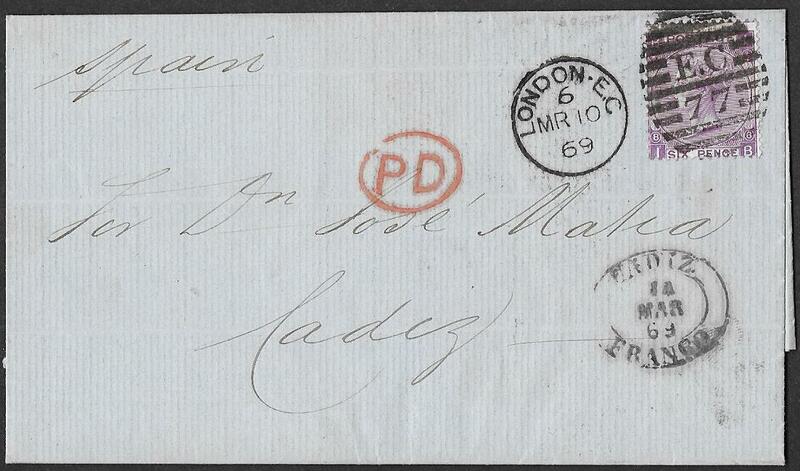 The 'PD' was overstruck with the '50' in diamond and bars and the letter struck with 'Insufficiently Prepaid. 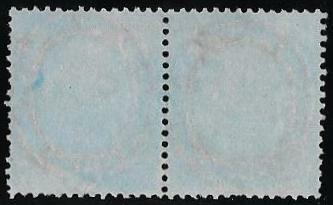 The '50' is listed and illustrated by Parmenter in 'Barred Numeral Cancellations of London', fig 50H and rated Very Rare. 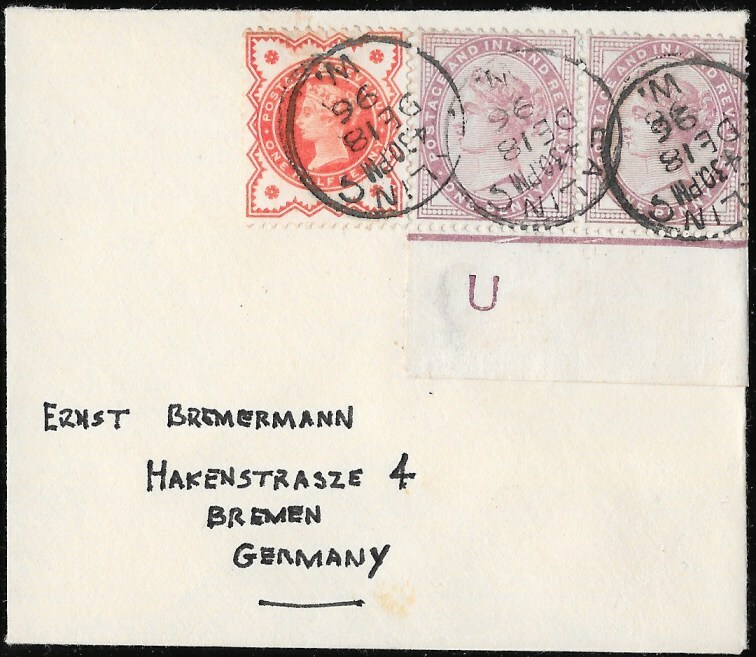 This letter is paired with another entire to the same addressee, again in Switzerland, from Birmingham, but the letter has the correct franking of 6d. 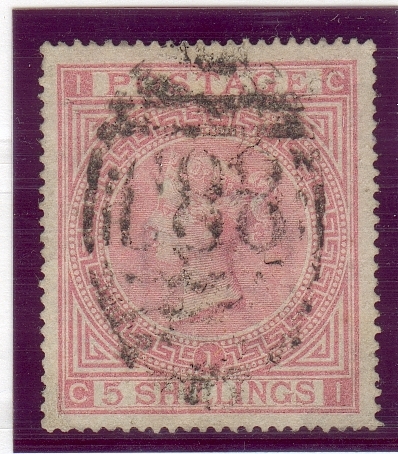 The 6d postage has been paid by a 6d SG96 plate 5. 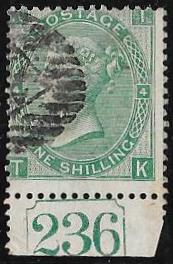 The right hand side appears to have been double perforated (rouletted); this variety is not listed by Gibbons on this stamp. The letter has a line engraved heading inside for 'W Ehrhardt, Chronometer and Watch Manufacturers'. Both letters are in French. A very scarce/rare pairing that would make a fine display page. 151945. 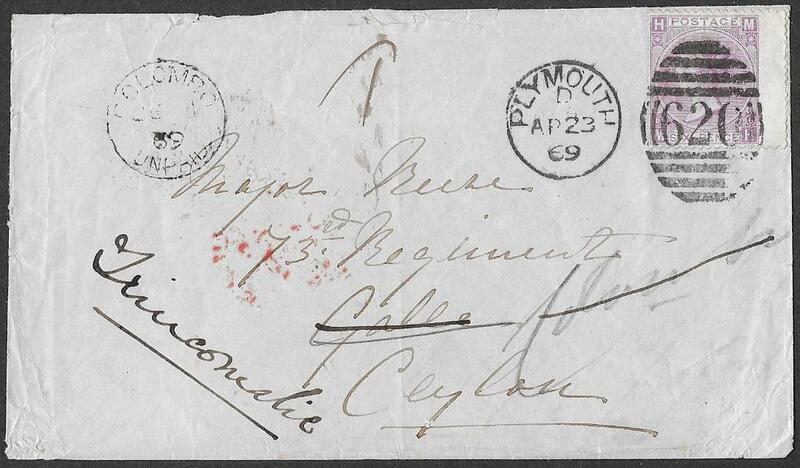 6d SG104 Plate 6, fine used, tied by a PLYMOUTH duplex for April 23rd 1869, to an envelope to CEYLON. Addressed to a Major Reece? 73rd Regiment, Galle then redirected to TRINCOMALIE with a Colombo Unpaid cds for June 1st 1869. 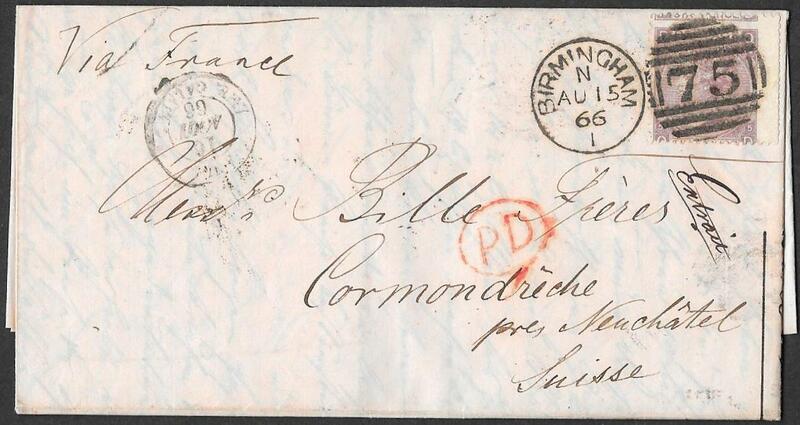 On the front is a m/s 1d for the redirection fee and on the reverse a Trincomalie Unpaid cds for June 3rd 1869. 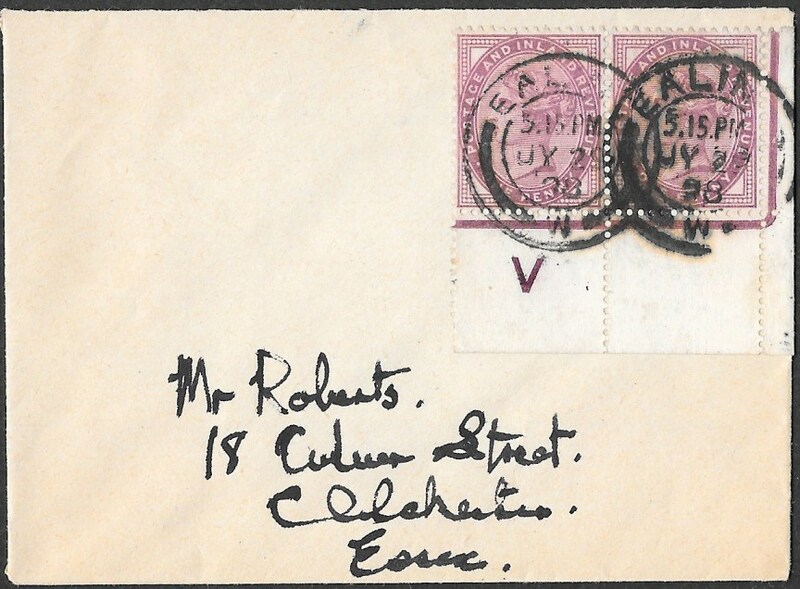 Very scarce item of redirected mail in Ceylon. 151911. 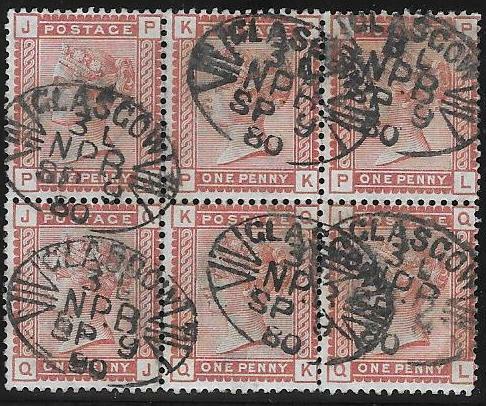 4d SG63, very scarce pair with excellent colour, cancelled by the '280' of PERTH. but with partial clear profile; both have a few short perfs. Very unusual to find this stamp with such a degree of misperfing. Priced by Gibbons at £1,150 as two singles. An attractive and very scarce item. 151920. 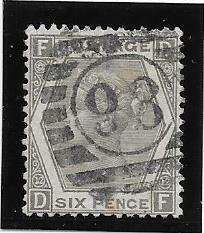 6d SG70wj: fine/very fine used with REVERSED watermark. Theres is a very tiny 'rub' in the area below the 'S' but this may be on the plate itself. and is a variety we have not previously seen. little more than the inverted watermark variety. and their figure is far too low. A rare stamp especially so with an unrecorded variety. allows the paper variety to be seen to advantage. shows the characteristic mottled effect for this paper variety. Gibbons prices this at £950 without a premium for so lightly cancelled. NB: the scan does not do justice to the superb blueing. cancelled by an upright London scroll for January 18th 1862. Priced by Gibbons at £350 before the premium for the scroll. but cancelled by an upright cds of ABERDEEN for June 24th 1863.
shows the most extensive printing from a dry plate that we have seen on this issue. Gibbons prices this stamp at £350 but at £780 with the cds premium. MALTA cds forJuly 11th 1865. Priced by Gibbons at £350 but at £785 with the premium for cds. fine upright WALSALL cds for December 30th 1864. Very fine except for a pulled perf at the base. Priced by Gibbons at £150 before premium for cds. very fine GLASGOW cds for August 11th 1864. Small wrinkle at the left side. cds of Mullingar? September 21st 1863, bluntish SE corner. A rare cds example used in Ireland. Priced by Gibbons at £300 and at £675 with a cds premium. very fine used but with some short perfs. 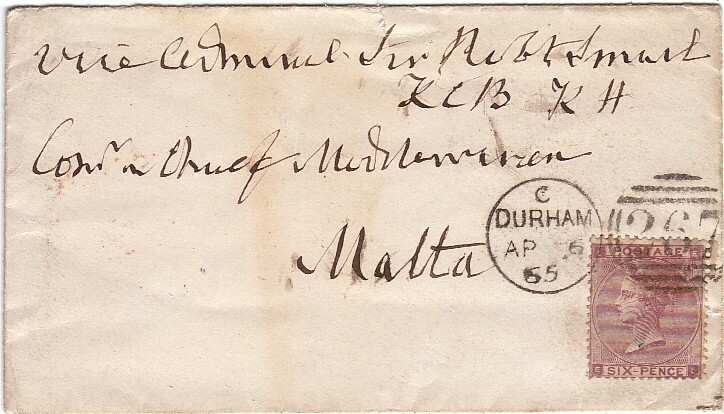 Cancelled by an upright MALTA cds for February 20th 1869. Priced by Gibbons at £260 including cds premium. with a fine partial cds, Saltburn by the Sea, November 1876. Priced by Gibbons in excess of £1,000 with the premium for cds. tied to a piece by the BOOTLE Liverpool duplex, April 12th 1877. A single priced by Gibbons at £525. 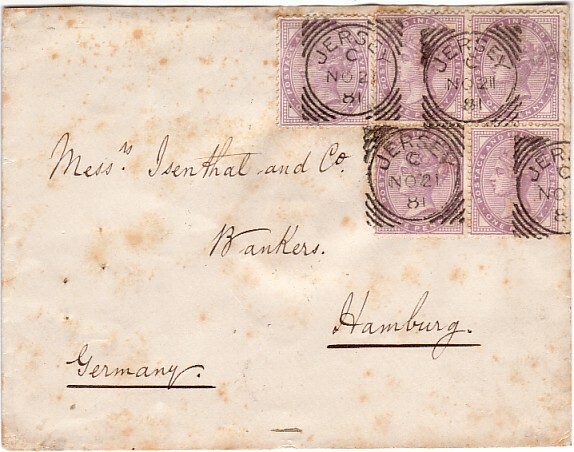 A very scarce multiple franking. 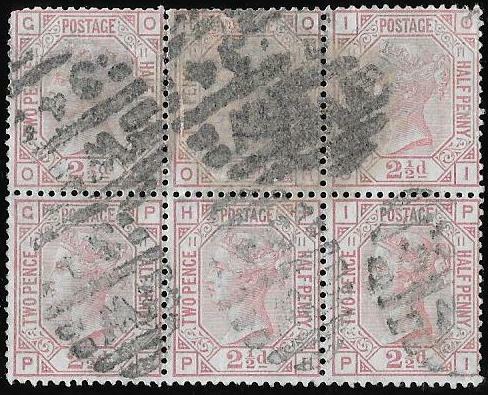 a VERY RARE used block of 4, London Registration Branch, Holborn Hill, cancellations. 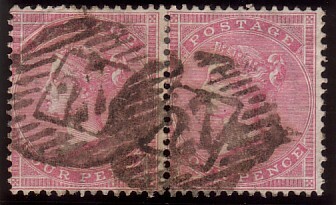 Cancelled Contrary to PO Regulations by only two strikes R/20. This cancellation in use from March 13th 1868. 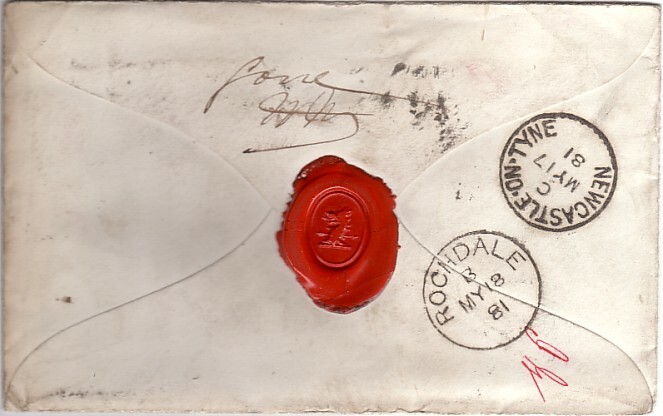 The block is still attached to a large part of the original registered envelope/package to which it was affixed. 'BE' is damaged toward the bottom but this is a truly rare block. this is only the second used block we have been able to offer in several decades. Priced by Gibbons at £1,200 as four singles; a remarkable item despite the damage to 'BE'. Very few collections will contain a used block. 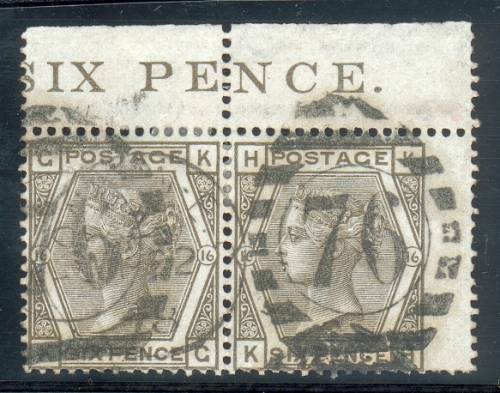 6d on 6d SG 162.
a pale shade, with a Registered W C D O cds for January 12th 1883.
the earliest usage we have seen. Priced by Gibbons at £150 without the cds premium. NB: the apparent brown mark near the SE 'C' square is a trick of the scanner. 151907. SG141 two pence hafpenny Plate 9: from LETTERKENNY to the USA. 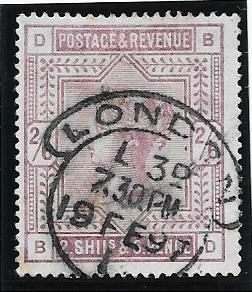 Stamp tied by a superb '302' of Letterkenny but the date portion of the duplex unclear. 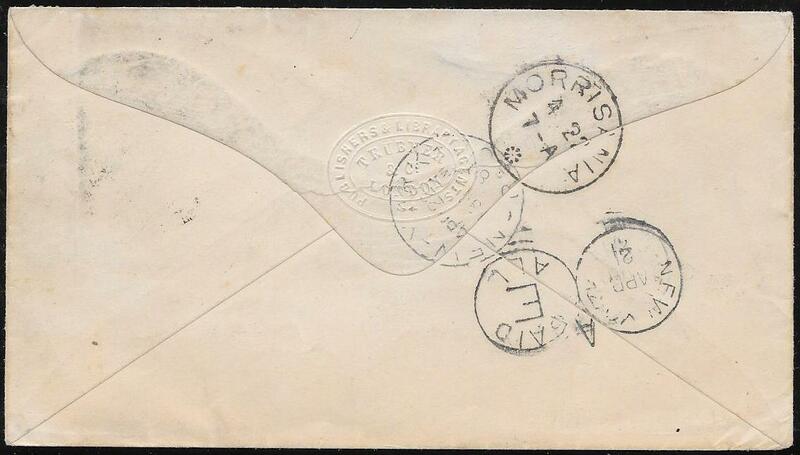 this portion of the duplex to avoid spoiling the embossed design on the envelope. the letter was more than likely sent on December 26th. is in a remarkable and very fine condition except for a very small portion of the top right flower. A very rare, and superb example, and especially so from Ireland. 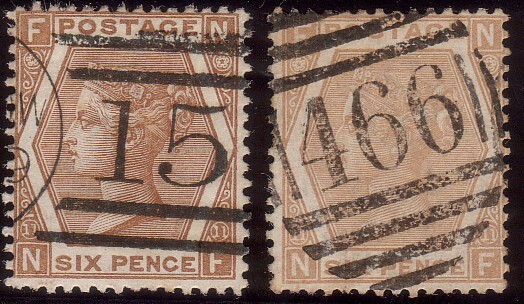 NB: SG141 plate 9 was put to press on September 14th 1877. 151906. 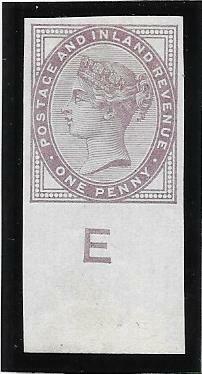 1/2d SG187: fine unmounted mint interpanneau(IP) vertical strip of 4. Unusual multiple with the IP margin unfolded. The brown marks are very much fainter than the scan suggests. only listed with imperf bottom margin at £200 plus 50% for a pair. in our experience considerably rarer than with an imperf margin. a very small brown area on the gum. 1d lilac Control X Inverted. 16 stamps unmounted mint including the control, and three stamps with light gum creases. This is the variety 'Control X Inverted with imperf margin', Spec K32a. with a 50% premium for a marginal corner PAIR. 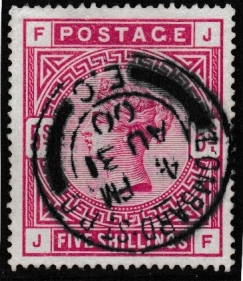 An attractive and very scarce block in such a size showing this variety. with extension hole in bottom margin from a vertical comb perforator. 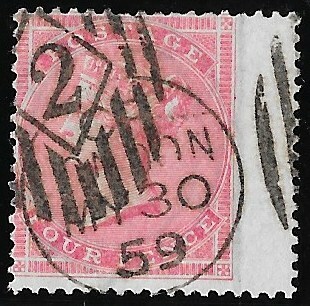 for such a large multiple,stamp 240 with small corner crease. with a 50% premium for a marginal control PAIR. A substantial premium can be added for a block of this size. Very impressive appearance and rare. fine/good used block of 4 on piece. Priced by Gibbons at £175. 4d SG62: a Very Rare Internal UK Usage. December 26th 1855, and used locally within London. almost as rare as examples used on its day of issue. Gibbons prices this, the first surface printed stamp to be issued, at £780 on cover. 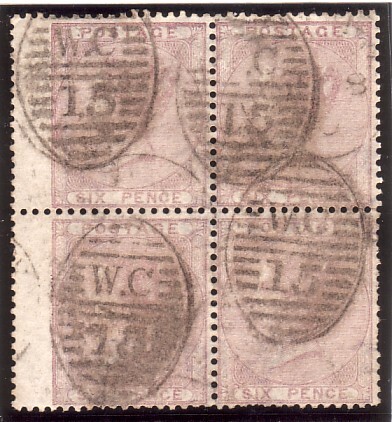 SG45 2d plate 9; 3d SG76; 6d SG85 plate 4 and 1d SG43 plate 72.
rated Rare by Parmenter in 'Barred Numeral Cancellations of London. Aus England Per Aachen cds for September 1864 in crimson. for about 6 months in 1864 - May to November. 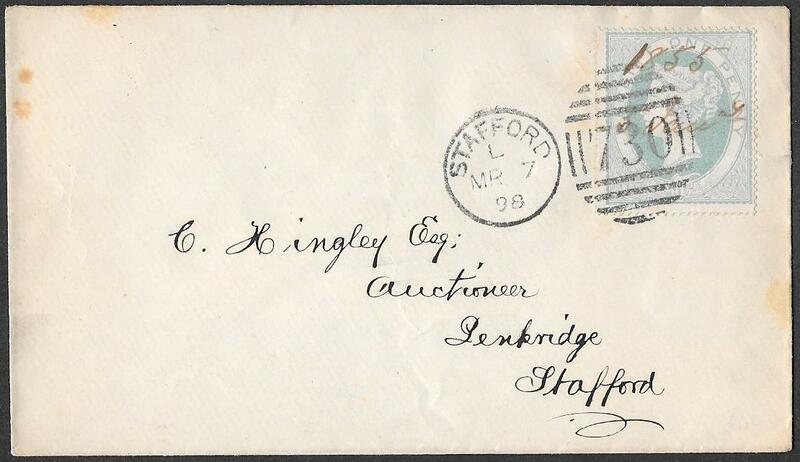 An attractive and very scarce franking. 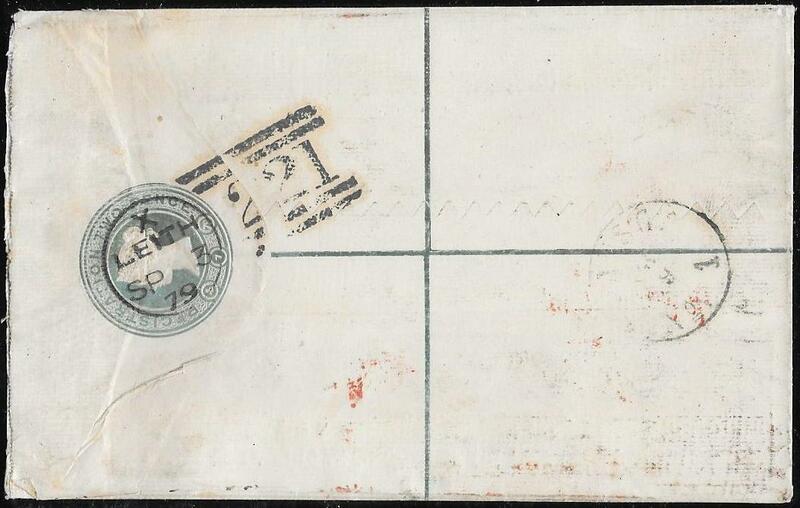 3d SG191 on Registered Envelope. 151886. 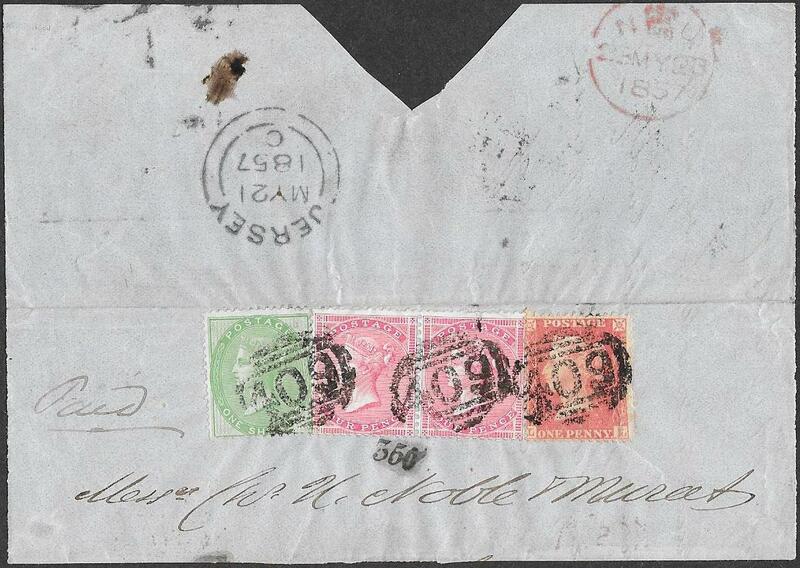 3d SG191, very fine/superb, tied to a clean and uncreased registered envelope to Wimbledon. 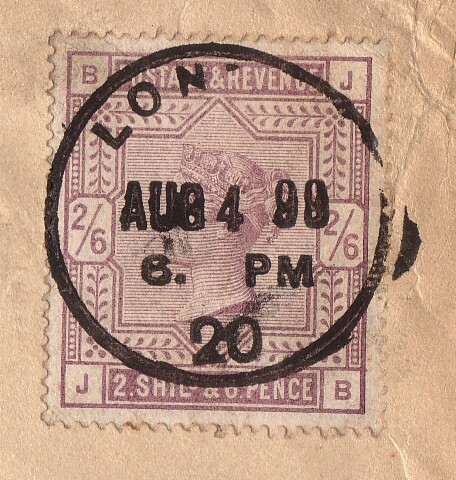 Stamp tied by a London Registered Oval, August 27th 1884. Gibbons prices SG191 on cover at £180 plus 100% premium for the light cancellation. EE-EH, each with Holborn BO WC CDS, Nov 19 89. Well centred with good perfs. at £960 with the cds premium. NB: condition finer than in the scan. well centred and very good perfs. The Queen's head is totally clear. Gibbons priced at £525 and at £780 with cds premium. 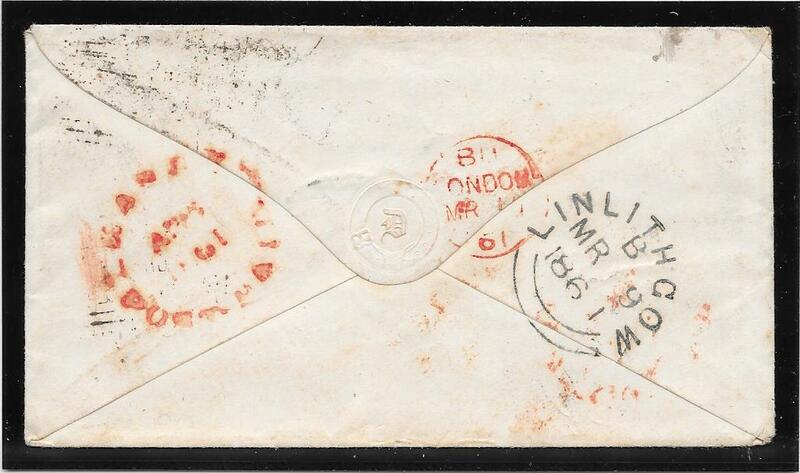 9d SG110: Plate Number 4.
fine example, light NW corner NW, London EC cds, July 9th 1875. In the bottom margin is the PLATE NUMBER 4. 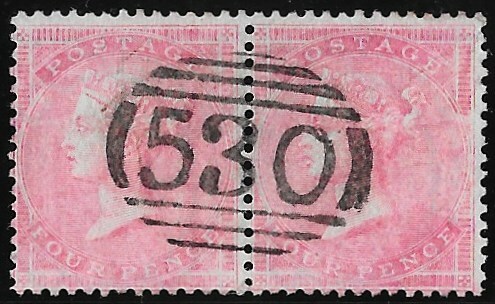 Only two stamps per sheet of 240 had the plate number printed in the margin. The only used plate number example we have seen. and the WARRANT Number 236 in the bottom margin. 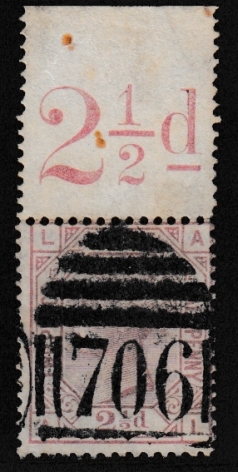 Only two stamps per sheet of 240 have this number in the margin. The emblems watermark is displaced significantly upwards. We know of only two used examples including this one. 151855. 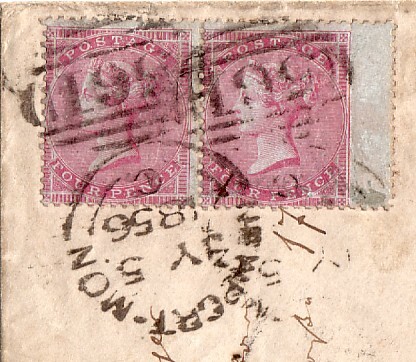 SG117 Plate 5: a superb cds with the WARRANT number 256.
have this number in the margin. one short perf, with the WARRANT number 330. Cancelled by a very light London cds leaving almost the entire Queen's head clear. left and a very small corner wrinkle but cancelled by a fine strike of the VR London Scroll for July 13 1883. 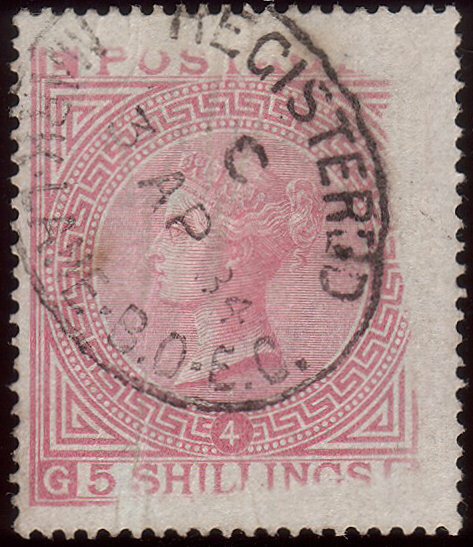 Code A is associated with Royal Household Mail and much scarcer than Codes B and C.
We have seen only one other VR Scroll Code A used on this stamp. at £8,400 allowing for the 75% premium for cds. 151936. SG130, 5/- plate 4, 'AB-AC'. Very fine/fine used pair with a Lombard Street L1/LS5 duplex. excellent colour and perfs with good centering. Priced by Gibbons at £9,600 as two singles. Rarely found in a used multiple. fine used example and off-centre as often found. Light strike of the very scarce Liverpool roller cancellation. Priced by Gibbons at £675. An attractive example with very fine colour. and off-centred to a similar extent. Would make an interesting pair and offered at £375. a remarkable and unique ‘matched pairing’ of two fine used examples. 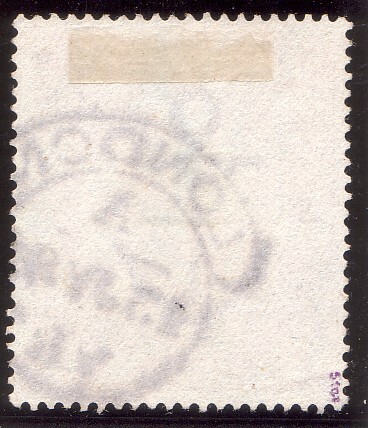 with this cancellation applied virtually in the same position on the stamp. Gibbons prices each at £675. This unique pair would make a memorable Exhibition item. 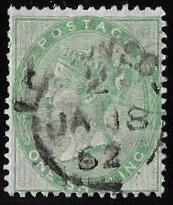 C88 Cancel of St Jago de Cuba. the very scarce C88 of St Jago de Cuba. but no price is quoted. A very rare item and offered with a Certificate. Gresham House cds’s, January 25th 1872 and a very clean back as per scan. Priced by Gibbons at a minimum of £1,350. An attractive multiple off-centre as often found on this issue. good/fine used block of 4, London Registered barred ovals. a RARE block when postally used as is this. with a small part of a Registered datestamp leaving the whole of QV's head clear. 75% premium for so lightly used rises to £2,625. We have not seen a lighter used example. cancelled by an unusual crown surrounded by GC and TB. Can recall only seeing one other example of this type of cancellation. The TB possibly stands for Training Board? 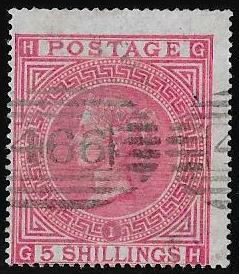 The basic stamp priced by Gibbons at £4,800. A very unusual and rare item. with a portion of 'revenue' in side margin. 151803. 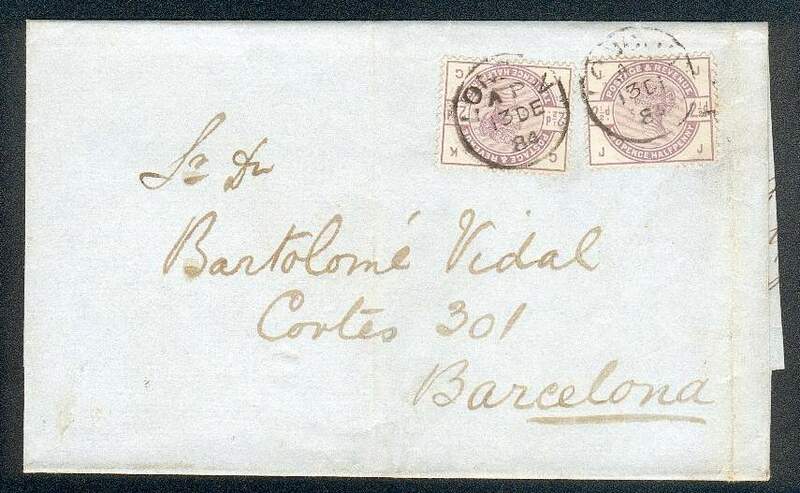 6d SG108 Plate 8, 'IB': very fine tied to a clean uncreased wrapper from London to Cadiz. 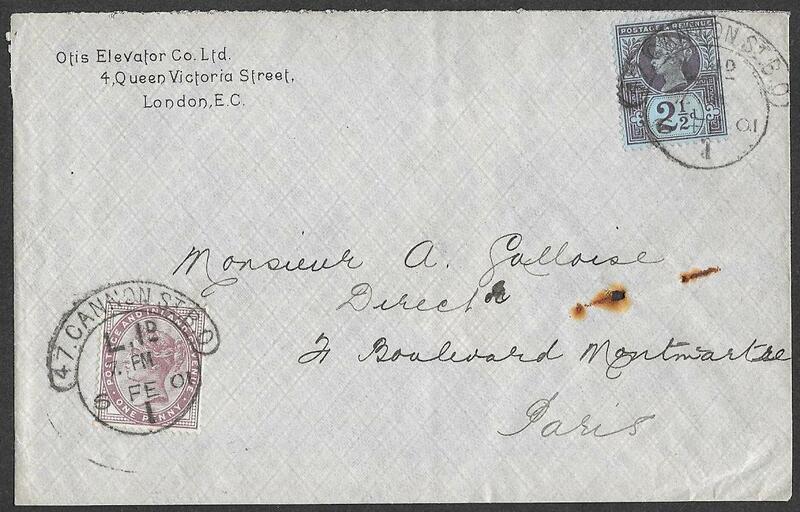 Stamp tied by a superb London duplex for March 10th 1869.
and the earliest we have been able to offer. prices a first day of issue example for this 6d at £3,500. We can recall seeing only two examples used on the day of issue. A superb and rare item. fine used except for small corner wrinkling. from the Travelling/TemporaryOffice series 1-6. SG77 priced by Gibbons at £350. We have not seen any of the 'T.0.' 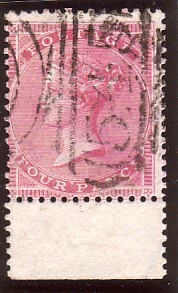 series used on this stamp. A rare/very rare combination of features. 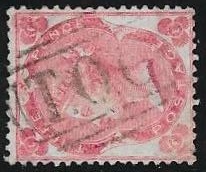 very scarce T.0.2 from the Travelling/Temporary Office series, 1-6.
cancelled by any of the 1-6 T.0. series. Gibbons prices SG98 at £600. A very rare or unique? 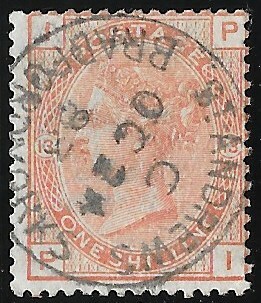 combination of stamp and cancellation. elusive 'T.0.2' Travelling/Temporary Office series, 1-6.
of the elusive Travelling/Temporary Office series, 1-6. Rarely found so well struck and very scarce on any surface printed issue. from the elusive Travelling/Temporary Office series, 1-6. A rare strike on this scarce shade and the first such combination we have seen. SG123 priced by Gibbons at £125 without a premium for this cancellation. 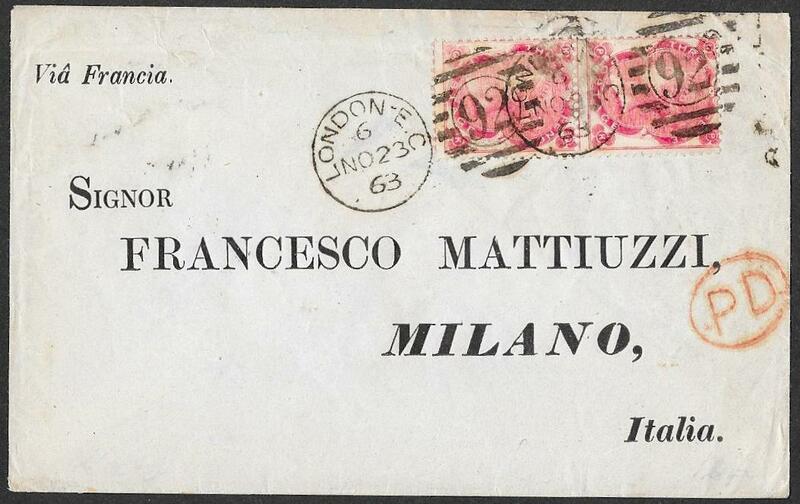 on a clean thin envelope from London to Milan, November 23rd 1863, with a fine printed address. 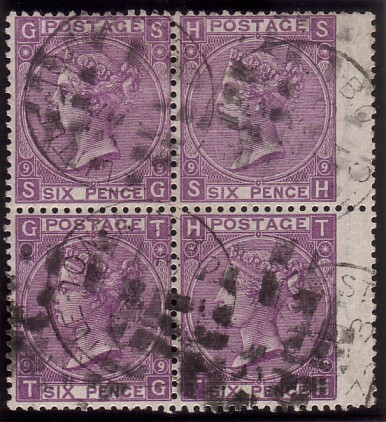 Seldom found as a multiple on cover; the 6d values were currently available. A single on cover priced by Gibbons at £600. 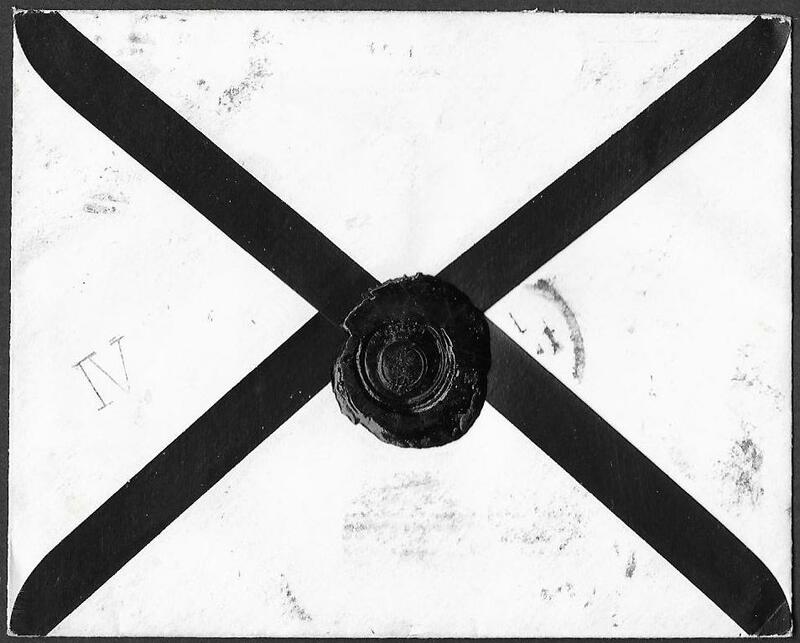 The browning along the top of the envelope is a trick of the scanner. fine used except for a blunt corner on the bottom left stamp. they are either not present or very faint. and prorata for a block of 6 at £1,300. 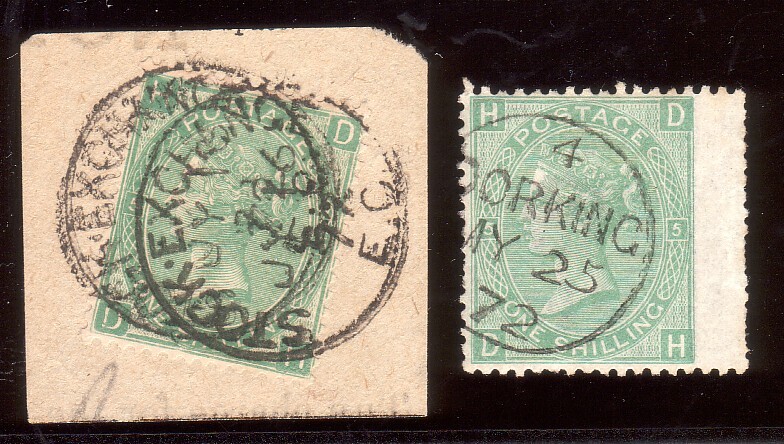 top three stamps and a very small closed tears at the top of 'HK' and 'GJ'. For any of this series, used blocks larger than four are very difficult to find. Priced by Gibbons prorata for a block of 6 at £630. 'Barred Numeral Cancellations of London'. 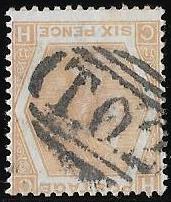 very scarce/rare combination of the size of the block and cancellation. Priced by Gibbons, prorata as a block of 6, at £785. 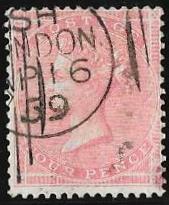 rated Very Rare in 'Barred Numeral Cancellations of London' by Parmenter. Gibbons, in the latest, 2011, Edition of QV Volume 1, at £850 as a block of four. 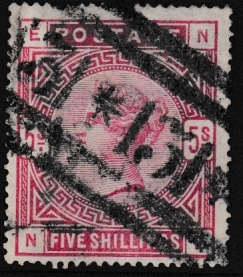 Seldom found in a block and rare with this cancellation. block of 6 with HASTINGS duplexes for September 21st 1882. Corner fault on 'ME' and a blunt corner on 'NG'. block of 4 at £850 and £1,275 pro rata as a block of 6. Very fine colour and a clean reverse. Paris by a lightly applied Manchester duplex for November 15th 1858. 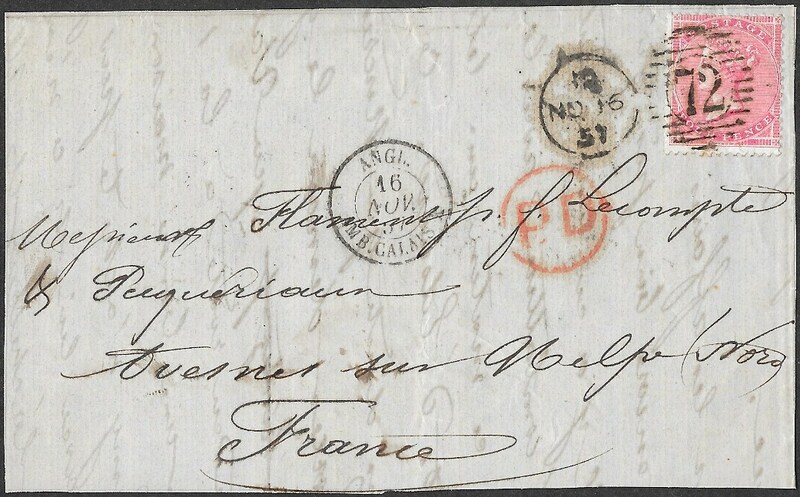 Paris receiver on reverse for November 17th 1858.
one of the finest examples overall of this 4d on cover we have seen. Priced by Gibbons at £225 on cover without the premium. The scan does not do it justice. neatly tied by a London duplex, February 15th 1860. 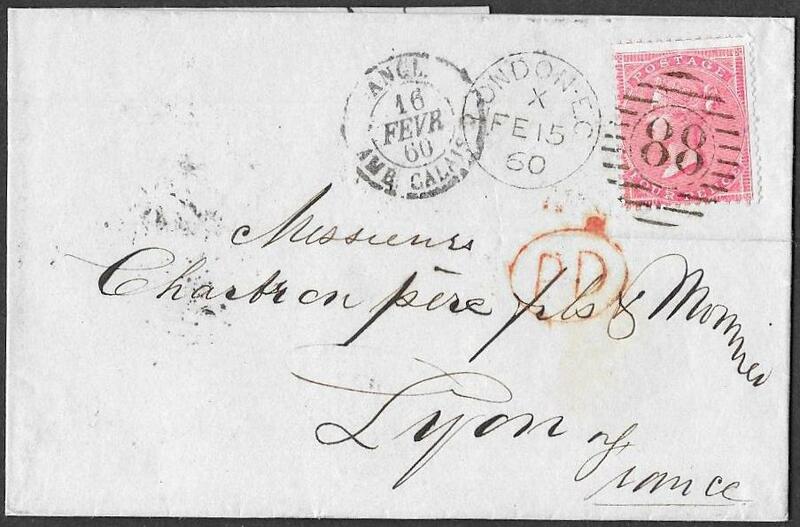 On a clean wrapper to Lyon with a variety of transit marks on the reverse. Attractive and very scarce in such fine overall condition. Priced by Gibbons at £225 on cover. 151752. 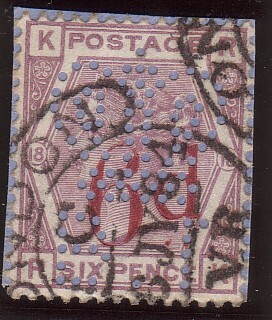 3d SG76, 'CK', very fine, tied to a small, neat envelope with a blue printed monogram on the reverse. 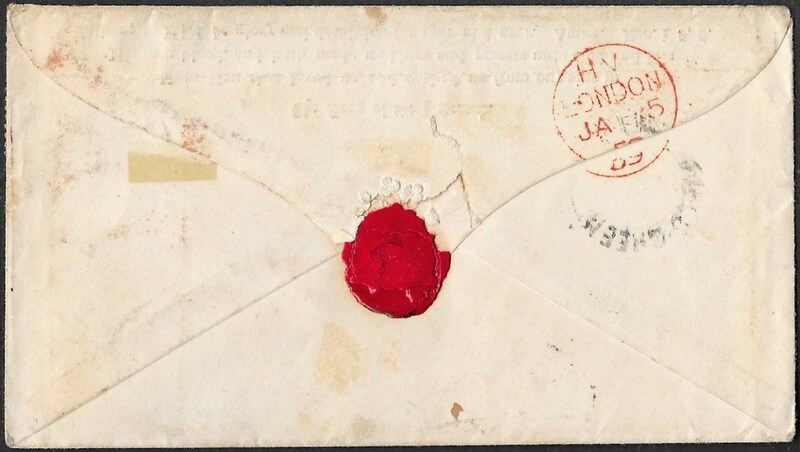 London date stamp on the reverse, November 10th 1864, and addressed to Amsterdam. A couple of short perfs at the right and two perfs with possibly very small tone spots at the top. Remarkably, the cancellation leaves the whole of the Queen's head clear. Gibbons prices this stamp on cover at £600. could fairly be added giving a figure of £1,325. An attractive and very rare item of Exhibition quality. NB: the few tone spots on the front are far fainter than in the scan. 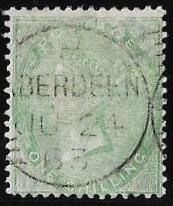 of the unique Kirkwall Scots Local Type V1. but the strike is a poorish one in comparison with that offered here. this 4d with this cancellation, on two separate small pieces realised, in modern money, approx £600. and the first on a value other than the contemporary 1d. 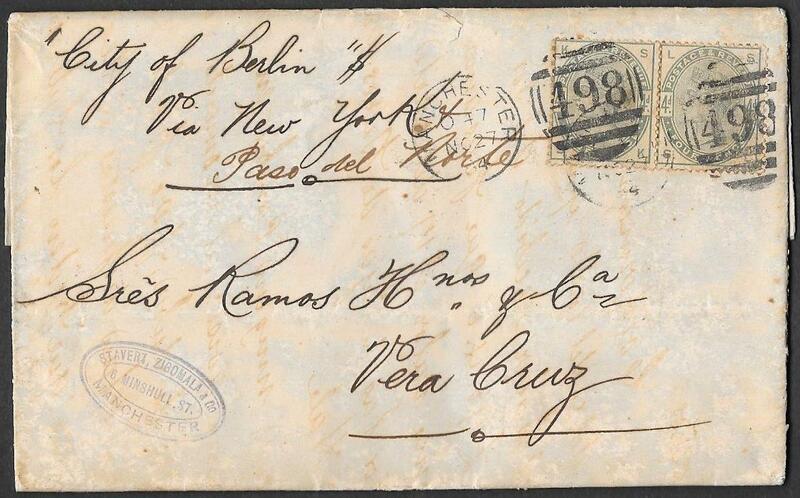 tied to a commercial entire in spanish from Manchester, November 27th 1884, to Vera Cruz. 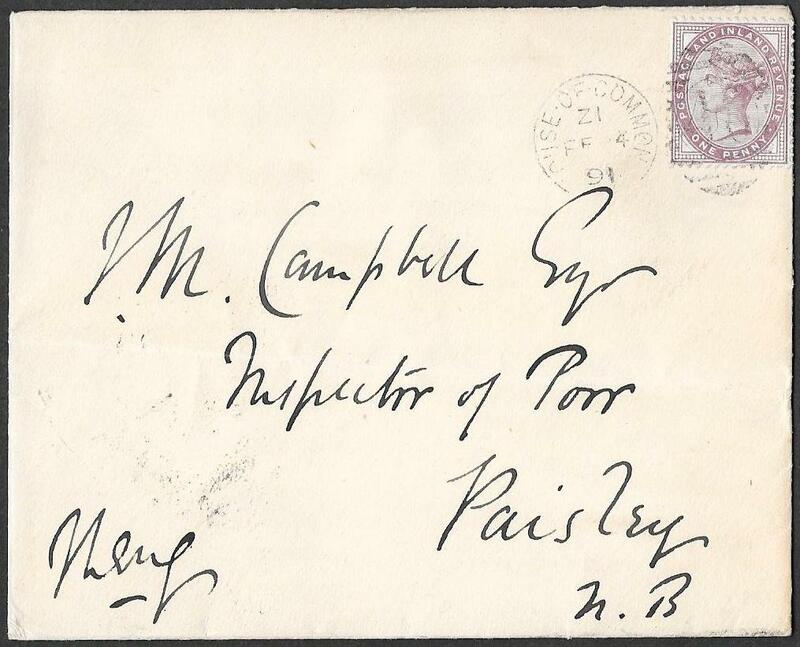 The condition is finer than the scan suggests as the writing from inside is not as obvious on the front of the letter. Written top left is 'City of Berlin', via New York. The 'City of Berlin' was the Inman Line's Premier Passenger Ship until 1888. 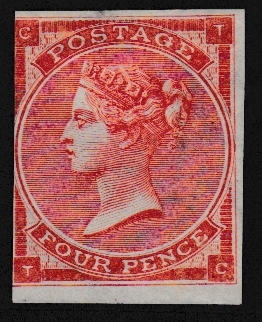 A single 4d priced on cover by Gibbons at £350. A very scarce item which travelled on a famous liner. Inman Line in 1875 as the fastest liner on the Atlantic. She was also the largest passenger ship for six years except for the inactive Great Eastern. until City of New York was commissioned in 1888.
by her new owners on both the American Line and Red Star Line until 1898. She was sold to the U.S. Government and was in their service until after World War I. Photo of the ship on the internet. BRADFORD-YORKS cds for June 22nd 1872.
allowing the listed variety SpecJ79d, 'Figure 11 on left damaged' to be seen clearly. 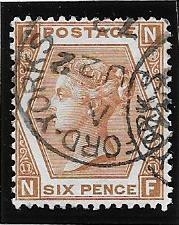 which is always seen on stamp 'NF' but not listed by Gibbons. much scarcer deep chestnut shade at £900 before the cds premium added. The cds leaves the Queen's head with an almost clear profile. the variety was partially obscured by the cancellation and it was slightly creased. It realised £180 plus Buyers Premium - a final figure of £210. The example offered here is the finest we have seen. with fine colour that the scan does not show. 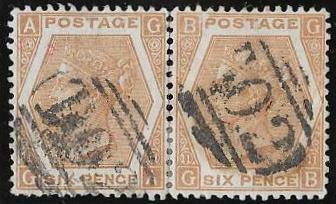 Extremely clean reverse and priced by Gibbons as a postally used pair at £320. hinge remnant, with original colour that the scan does not show. Hence the stamp is SG Spec K25bs. Edition of QV Volume 1 at £2,000 without the overprint and £425 with it. Superb stamp combining the two varieties. 1052. 1d SG166: superb unmounted mint side marginal block of 12.
very fine/fine mint marginal block of 12, unmounted except for one stamp as per the scan. Some very light gum wrinkling but the stamps with a smooth white gum. 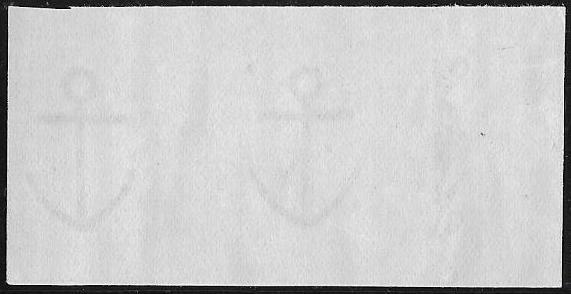 at the left on the reverse side is hardly noticeable: it is an effect of the scanner. A mounted mint block of 4 now priced by Gibbons at £175. 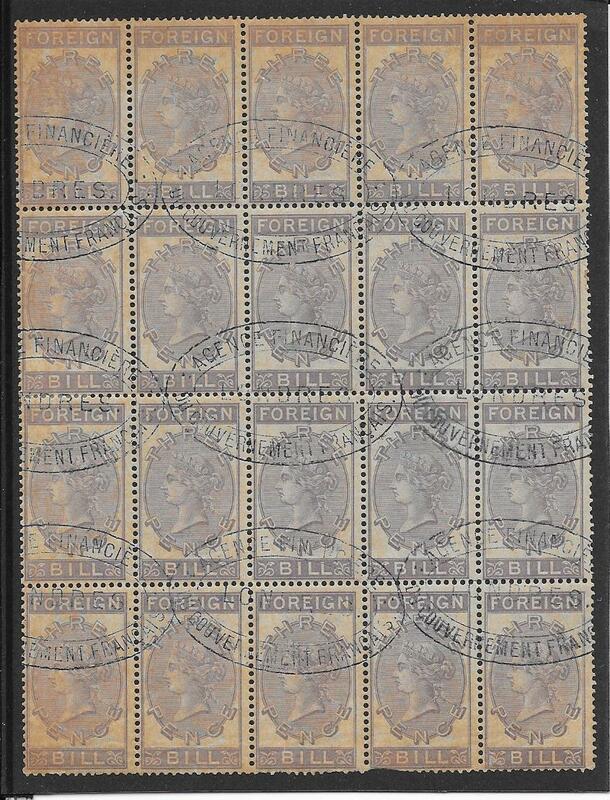 An attractive and very scarce block in this size and in such fine condition. 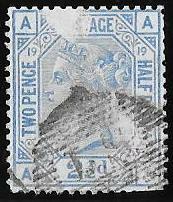 NB: the slate-blue colour of the stamps is excellent which the scan does not show. presumably when the stamps were bought. 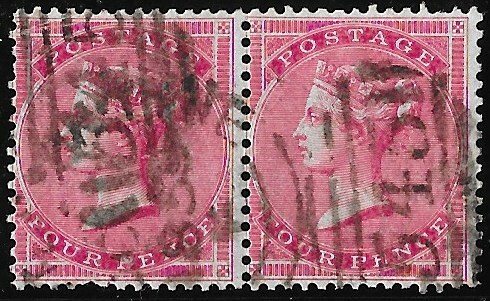 top stamp very lightly mounted and the bottom stamp unmounted.
' 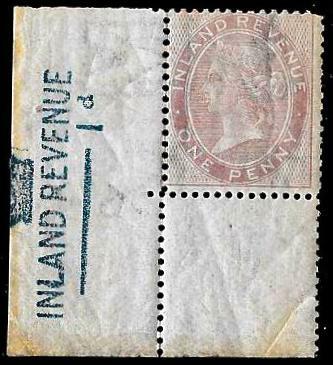 First issue of the new Postage and Inland (Revenue stamp) July 18 1881'. This will be the day the stamps were purchased; it was issued on July 12th 1881. 151719. 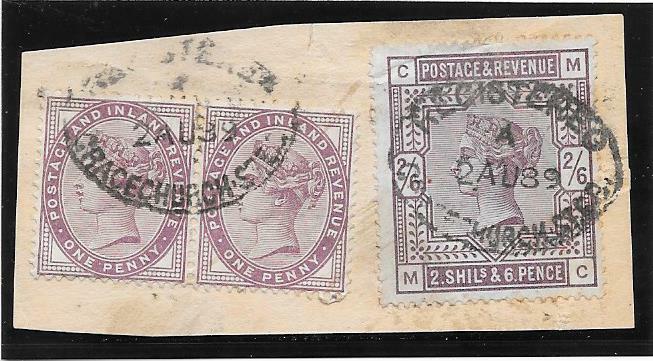 1d lilac SG172 tied to an envelope by the very rare HOUSE of COMMONS duplex for February 24th 1891. On the reverse is the embossed insignia of the House of Commons Library. 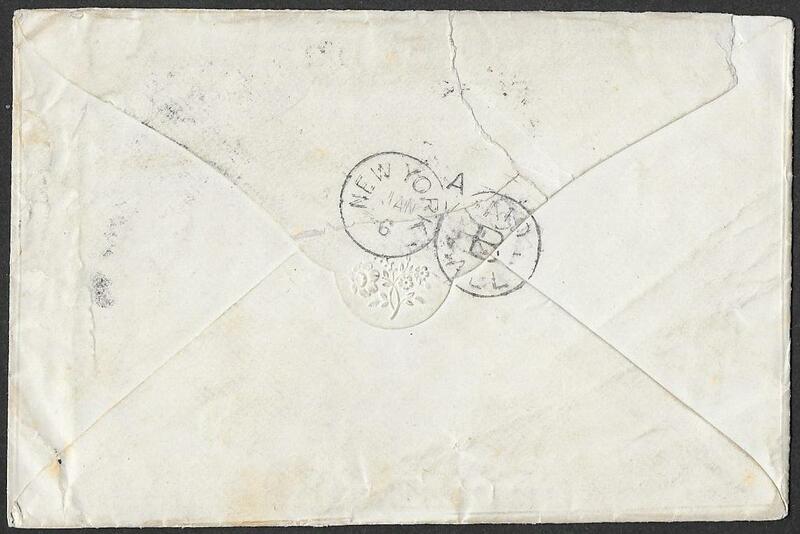 Sent to Paisley, there are two Paisley date stamps on the reverse for February 25th 1891. This duplex has the time in code, 'ZI'. and code book entries, are indicative of a 'too late' usage which explains why it is a very rare cancellation. LPHG record this duplex with time code having a short period of use ie between December 1888 and June 1890. The example offered here significantly extends the period of use. There is damage to the rear top flap as in the scan and some horizontal creasing but the front of the envelope is very clean. The first example we have been able to offer: a rare item. to HMS Majestic, Channel Squadron: two 1d lilacs with Control U from different plates. One with a perforated bottom margin and the other imperforate. 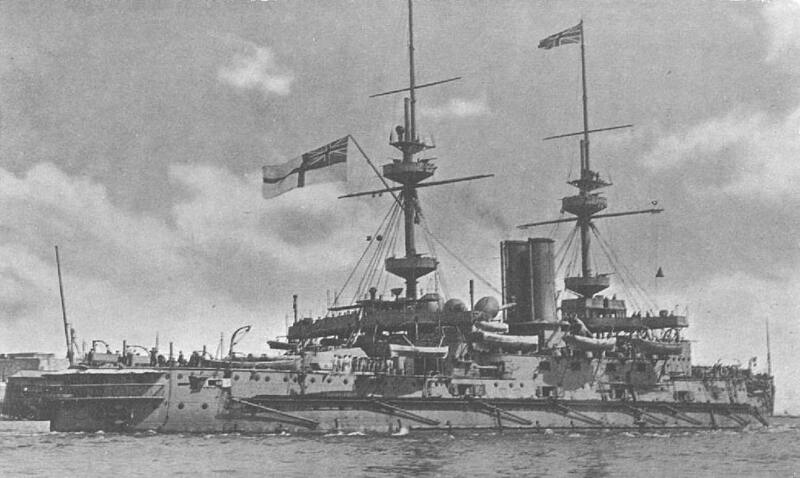 and was the largest pre-dreadnought battleship at that time. She served with the Channel Squadron until 1904. Majestic participated in bombardments of Turkish forts and supported the Allied landings at Gallipoli. On 27 May 1915, she was torpedoed by a U-Boat at Cape Helles sinking with the loss of 49 men. A superb item and likely a unique usage to HMS Majestic. NB: envelope in a finer condition than the scan suggests. London V.R. 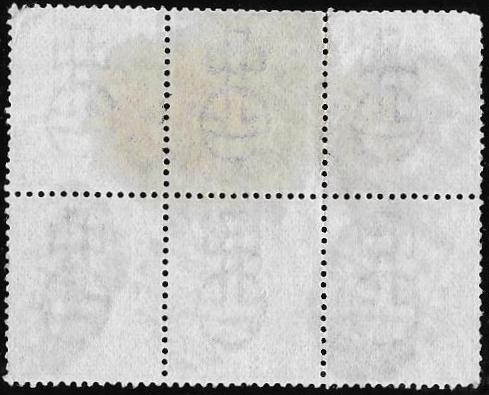 Code B Scroll date stamps for August 6th 1883.
not as pronounced as in the scan, and a peripheral tear at the centre left side. 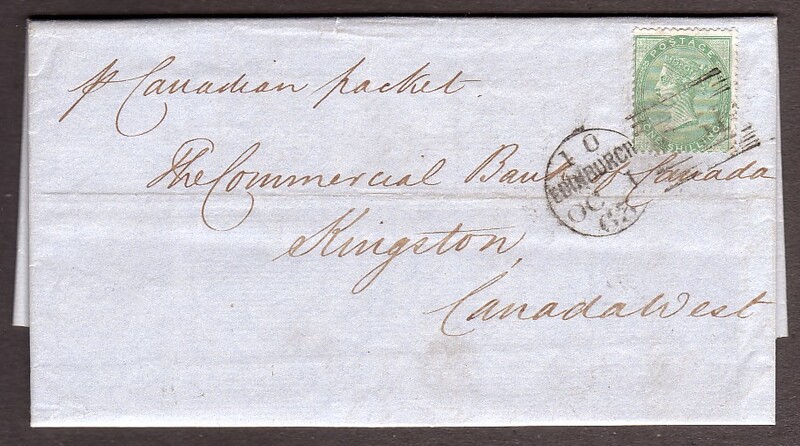 Despite these, this is a very scarce cancellation on cover. 151659. 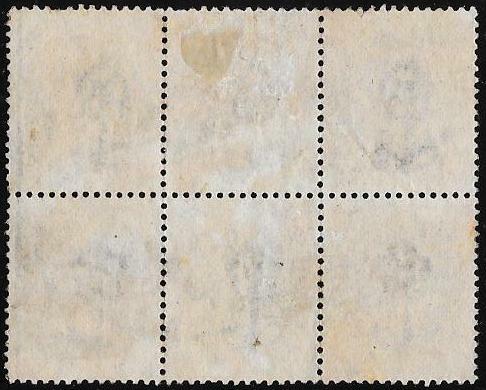 1d SG172, Die 2: a fine/very fine unmounted mint interpane Block of 24, light creasing to three/four stamps top left. No marginal rules or interpane pillars hence from one of the earlier printings. 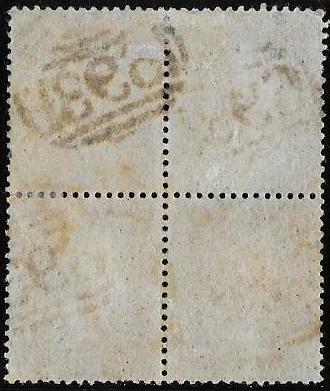 A rare positional block and rarer still with uncreased/unfolded interpane margins. The largest interpane multiple we have seen without marginal rules. An attractive and impressive item. 1d lilac tied by Maske-by-the-Sea duplex, March 22nd 1886. Addressed to a Bank, the envelope was found open without contents. Perhaps the address tempted a postal worker to open it thinking it contained money? The flap has been carefully opened. another strike across the centre of the rear flap. Both strikes initialled 'FP' and written in the same hand: 'Found Open'. 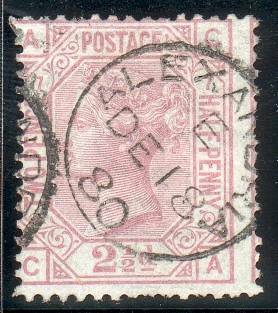 ordinary rate paid by 'Jubilee' twopence halfpenny, SG201, with the 1d late fee paid by a 1d lilac. 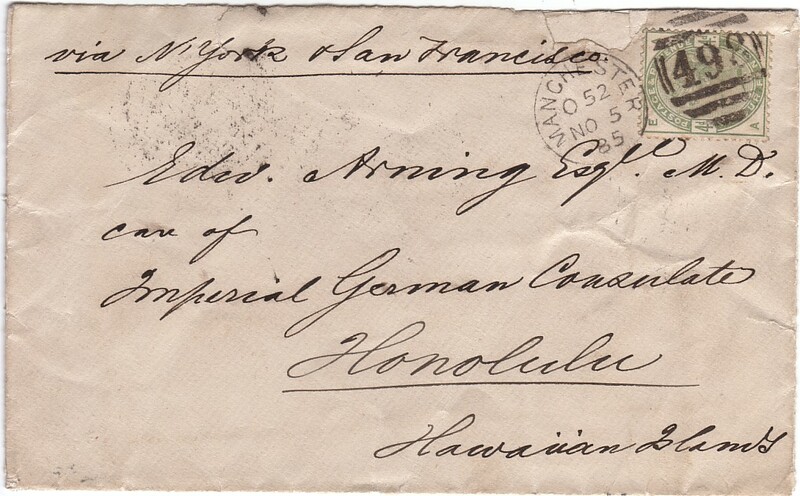 Each cancelled by this unique Victorian late fee scroll type. but this is the only example we have seen of this rare type on cover. The strike on the 1d lilac is paticularly fine. Priced by parmenter at £60 more than 10 years ago. 151635. 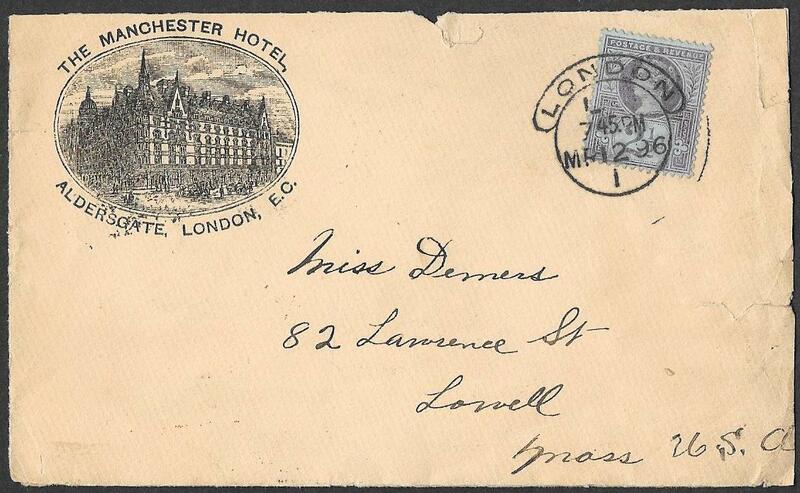 Envelope, nibbled at the top, from The Manchester Hotel, Aldersgate, London to the USA, March 12th 1896. Postage paid by the 'Jubilee' SG201 and tied by a very fine Late Fee Scroll for 7.45pm. 'London Late Fee and Too Late Mail': the first example we have seen. NB: the envelope is cleaner than the scan. VERTICAL CRACKED plate across approx 80% of the stamp and going thru QV's face/head. NB: full perfs at the right side side, cancellation makes it appear some are missing. A very rare item with such extensive plate damage affecting Victoria's profile. the London cancellation leaves QV's head and profile clear. affecting the back of QV's hair and some of the stamp's design. a fine example of damage to the printing plate. at the top of the stamp and another similar area at the right. Short/trimmed perfs at the top right and bottom corner. Fine example of damage to the printing plate. perhaps the plate was less protected against possible damage. very lightly used and with much stronger blue than the scan suggests. to the frame and part of the design can be seen to advantage. The item has a RPS Certificate which states 'transient variety affecting frame line'. We can not recall seeing such extensive damage on this value. and a blue crayon line top left corner leaving QV's Head almost totally clear. A very attractive example with excellent perfs and centring. Priced by Gibbons at £525 plus 50% premium for so lightly used. scarce unmounted mint Plate Number pair. Plate 121, put to press 5-7-78. 151588. 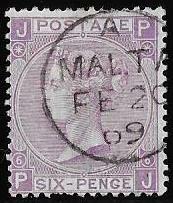 1d SG F18, pale purple: unmounted mint corner example with the usual gum creasing. Watermark small anchor much displaced upwards as are the corner guide lines. which occurs only ONCE per sheet on some surface printed values and is rarely seen. 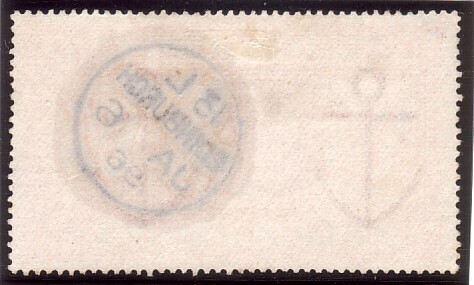 There is also a small diagonal anchor marginal watermark to the bottom left corner of the stamp. There is one blunt perf top right corner and some perf separation at the left side. and the shade of the stamp itself is much lighter. 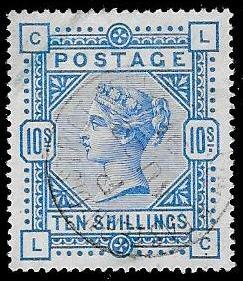 Together with the 'Crown INLAND REVENUE 1d' hand stamp in blue, this is a rare positional piece. 151573. 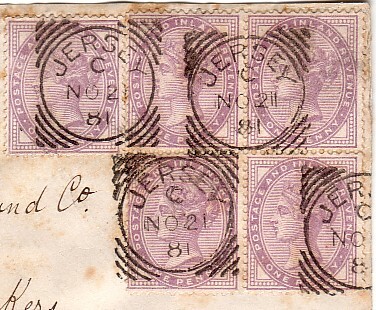 1d lilac Die 2 and 1/2d SG213: tied to an envelope to Brazil by Failsworth, cds's for September 16th 1900. Letter carried on the 'Orellana'. 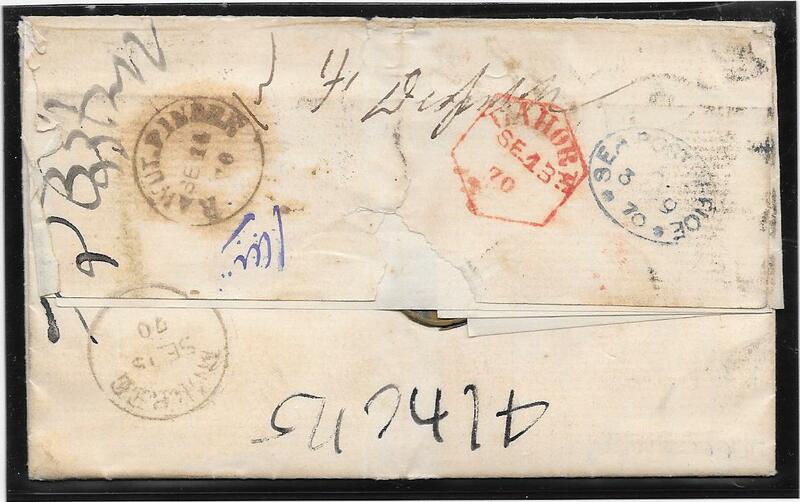 damaged when the letter was opened by the postal authorities because the letter was UNCLAIMED. 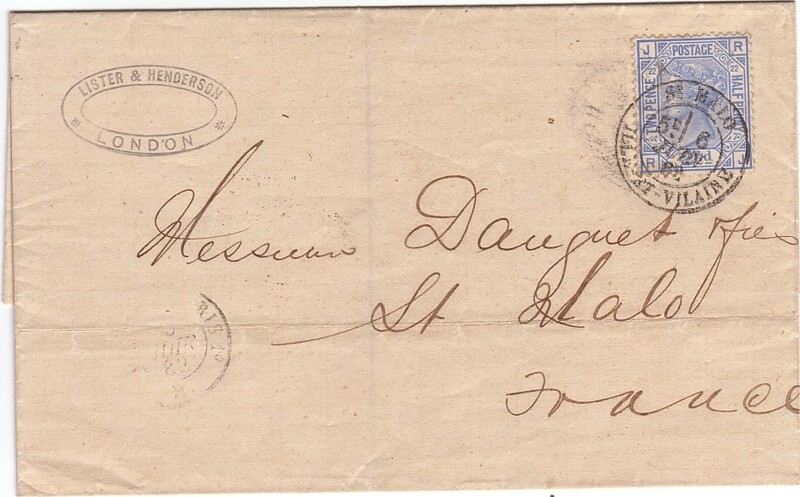 It was returned to sender almost a year later with a London cds on the front for July 2nd 1901. An unusual item that would display well when fully written up. 151564. 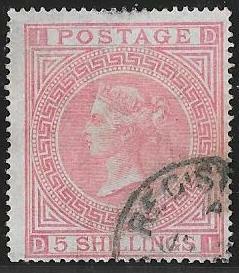 4d SG154, very fine used example of this difficult stamp. Lightly cancelled by a London squared circle for May 9th 1881. Priced by Gibbons at £550 without the premium for the dated cancellation. NB: finer than the scanned image. 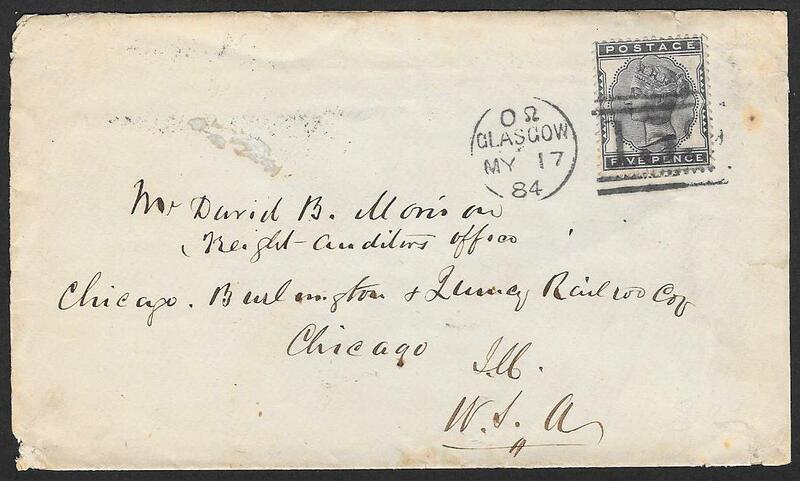 fine/very fine example on envelope to Chicago from Glasgow, May 17th 1884. Chicago cds on the reverse for May 27th 1884. Gibbons prices this 5d on cover at £325. 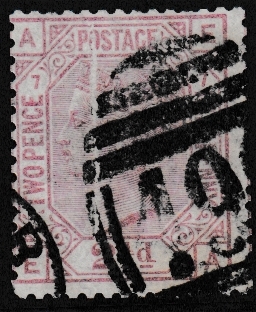 with an additional strike away from the stamps - contrary to PO reg's at that time. Possibly struck twice as there were two stamps but only one strike on the stamps. was carried by the Cunard's paddle steamer 'Asia'. She left Liverpool on july 21st 1860 and arrived in New York August 2nd 1860. Pleasingly ALL the postal markings are on the front of the envelope. 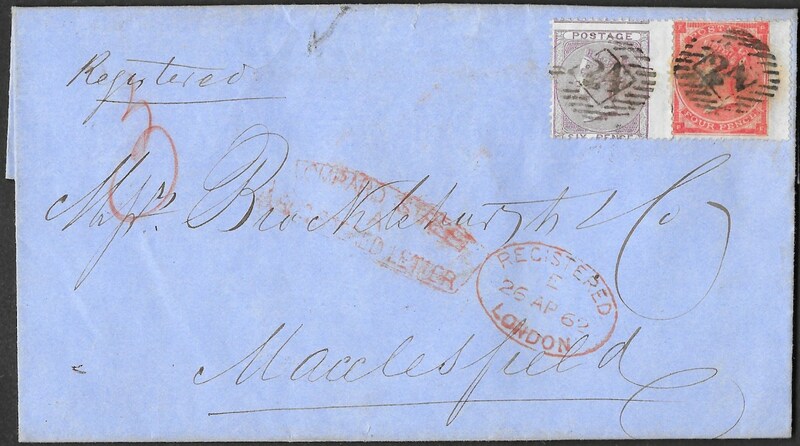 Very scarce/rare to find this 6d value on cover with a cds cancellation. Allowing for the cds, Gibbons price for this single stamp on cover is £540 plus. NB: the envelope is much cleaner than the scan suggests. 'QL' light diagonal crease at the right corner area. 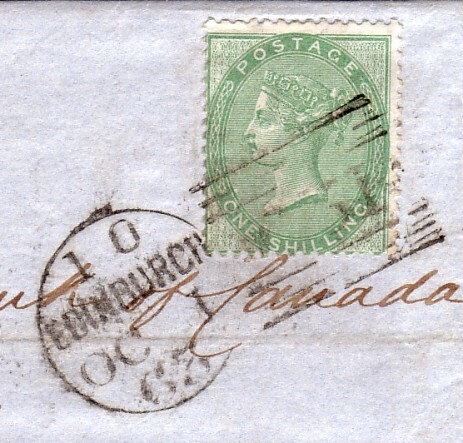 Glasgow News Paper Branch date stamp for September 9th 1880. 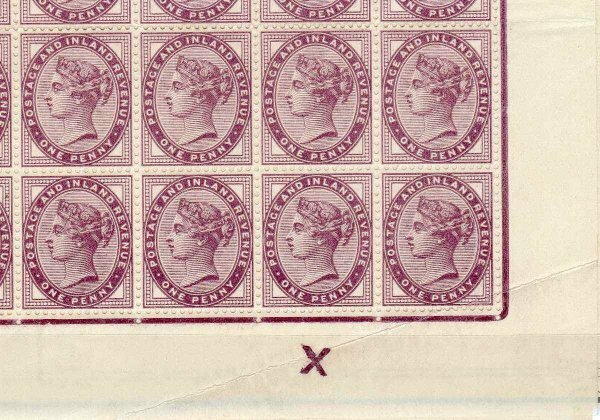 Very difficult to find used blocks of this stamp and especially a block larger than four. Very much underpriced by Gibbons at £85 for a used block of 4. We have not seen before this stamp in a used block with this cancellation. a fine set of transit marks on the reverse. priced by Gibbons at £550 on cover in the latest, 2011, Edition of QV Volume 1. The duplex leaves the plate number at the right totally clear. A very difficult stamp to find on cover and in our experience underpriced by Gibbons. 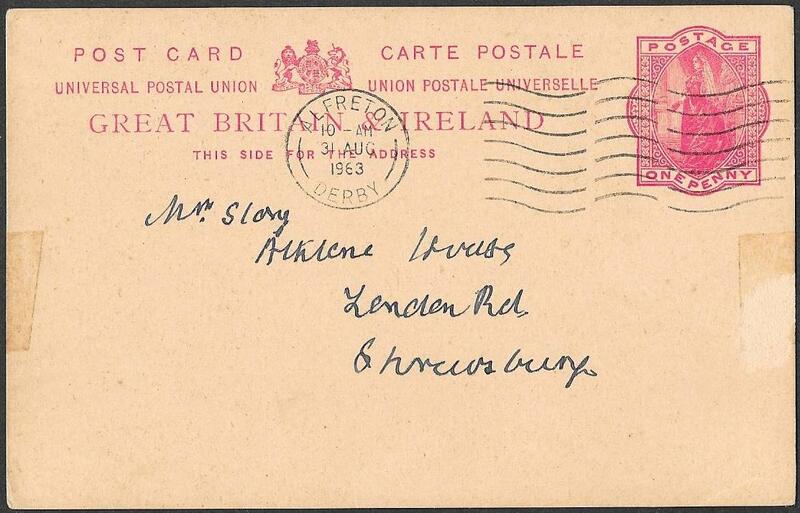 NB: the envelope is cleaner than in the scan - the front of it is close in colour to that of the reverse. then redirected to Muree with fine transit markings on the reverse. The 9d rate paid by a fine SG110. East India Army and General........., 10 Kings Arms Yard, Moor(gate). SG110 on cover priced by Gibbons at £525. NB: Item in a finer condition than the scan. Rare internal use of 3d SG76: Notice of Objection. 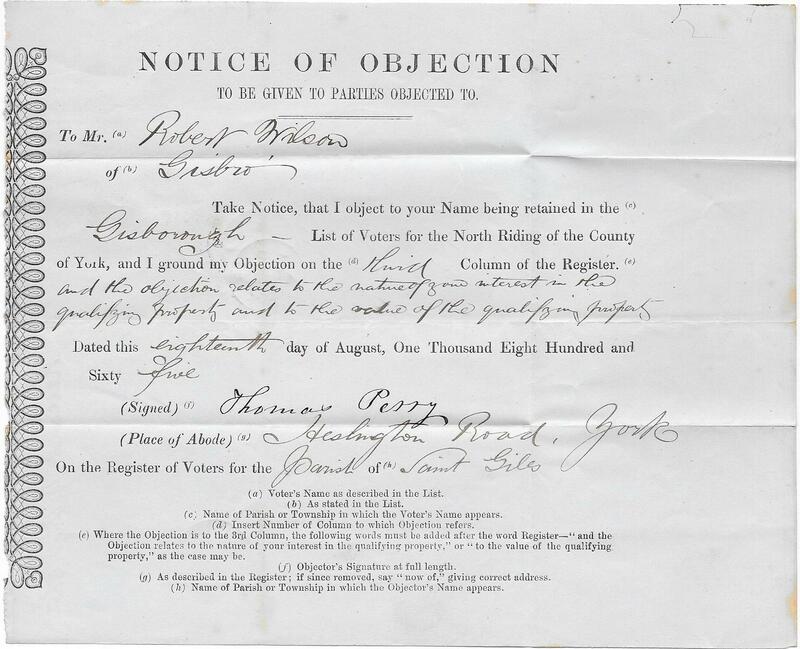 tied to a printed Notice of Objection for a name on a List of Voters for Gisboro' in the North Riding of the County of York. 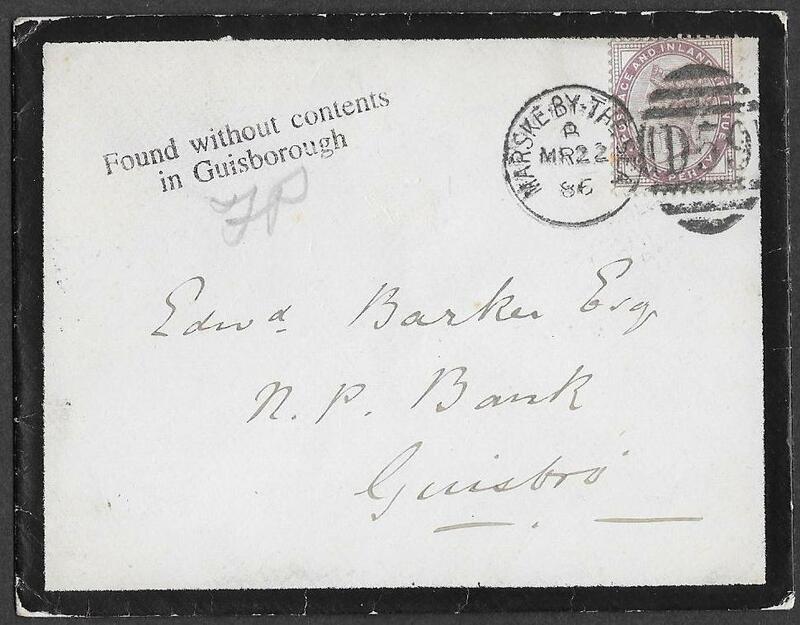 Sent from Yarm to Gisboro', the 3d cancelled by the '926' of Yarm and rated RARE by Parmenter, August 18th 1865. A rare internal UK usage of this 3d which was introduced to pay the letter rate to Belgium and Switzerland. Priced by Gibbons for usage on overseas letters at £600. 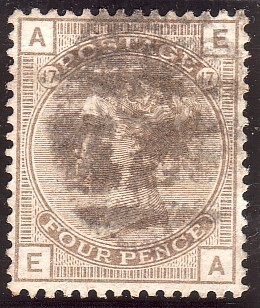 4d SG154 : a very rare usage on 1880 wrapper. 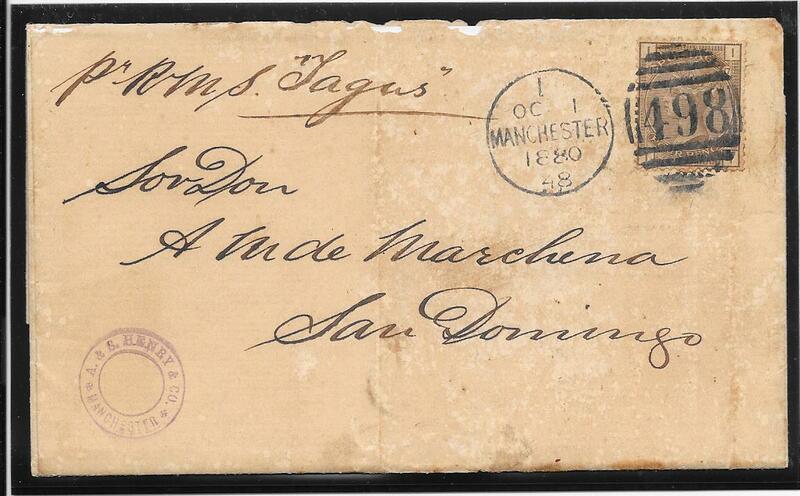 tied to wrapper to San Domingo by a very fine Manchester duplex, October 1st 1880 with in m/s 'per RMS TAGUS'. lists and illustrates ONLY 13 examples of SG154 on cover. This example is not listed and is EARLIER than any of the examples in his book. this is a RARITY as reflected in Gibbons price on cover at £1,700. The only example we have been able to offer. 4d SG66: very rare RED and BLACK PD cancellations. 1044. 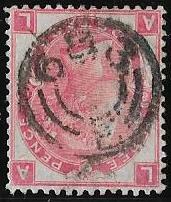 1857 4d SG66 very fine and cancelled only by PD in circle. exceedingly rare as it has both RED and BLACK PD in circle. The first such combined usage we have seen. 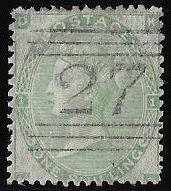 1/- SG72: rare used marginal inscriptional pair. with inscription 'PRICE 1 Shilling per label'. £700 as two non-marginal singles. NB: even in 1857 stamps were called 'labels'. SG125: variety double plate number. very fine/fine used except for a pulled perf at the top. 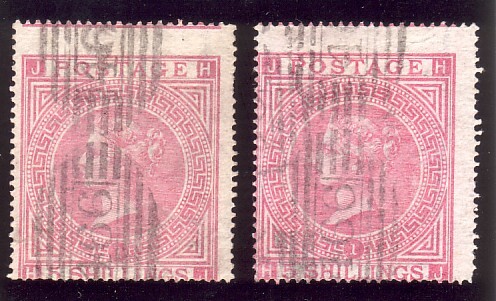 showing the listed variety, SG Spec J81d, 'Figure 12 on left doubled'. Gibbons price for this variety is £550. 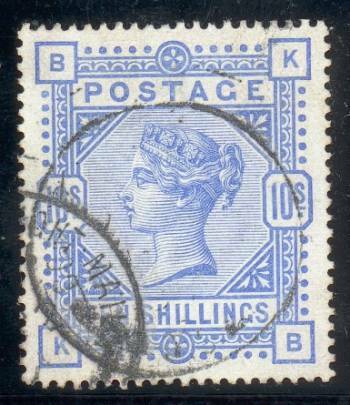 Very scarce stamp with this variety so clearly visible. SG152: Large 5 in Plate Number. with each showing the variety SG Spec J62d, ' Large 5 in 15'. 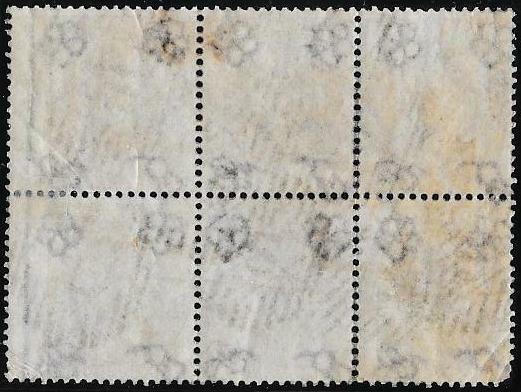 This variety occurs on only two stamps per sheet of 240. Priced by Gibbons at £900, this is the first example we have been able to offer. SG153: Large 5 in Plate Number. London November 26th 1877, slightly rounded corner bottom right. with each showing the variety SG Spec J64d, ' Large 5 in 15'. The finest cds example we have seen with this variety. Priced by Gibbons at £800 without the cds premium. 4d SG66: rare internal UK usage. 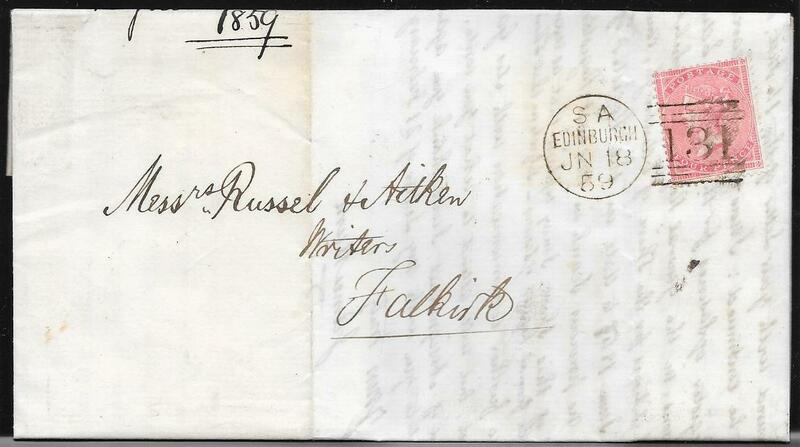 very fine example tied to an entire by Edinburgh duplex, June 18th 1859, to Falkirk. The two page letter refers to document/Registry Searches carried out re: Fushie Bridge and for the name Wilson. 4d SG66 priced by Gibbons on cover at £225 without the premium for internal UK usage. We have seen very few such internal usages of this stamp other than on registered mail. In a cleaner condition than the scanned image. 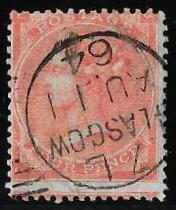 1/- SG72: rare usage to Ceylon. 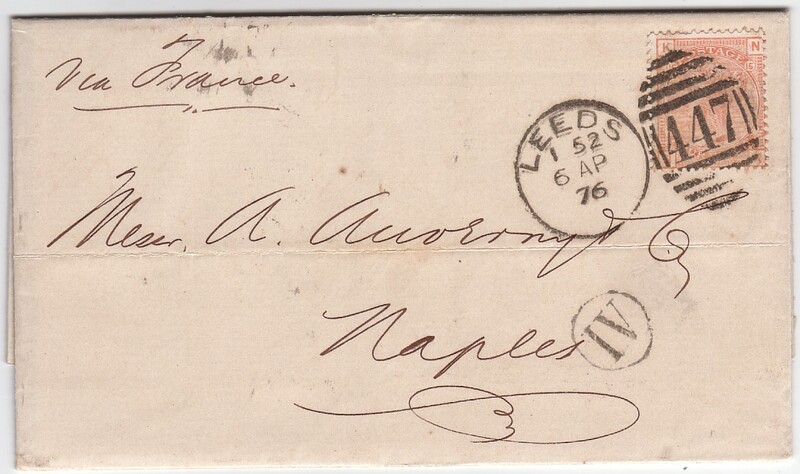 tied to a small neat envelope to HAPPOOTELLE, Ceylon from Linlithgow, March 9th 1861. Various transit markings on the front and reverse including Colombo Post Paid in red. The 1/- has a vertical bump in the wing margin caused by the pressure on the original contents. SG72 priced by Gibbons on cover at £425. 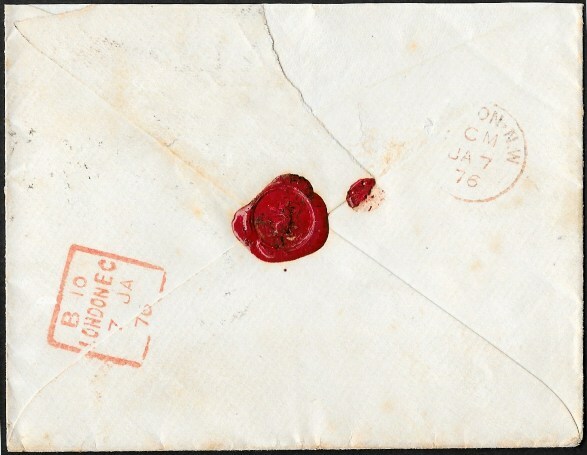 Envelope in much better condition than the scan suggests: there is no browning. 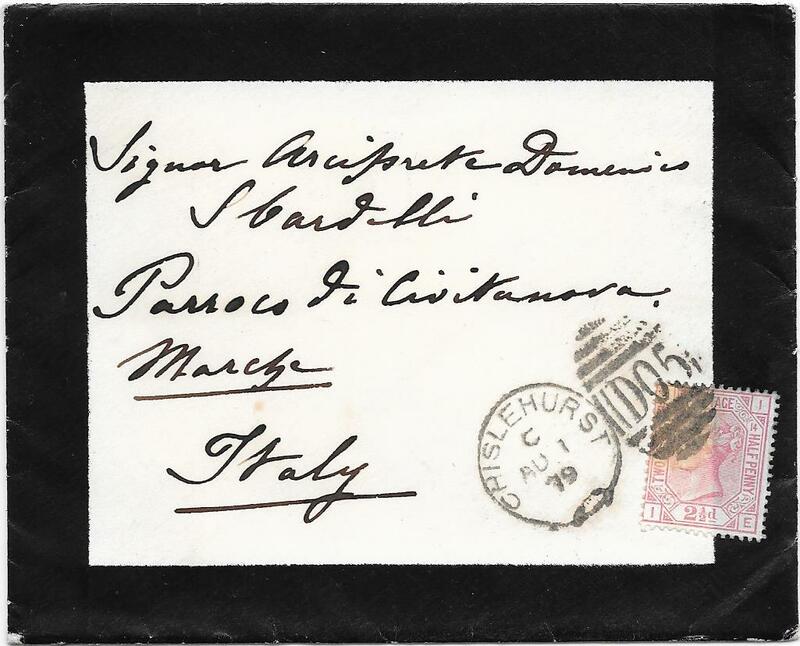 an unusually wide black - bordered mourning envelope to Italy. 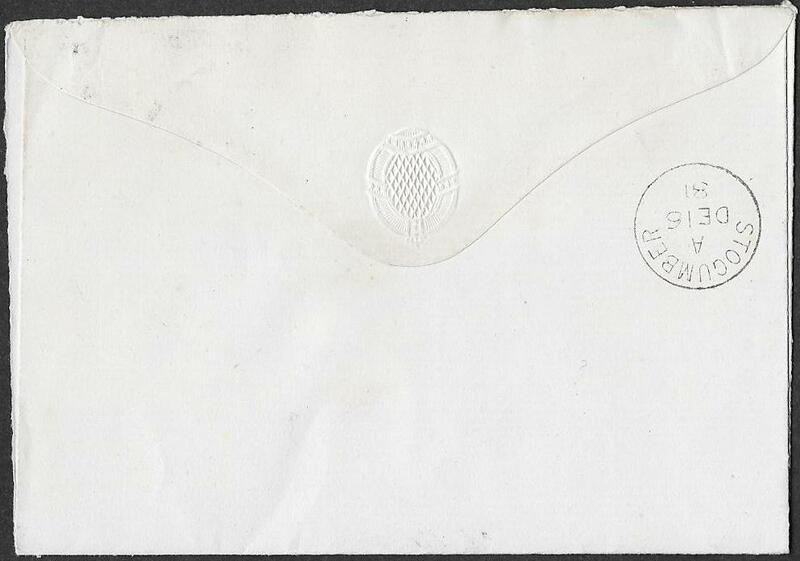 Very clean envelope and the light corner crease bottom right is not as pronounced as the scan suggests. 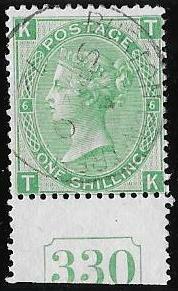 The browning on the stamp from the cancellation is also not as pronounced as the scan. 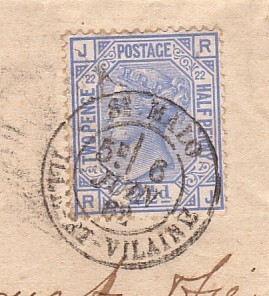 Stamp placed Contrary to Regulations at the bottom of the envelope. Gibbons price for this plate on cover is £150. were allowed to be used for paying the postage on letters. The next two envelopes illustrate this change in usage. 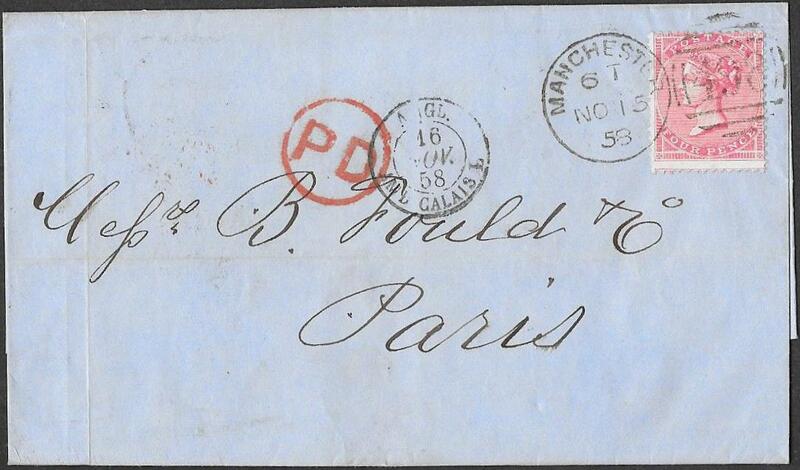 1d Bankruptcy on 1883 Envelope. 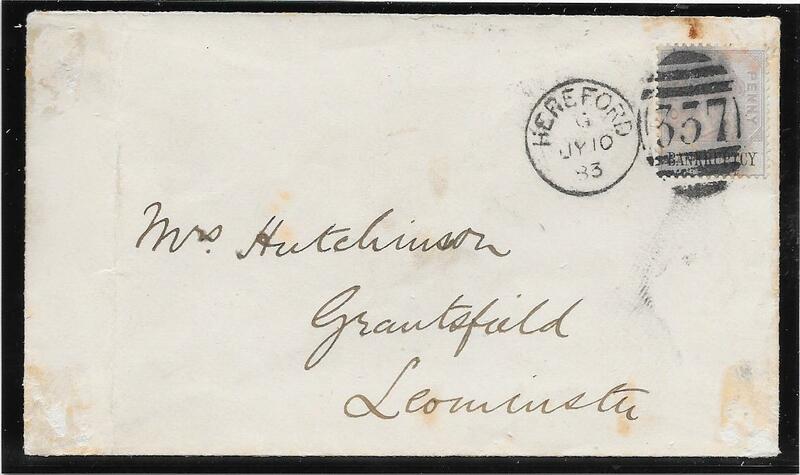 peripheral faults and hinge remnants on reverse - from Hereford to Leominster, July 10th 1883. Leominster receiver on reverse for the same day. Possibly a very small cut in the top right corner of the stamp. the first we have been able to offer. 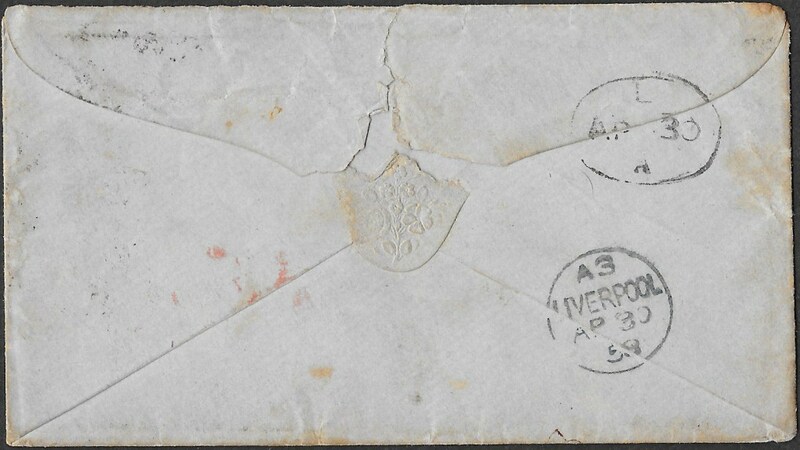 fine/very fine example on clean and uncreased envelope from Ormskirk, September 30th 1884, to Liverpool. Received in Liverpool on the same day. Rare usage and especially in such fine overall condition. a 3-margined IMPRIMATUR tied to a piece by a London duplex for July 21st 1881.
has a RPS Cert and appeared on the open market in 2008. The example offered here is the only used example of Spec L109 of which we are aware. A rare and unusual item and an opportunity to obtain a USED Imprimatur. 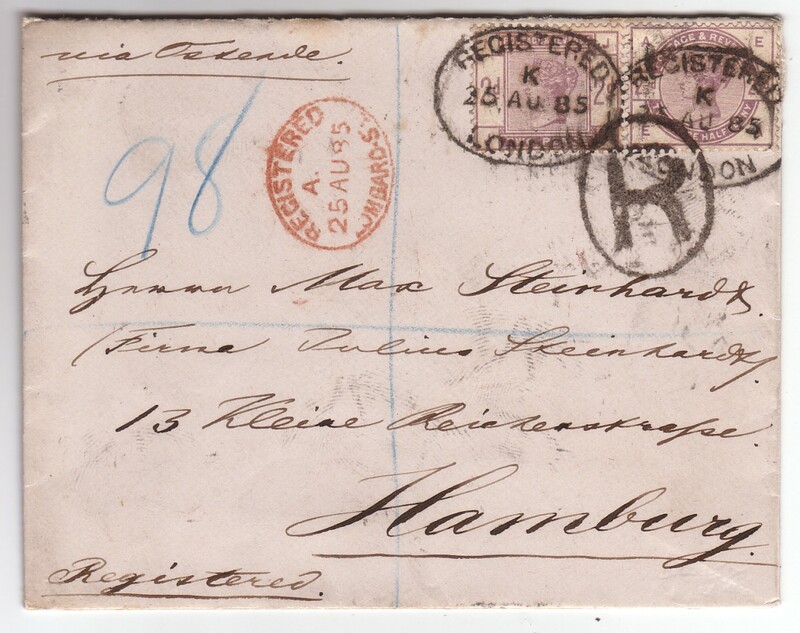 both fine/very fine and tied to piece by a ROMSEY '653' duplex in BLUE for December 12th 1881. An unrecorded duplex in any shade other than black by Parmenter. 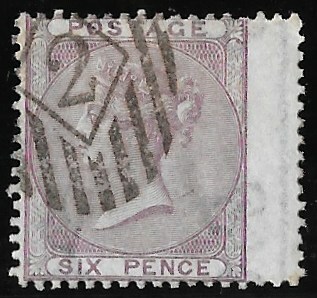 A rare combination of stamps made extremely rare by the coloured cancellation. DROWMORE Co. Down cds for Octber 31st 1872. 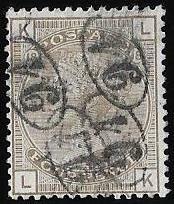 Stamp 'KB' has the listed variety, Spec J106a, 'Double Plate Number at Right'. The scan does not show the superb deep green shade. This is arguably one of the, if not the, finest examples extant of this variety. Gibbons prices it at £400 and then £700 when the 75% premium is added. Exhibition quality plus and a very rare stamp in such superb condition. with the very scarce Code A – used on Royal items of mail. Alongside is another strike in the same exceptional condition. Melbourne cds on reverse for December 11th 1864.
the 1/- in the scarce DEEP GREEN and a 4d, small surface rub. 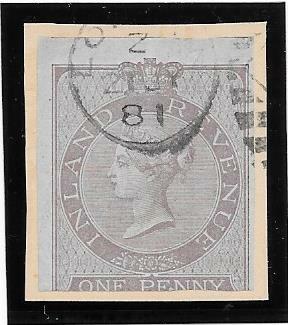 The 1/- SG89 priced on cover as a single stamp by Gibbons at £750. A rare multiple in this shade and especially so on cover. 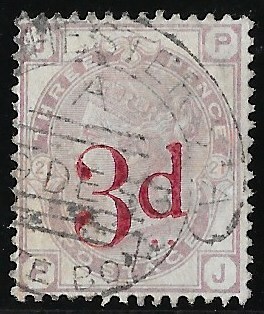 in a block of 8 and two strips of 3 – one 3d defective ‘RD’. Manchester duplex, heavy in places, for February 6th 1885.
is £1,750 and £1,970 with the 1/2d and 5d included. and so the true colours have been preserved. The largest franking of the 3d’s we can recall seeing! A very rare and impressive item. tied to a piece of a linen envelope by London EC hooded circles for July 31st 1885. Some wrinkling on ‘CC’ but all have very fine colour. Gibbons prices a single at £210. 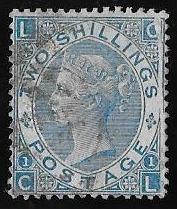 Very scarce multiple usage with strong colour for this issue. NB: the apparent brown marks at the right bottom corner of 'CC' is NOT present. very fine/fine, centred low but cancelled by a superb BALLYMENA upright cds for April 29th 1865. At the base is a small part of a PANAMA? name cancellation. A few nibbled perfs at the right and the scan does NOT do justice to its fine colour. cannot recall a finer example used in Ireland. Priced by Gibbons at £225 but with the 125% for the cds this rises to £500. a fine used example of this difficult stamp. by a Dover squared circle for December 9th 1880. Very hard to find so fine. 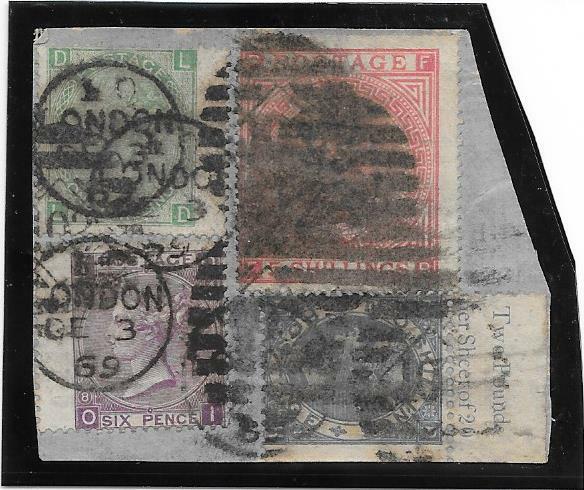 piece with various QV stamps and a cut out tied by Anerley Road - Crystal Palace cds’s for this date. 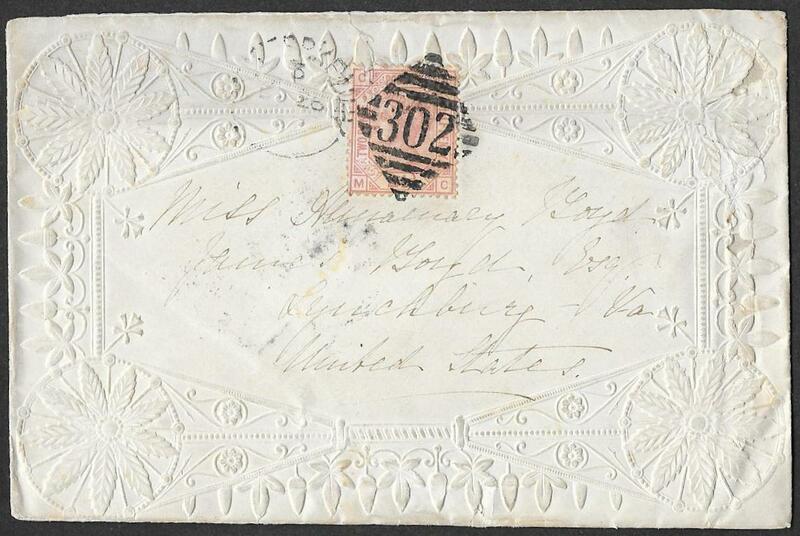 1/2d SG187 issued 1884 and a 3d rose cut out from an embossed envelope. All were legal tender at that time, except 1d SG166 - demonitized on June 1st 1901.
was being held at Crystal Palace – May 12th to October 27th 1911. Perhaps the person posting it expected the item to be cancelled with the Exhibition Flag Duplex? 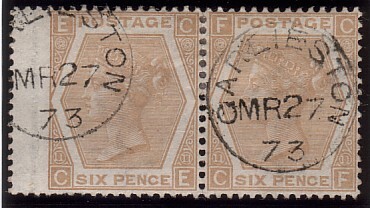 A remarkable and rare usage of QV stamps between 27 and 33 years after they were issued. 151338. 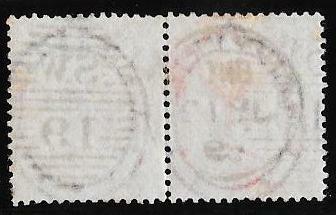 Remakable Block of 20, Three Pence Foreign Bill stamps cancelled by the 'French Government in London'. No perf strengthening and the browning effects are much less than the scanner suggests. This 3d Foreign Bill was issued in 1870. An impressive multiple and very unusual. perf strengthened between the top two stamps. Part of the 'POSTAGE' watermark in the side margin. 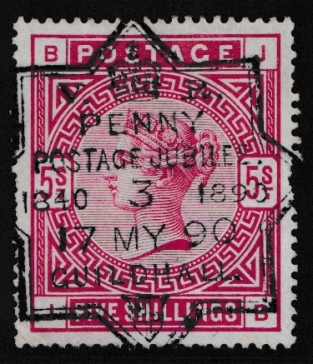 Cancelled by the Guernsey parcel post double ring in black. Gibbons prices a used block of 4 at £65. 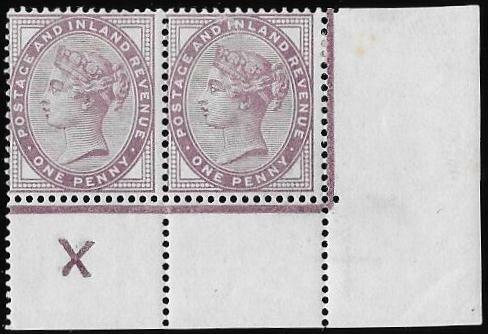 An attractive and very scarce/rare multiple used in the Channel Islands. a fine pair tied to piece by the Queen Street (Glasgow) Scots Local Type XV111. 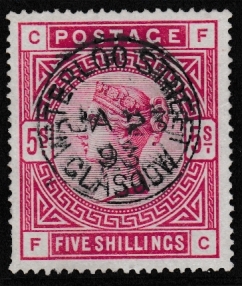 The Meredith Sale of Scots Locals had no examples of any type on the 4d SG62. their price for two single SG62's is £900. a few nibbled perf at top of ‘TE’, cancelled by Mark Lane B.O London cds’s, March 1872. Priced by Gibbons at £800 as two singles. 'HH' with small corner crease/wrinkling in the wing margin. Gibbons prices this block, without adding the 75% premium for cds cancellations, at £2,400. Excellent colour and a very attractive and very scarce multiple in such fine condition. but with an exceptional offset. The best we have handled for many years. NB: the scan does not do justice to the colour. progressive retouching to repair the printing plate, 'b' and 'c'. which was not repaired when the outer frame break damage was attended to. 'Frame broken at the bottom' - see Item 151314 - and would make a superb pair. 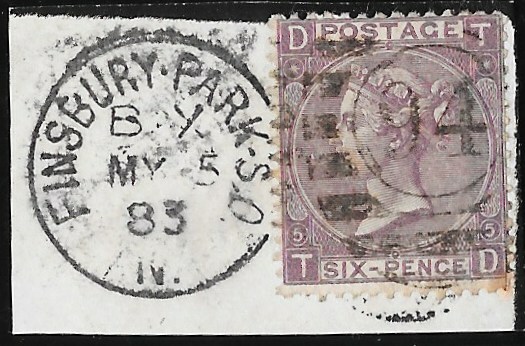 The dated cancellations, 1897 and 1901, leave the varieties clear. Gibbons prices this variety at £150 in the QV Specialised Volume 1 (2011) Edition. Superb display item and likely to be unique as a trio with the variety clear. cancelled '131' of Limber(Lincs): the bottom frame appears to be coming away from the rest of the design. A very scarce/rare variety seldom offered and which Gibbons priced at £350 in the QV Volume 1 (2011) Edition. NB: the slight toning at the left corners and side has been exaggerated by the scanner. 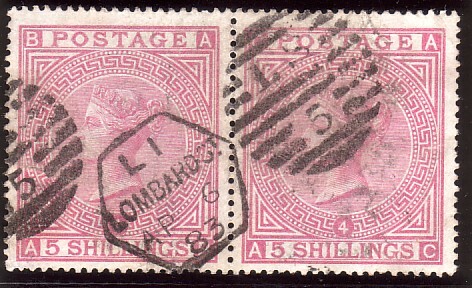 This would pair up well with 151313 as these are the only two listed frame break varieties by Gibbons for this stamp. the denomination printed in the top margin. 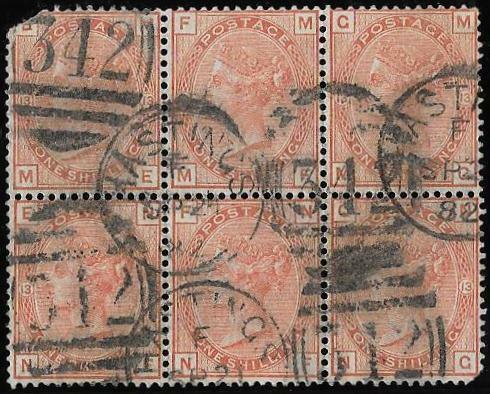 This series was printed in sheets of 192 stamps, two panes of 96.
denomination printed in the above or below margin. A rarity and the first used example we have been able to offer. meaning "meadow of the bull" - a coastal suburb on the northside of Dublin. The Month and Day of 'SE 10' has in each case been HAND INSERTED. and then corrected by hand directly on the stamps. 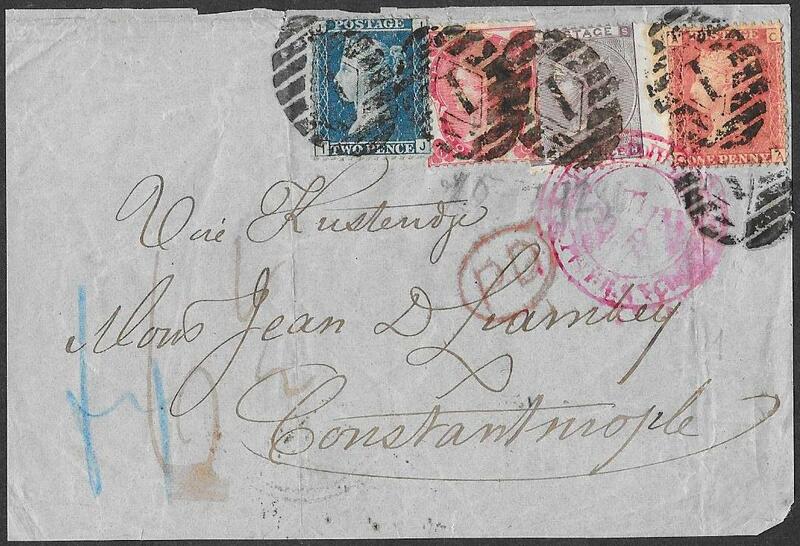 as used for High Values, 1867-83.
to part of a blue original material envelope with some wrinkling from it. 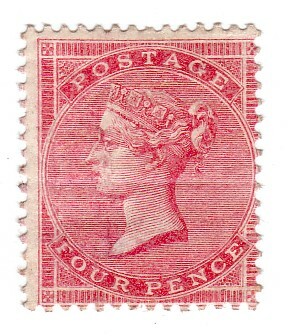 as few examples of this stamp are known on cover or piece. 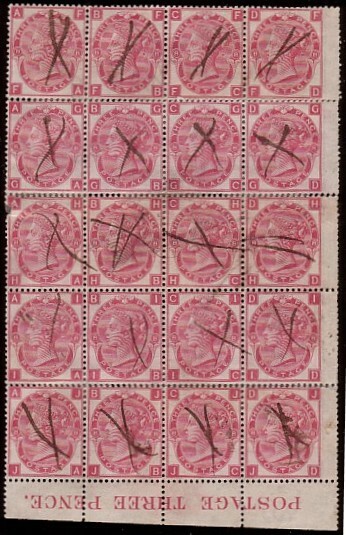 The combination of stamps totals 8/6d. all fine/very fine used and neatly tied by London EC scroll cancellations for May 21st 1884. A remarkable combination with the 2/6d on blued well centred and with good perfs - an attractive item that displays well. Gibbons prices SG175 at £1,400 without the premium for well centred and dated cancellation. tied by Gracechurch Registered ovals for 2nd August 1889. A very rare stamp and priced by Gibbons at £3,600 off over. Being off centre it allows the blueing in the paper to be more easily seen. very small surface bumps from the paper to which it is affixed. the first we have been able to offer for some considerable time. This grouping would make an excellent basis for a Collection of these interesting cancellations. 151348. 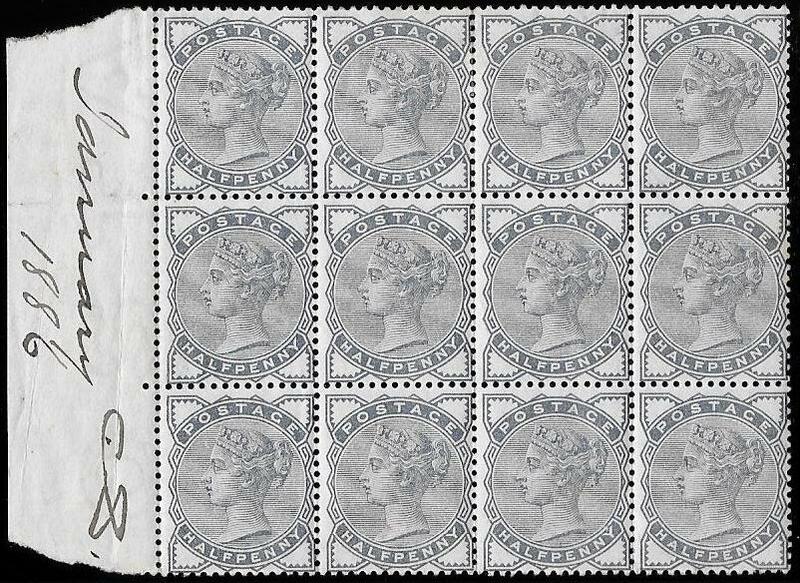 2/6d SG178: fine perfs except bottom left where some are missing. 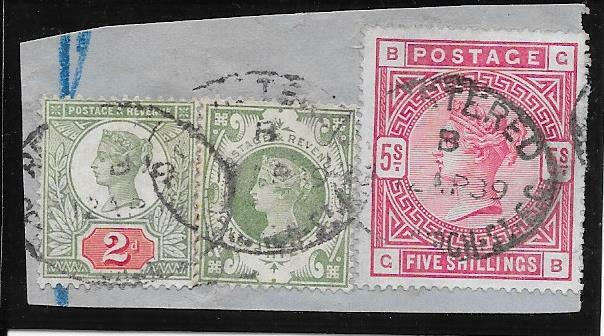 We normally do not publish on the Website damaged stamps unless there is an overiding rarity. This IS the case here. 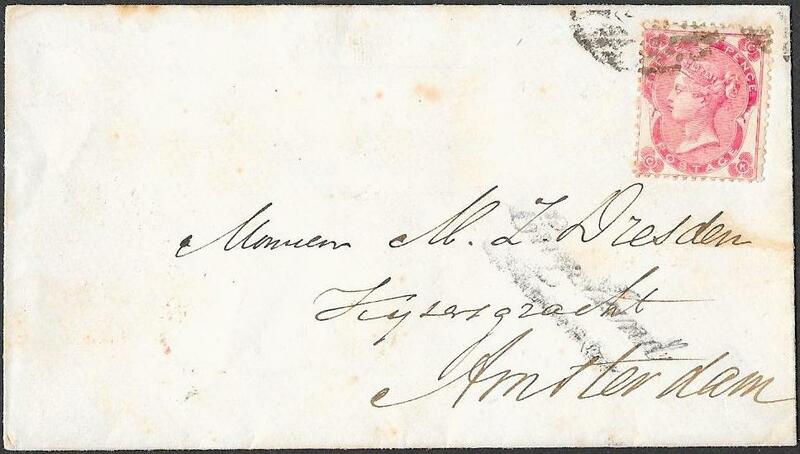 The 2/6d has been cancelled by the very scarce LIVERPOOL LATE BOX hooded circle date stamp, October 16th 1896, Parmenter Die 2.
for mail trains that would connect with the continental night trains and are usually found cancelling a 1/2d value. The fee for this service was only 1/2d. SEE ITEM 151339 in the Stationey Section. from any of these four provincial stations: Bradford, Leeds, Manchester and Liverpool. A considerable rarity despite the fault. cancelled by the London Chief Office number 1 machine; the machines were numbered 1 to 10. The collection times were almost always L1 7pm, L2 7.15 or 7.30pm and code L3 7.30pm. This L 3d is rated RARE by Parmenter. 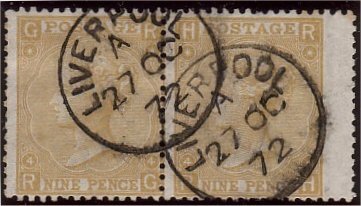 Fine strike for a 7.30 collection time on 19th February 1897.
cancelled by a very fine Chief Office machine number 2, L2, 7.15pm. Not a rare cancellation but unusual to find it on a high value. 151354. 2/6d SG178: Chief Office machine number 1 25th June 1897. Stamp with creasing and a very tiny thin near the top. with Parmenter giving it a rarity 'H' ie 'very few are known to exist'. 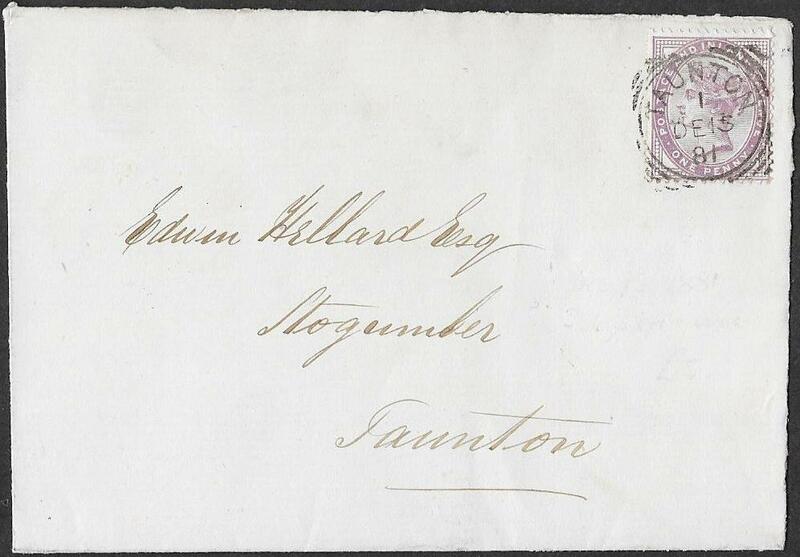 See Item 151244 in the Stationery Section for this very rare cancellation on an embossed cover. for October 6th 1893, rated uncommon by Parmenter. The 2/6 has a very small corner wrinkle/crease bottom left corner. A very scarce/rare combination especially so on an original piece. tied to piece by Fenchurch St Registered oval for April 12th 1889.
and the 1/- is in a deeper original shade of green than the scanner suggests. The 2d was printed in the scarcer shade during the early printings of which this is an example. 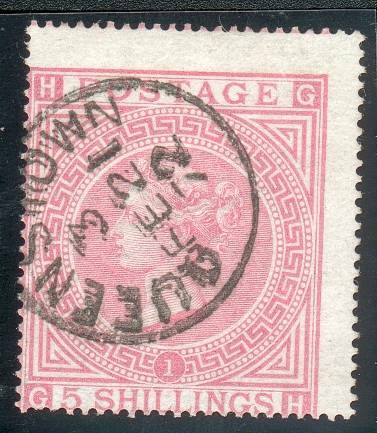 Very rare combination of stamps and the first we have seen with SG199 in combination with a 5/- value. The Queens head is almost clear on the 2d and 1/- and partly so on the 5/-. The scan does not do justice to the fresh appearance and the colours of this piece. the latter with some light wrinkling/creasing. Tied to piece by the Lombard Street squared circle for October 3rd 1897. The 5/- is in a superb and very deep shade. 151282. 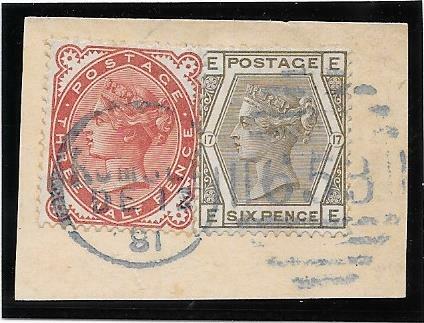 5/- SG181 fine used, Lombard Street cds August 31st 1900. 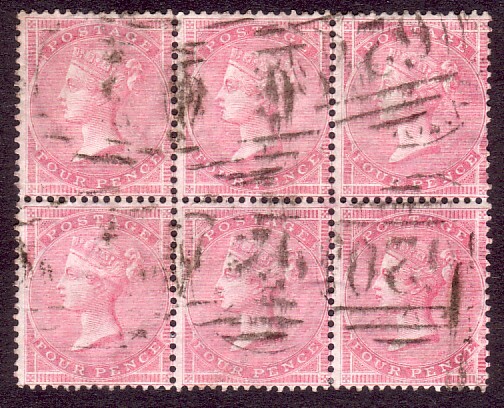 January 23rd 1893 cds, with excellent centring and perfs except one shortish top left. 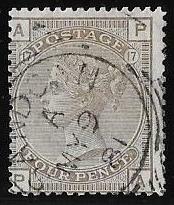 NB: A black cancellation at the left opposite the 'F' square makes it appear two perfs are missing. 151283. 5/- SG180/181 cancelled very unusually by the Edinburgh roller. this cancellation on a high denomination. 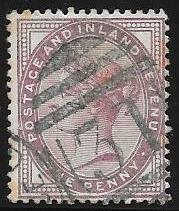 but superbly cancelled by the Penny Postage Jubilee Exhibition commemorative strike for 17th May 1890. Very rare to find this cancellation on any high value denomination bearing in mind the real value of these in 1890 terms! Despite the perf irregularities, this is a very rare item indeed. NB: we have only once before been able to offer this strike on a high value and that was on the 2/6, SG178. 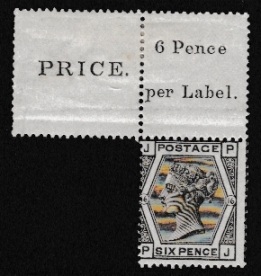 the top marginal inscription 'PRICE 6 Pence per Label' showing the interpanneau margin. with a smooth gum and just a couple of gum wrinkles as is often the case. still referred to as 'labels' as was the1d black. Priced by Gibbons at £500 as a mounted mint non-marginal single stamp. NB: the scanner has produced a diffraction pattern to the lines surrounding QV's head! 151299. 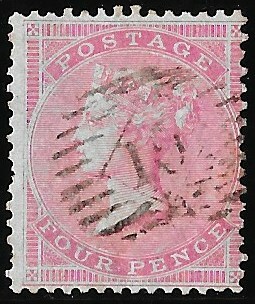 One penny pink envelope uprated with a fine 4d SG153 Plate 16, 'EB'. 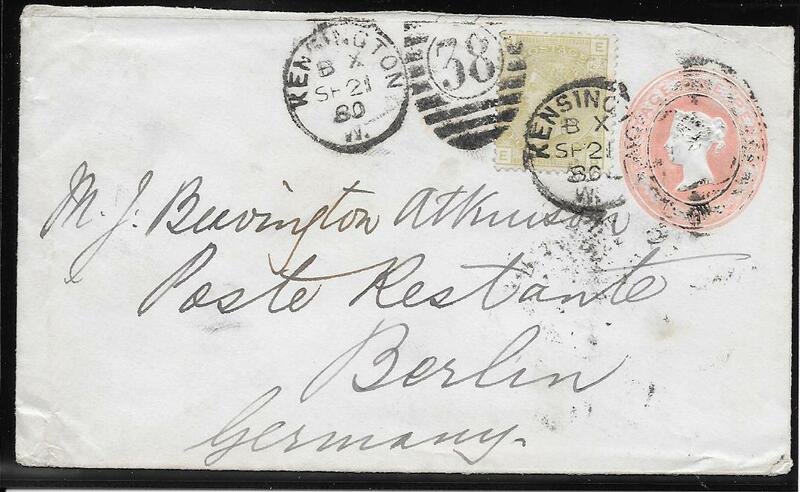 Posted in Kensington London, September 21st 1880, to a POSTE RESTANTE, BERLIN address. We cannot recall seeing the 5d postage rate to Germany made up with a 4d sage green in this way. This stamp on cover is priced by Gibbons at £600. 1d lilac Die 1 SG 171. 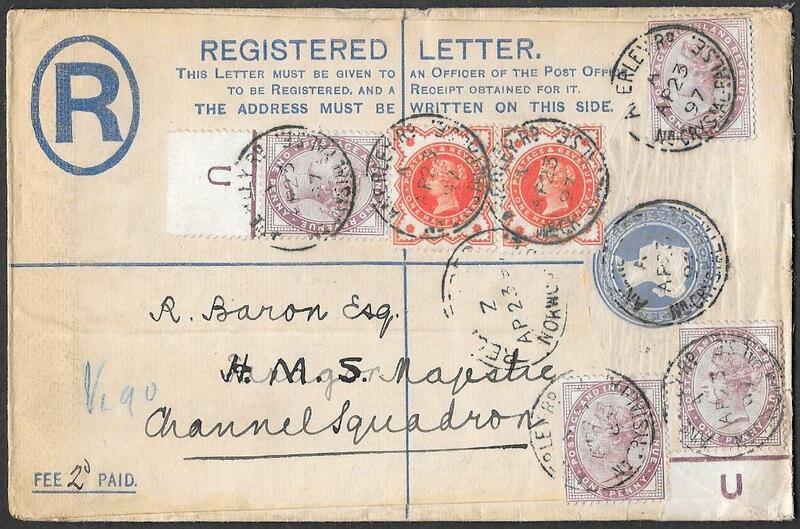 Cancelled by superb strikes of the First Type of Jersey squared circle for November 21st 1881. Some tone marks but not as pronounced as the scan suggests. 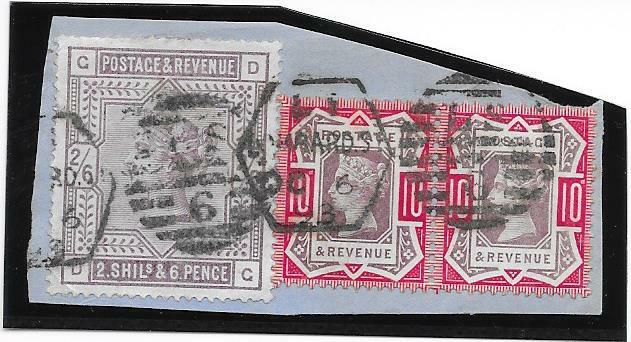 Rare multiple franking and rarer used in the Channel Islands. by two instead of three squared circles. NB: the age marks on the envelope are not as pronounced as the scan suggests. 151261. 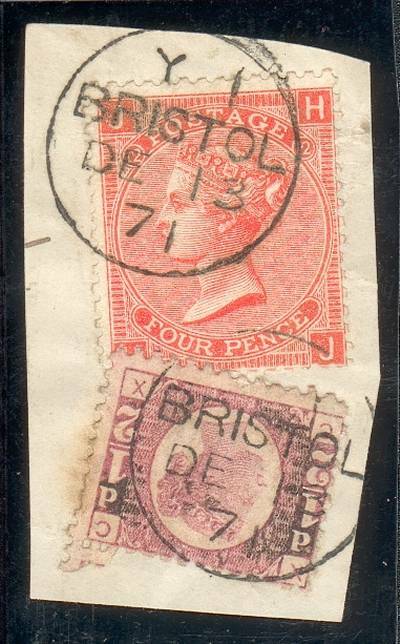 1d SG172, possibly very small hinge traces on top two stamps, bottom two unmounted mint. 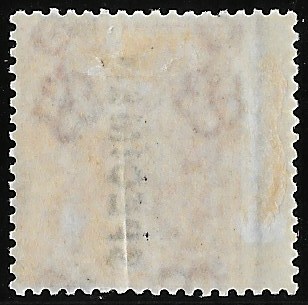 Very small tone mark on top left stamp near the perfs as per the image. Very fine otherwise and with INVERTED Watermarks. 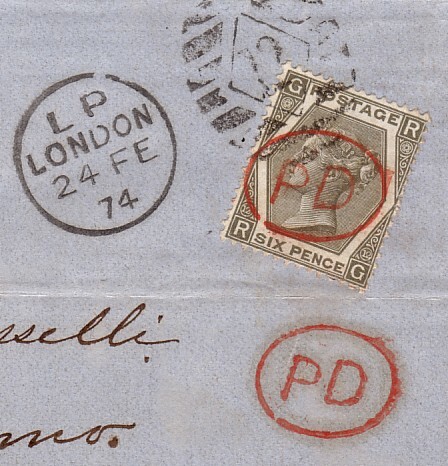 parts of the letters 'E' and 'G' of the 'POSTAGE' marginal watermark on two stamps. This is the first time we can recall seeing this effect on this issue with inverted watermark. 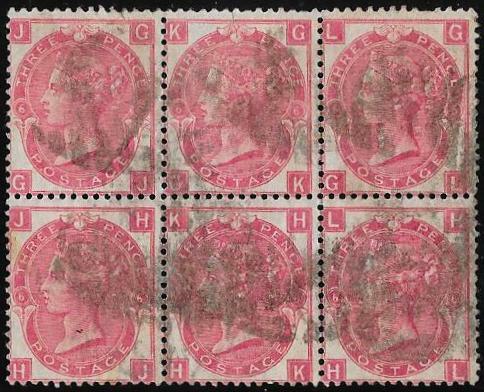 151229: 6d SG70 – good/fine used Block of 4 and priced by Gibbons at £700. 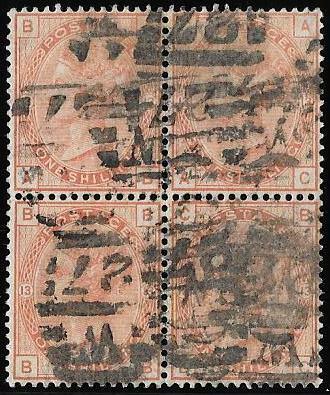 151230: 6d SG109, plate 9, ‘SG-TH’ – a fine used BLOCK of 4, Little Tower BO London, 1872. Printed in an unusually deep shade for this plate with a light corner crease to ‘SG’. Attractive block and priced by Gibbons at £575. re Smart and the Flagship ‘Victoria’ is available with this rare and attractive item. Dornock – now a famous Hotel where Madonna and Guy Ritchie were married. which operated on the Southampton-Alexandria route. 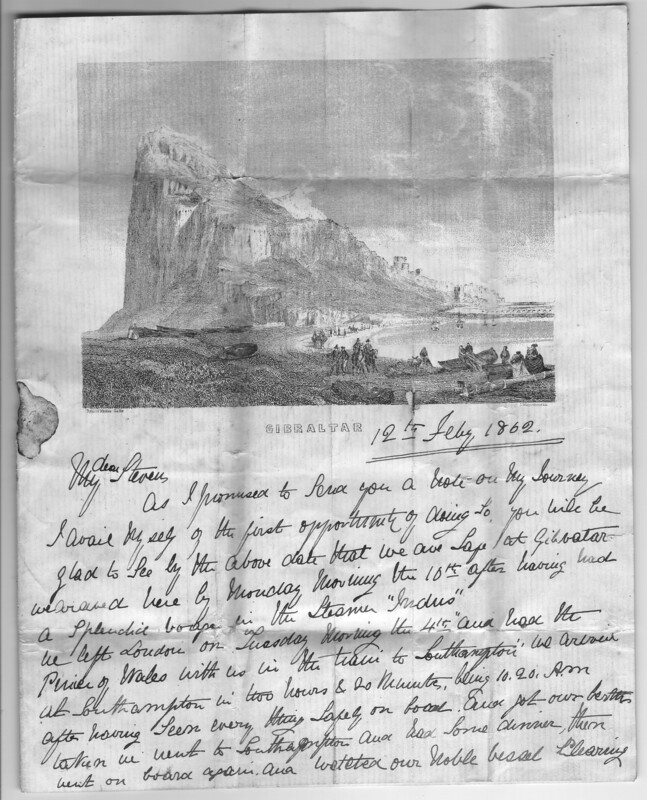 The first page has a superb line engraving of Gibraltar. The long letter mentions that he was a passenger on the same train to Southampton as was the Prince of Wales. Details include descriptions of ‘Indus’ as a large boat with lots of sheep, cows, chickens and geese on board. The writer describes the Bay of Biscay, passing along the Portuguese coast and seeing Lisbon before entering the Bay of Gibraltar. ‘around every corner you will find a Battery’. 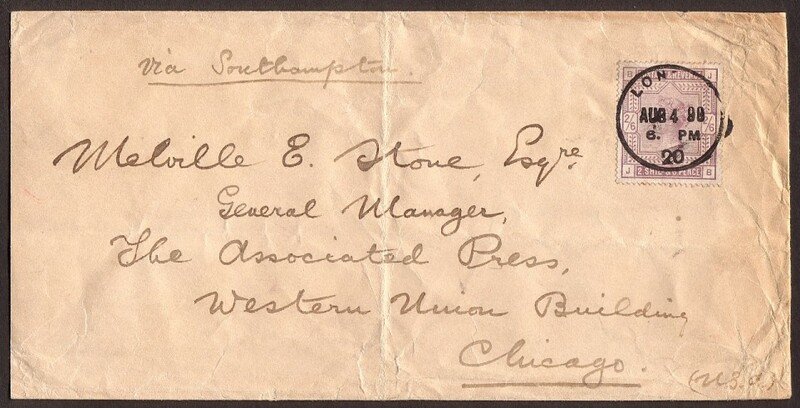 An exceptional letter which would make a memorable and fascinating display item. NB: in finer condition than the scan. 107 Fleet Street EC cds, SP 30th 1872. ‘SL’ has a small closed tear at the right but in the bottom margin is the ‘330’ Warrant Number. this is the first example we have seen in a used block. 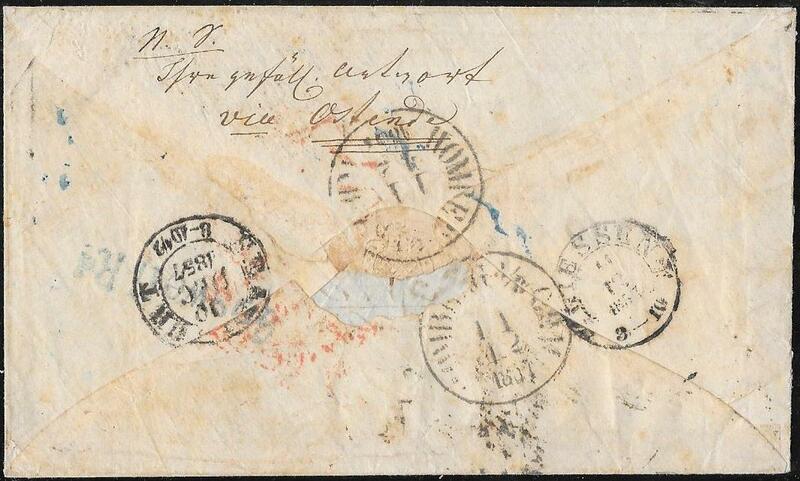 – issued 10 years apart – on wrapper to Italy from Newcastle on Tyne, August 23rd 1870. 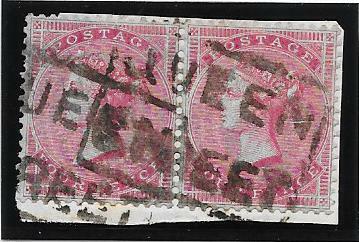 ‘Insufficiently Stamped’ strike and a pair, faults with 60 Centisime postage dues added. 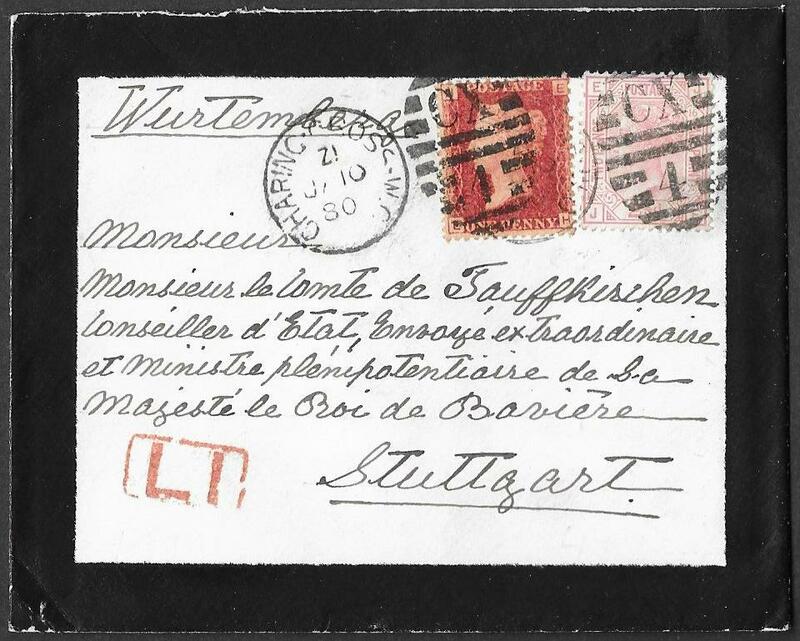 An attractive item and an early example of postage dues added at an overseas destination. 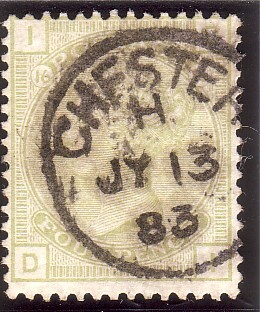 used on a neat Registered Envelope from Jersey to Hampstead. Stamps tied by the Jersey ‘409’ duplex, December 30th 1873.
and a very scarce/rare registered item from the Channel Islands. 15175. 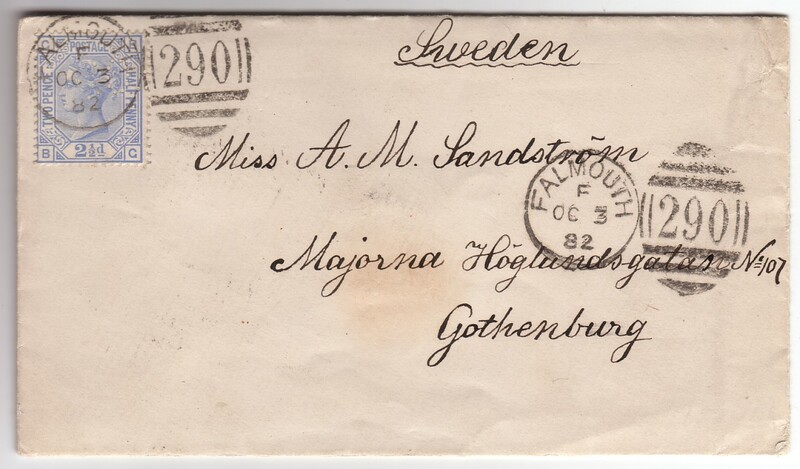 2 1/2d, SG 157 plate 22: perfinned example on clean envelope from Falmouth to Gothenburg with letter written in Swedish. 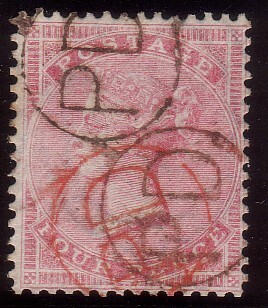 Stamp tied by the cds of the Falmouth duplex for October 3rd 1882 with an additional duplex strike at right. Market –Strand Falmouth cds and a Majorna receiving cds on reverse. 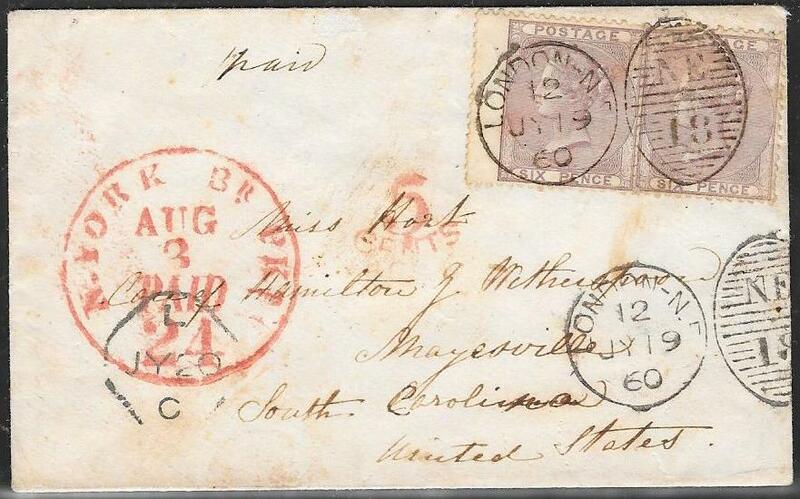 by neat Chatham sideways duplex for Jan 4th 1859. 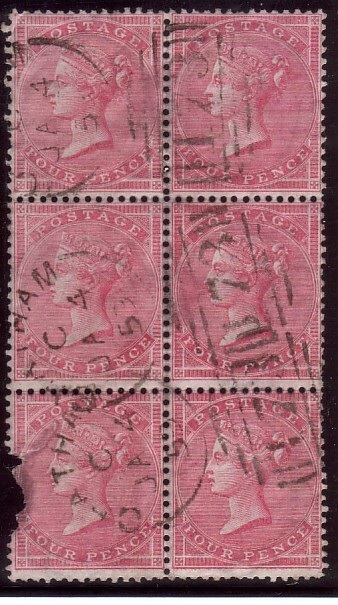 Total or partially clear QV heads on most stamps. 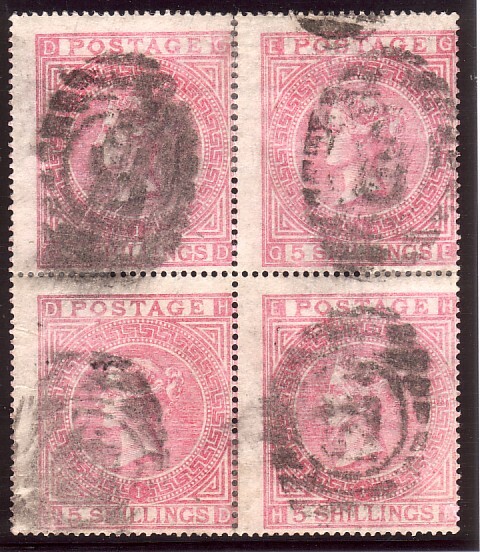 Bottom left stamp damaged but the rest are very fine to superb especially so in a block. but one could fairly add the premium of 125% as per SG to this item. Despite the damage to one stamp, this is one of the finest blocks we have been able to offer. 15037. 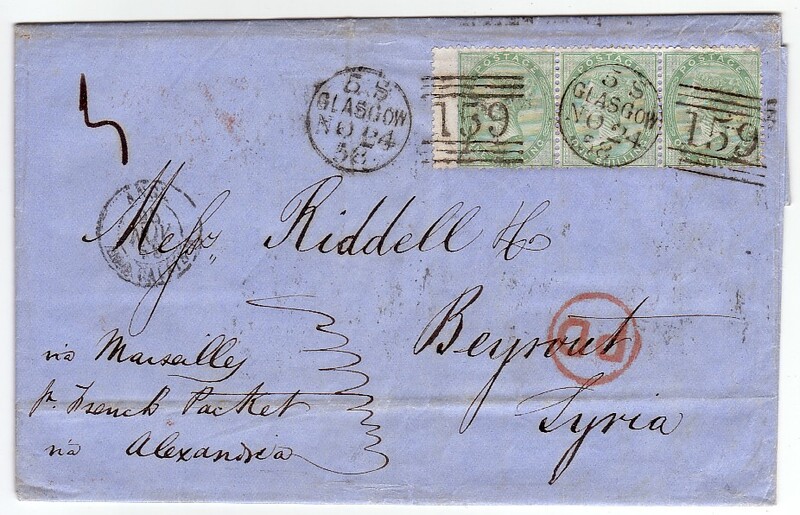 1/- SG72: strip of THREE on entire to Beyrout, Syria from Glasgow November 24th 1858. 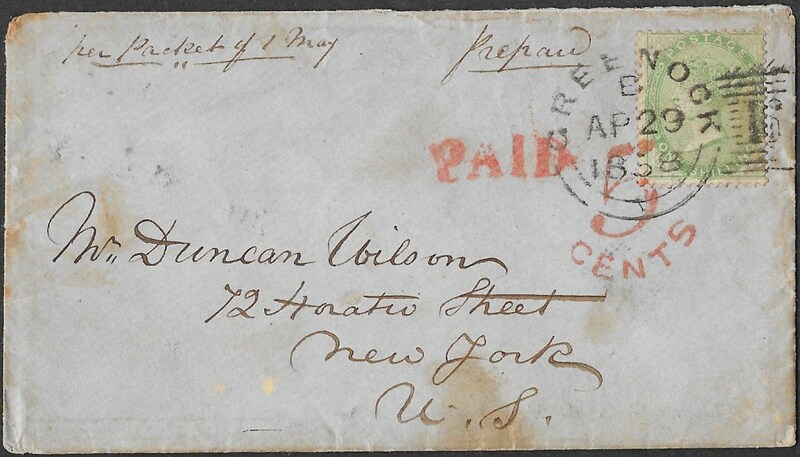 The postal rate to Syria at that time was 6d, 1/4oz and 1/-, 1/2oz. Hence a rate of 3/- is very scarce. central stamp is very fine with a complete and almost upright cds of Glasgow. Very rare to find SG72 cancelled solely by a cds on cover. A single SG72 catalogues on cover at £425. The cds example on cover with premium prices at approx £1,000. 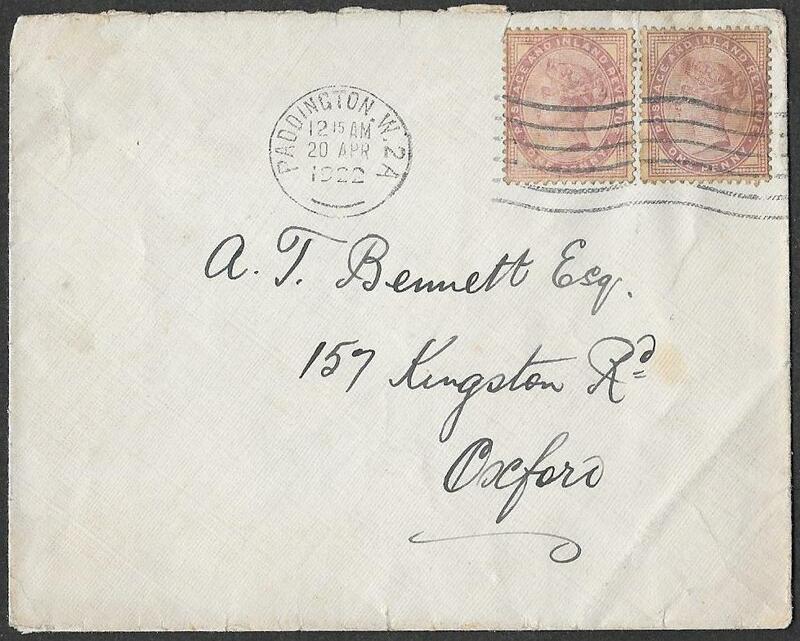 A remarkable item with a rare franking and destination. 15038. Large garter un-printed and un-gummed strip of FIVE showing the vertical interpane gutter margin. leaves theWHOLE of QV’s Head clear thus showing the blued paper to advantage. Rare so fine and catalogued at £250 without the premium. 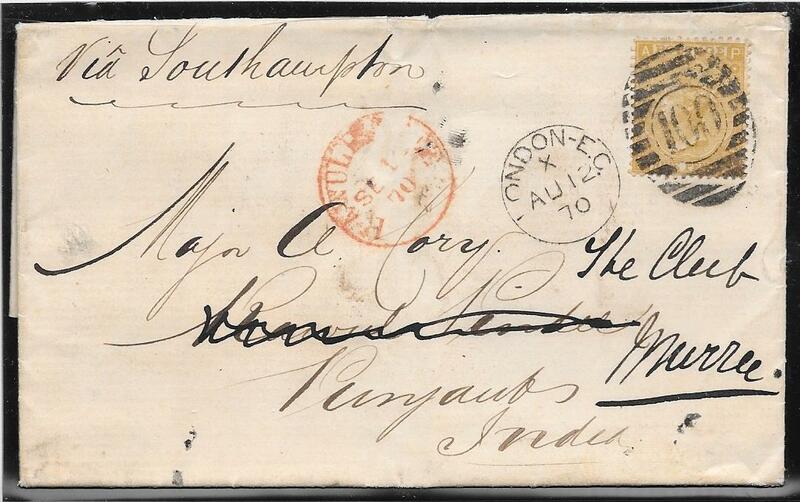 superb example tied to an envelope to Germany by a London duplex, June 30th 1877. 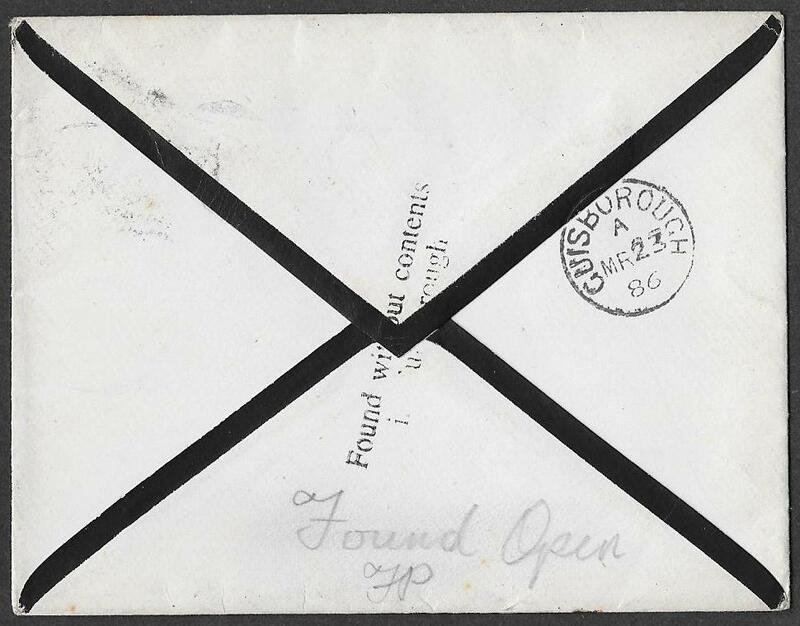 Envelope with light horizontal crease but the duplex leaves the entire QV‘s Head clear. April 6th 1876 – barely one month after issue. fine example on an equally fine cover. Priced by Gibbons on cover at £1,100. 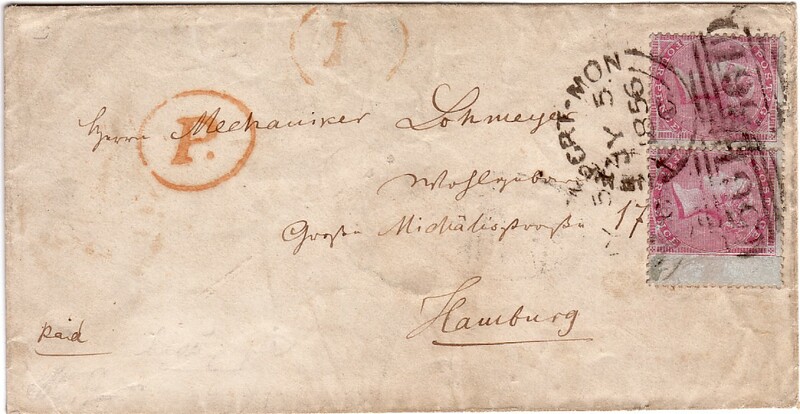 JY 5 1856 on envelope to Hamburg – part of rear flap missing. The only multiple of this stamp we have seen with INVERTED WATERMARK on cover. 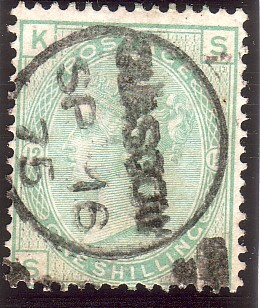 A single stamp priced by Gibbons OFF COVER at £1,200. A fresh lightly mounted mint example with superb colour. Horizontal crease but with INVERTED watermark. Priced by Gibbons at £4,750.00 - a very rare item. 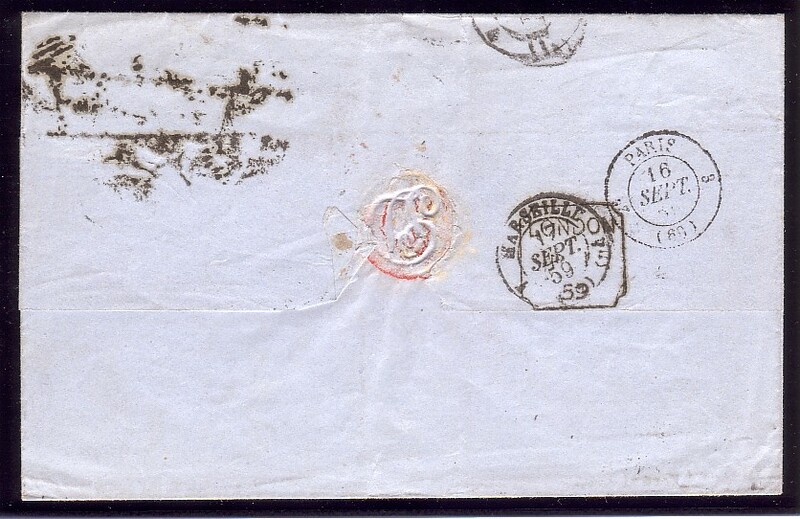 1/- SG72 with INVERTED Watermark on Cover. with an additional strike clear of the stamps. but the 1/- pair is very fine with one stamp having the Edinburgh cds. offer of this 1/- with a cds and watermark inverted even on a stamp not on cover. Gibbons price for a single 1/- with inverted watermark is £700 and the CDS single at £875. Allowing for just these 1/-'s being on cover, Gibbons price increases to well in excess of £2,000. An attractive and very rare Scottish entire. SG123 6d: a Certificated Unrecorded Variety. including the base of the Queen’s head. The item has an RPS certificate. 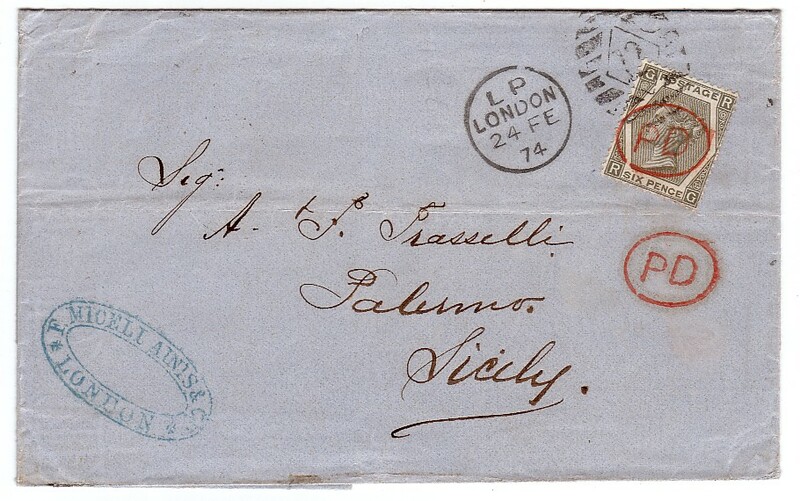 a very fine example on a neat, clean wrapper to Palermo from London, 24th February 1874.
below the 6d on the front of the envelope so it could be more easily seen than on the stamp. 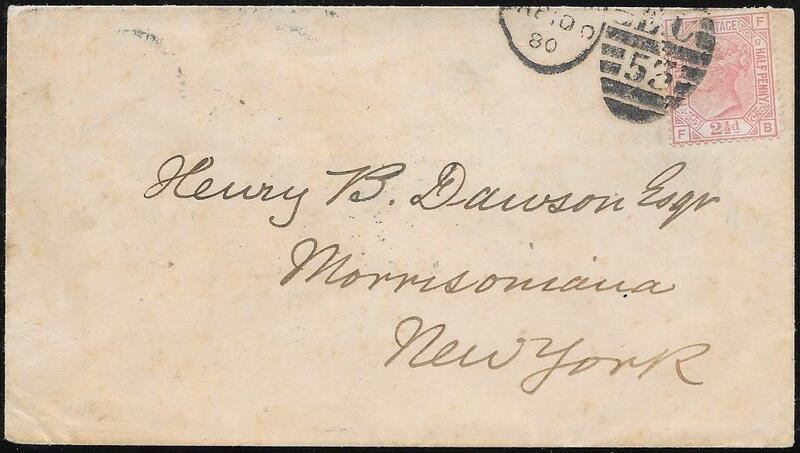 Attractive and rare example on cover of this usage of the PD to cancel a stamp. used on Royalty Mail and some State Departments. perfinned Crown/BT of the Board of Trade. 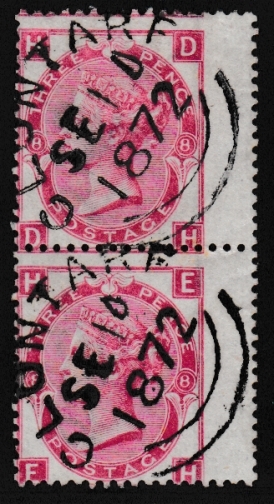 A very scarce/rare combination of cancel and perfinning. The stamp is offered with Certification. tied to small piece by the VR London Scroll JY 1884. Stamp also perfinned by the Crown BT of the Board of Trade. possibly unique on this stamp. 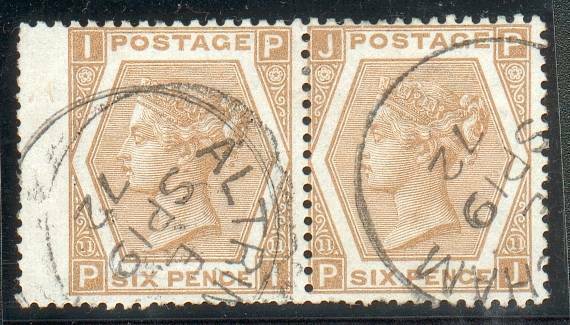 good/fine used pair, top corner wrinkle on right stamp. Priced by Gibbons at £950 as two singles. of a Newcastle sideways duplex. Rarely find used marginal copies of this stamp. tied to piece by Inland Office ‘29’ in diamond of bars. 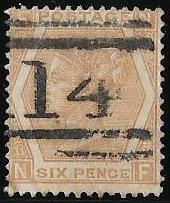 Rated Very Rare by Parmenter in the ‘Barred Numeral Cancellations of London’. 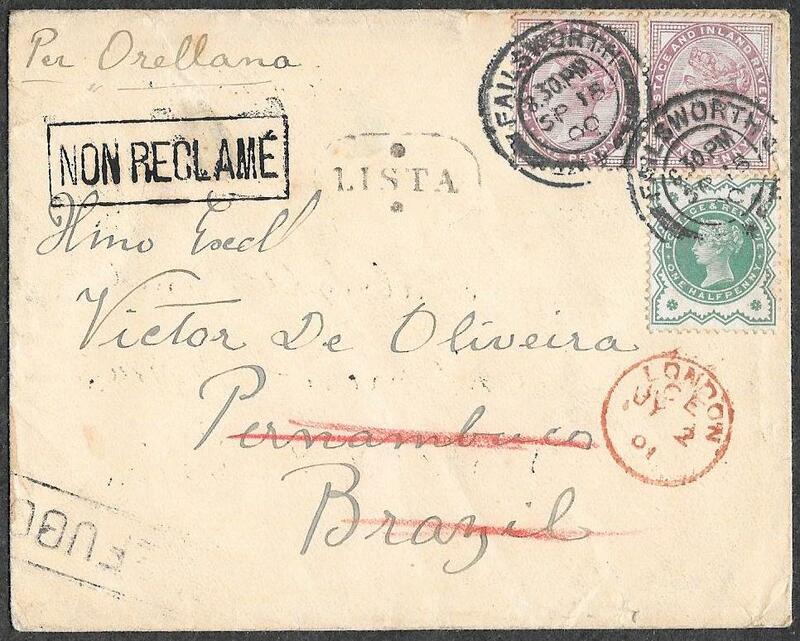 Colourful and attractive franking and a rare combination of stamps and cancellation. Each stamp with small faults. INVERTED and REVERSED. Unpriced by Gibbons. wrinkling/creasing to bottom pair, London diamond cancels. Cat £1500++ in this shade. 229. 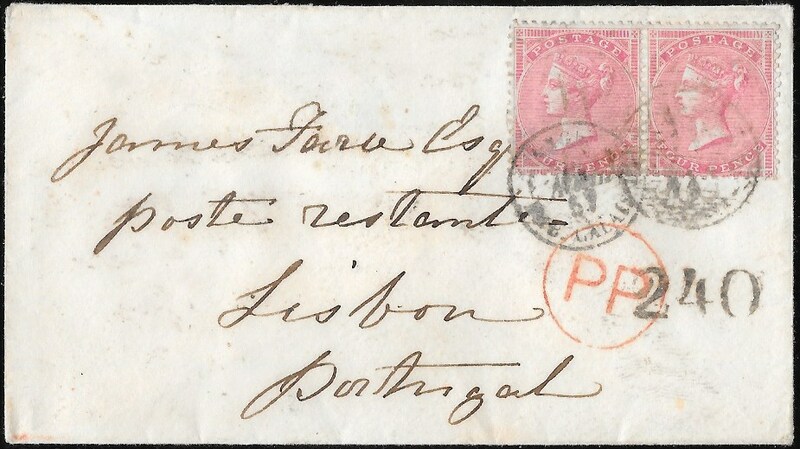 1856 1/- SG 72: superb used with excellent colour and superb A26 of Gibraltar. S7. 1/- SG71 - the scarcer deep green shade. Superb and neatly tied leaving at least 90% of the Queen’s head and profile clear. Priced by Gibbons on cover in this scarcer shade at £675 before adding the premium for the light cancellation. four emblems of it in the centre of the stamp. The watermark is displaced just about as far as it is possible to be. damaged frame variety. Each stamp mainly clear profile. Unusual variety especially in a multiple. Priced by Gibbons at £1000+ as singles. extremely deep/rich shade of purple. and very scarce/rare as such. Priced by Gibbons at £1,000 plus including premium. and showing the catalogued variety ‘damage to figure ‘11’ on the left’, SG spec J79d. A rare matched pairing – this variety is especially difficult to find in the pale buff printing. Priced by Gibbons at £400 in the commonest shade and at £800 in pale buff. with finely applied cds cancels of Garlieston March 27 1873 . Priced by Gibbons at £250 as two singles and at £375 with premium for vfu. Very scarce/rare multiple so fine. several nibbled perfs, scarce with CDS. top marginal inscription of 'SIX PENCE'. Glasgow cds for Sep 16 1875 .
very fine cds copy Chester JY 13 1883. Priced by Gibbons at £600 including cds premium. 284. 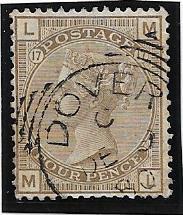 1880 4d plate 17 SG 154: fine used, well centred and good perfs. 224. 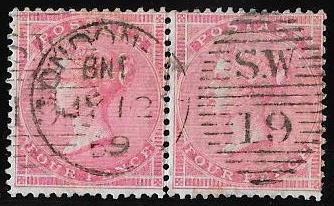 1883 3d on 3d SG 159: very fine used pair. Priced by Gibbons at £320 without the premium. of Piccadilly Circus, October 29 1883. Newcastle under Lyme then redirected to Newcastle, Rochdale and finally Manchester. Handstruck 1d and 2d both in black on the front and full wax seal on reverse. 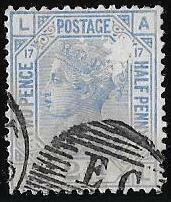 Very attractive and unusual and scarce with such combined surcharges. 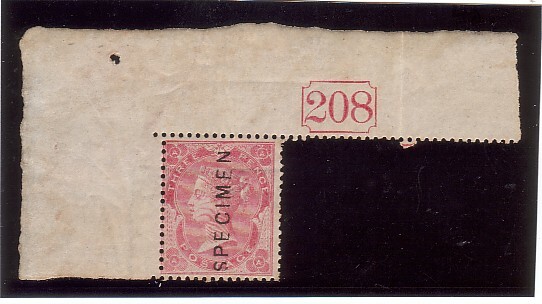 The majority of the action is on the front of the envelope so ideal for display. 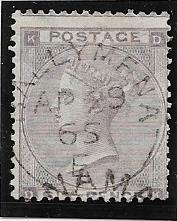 August 25th 1885; a scarce mixed plate usage from this issue. each tied by London CDS, Dec 13 1884.
each cancelled by Manchester CDS, June 27 1884, some smudging of cds and wrinkling. 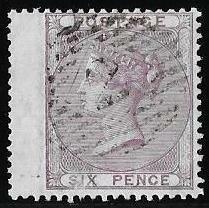 A very scarce block with deep original colour. superb used with strikes of a London experimental squared circle, April 2nd 1885 . Very attractive. Priced by Gibbons at £400 including premium. receiving cds for November 30th 1885. Dr Arning was an English-German dermatologist and microbiologist from Manchester. Wikipedia. A RARE destination and an item sent to a pioneering medical scientist. 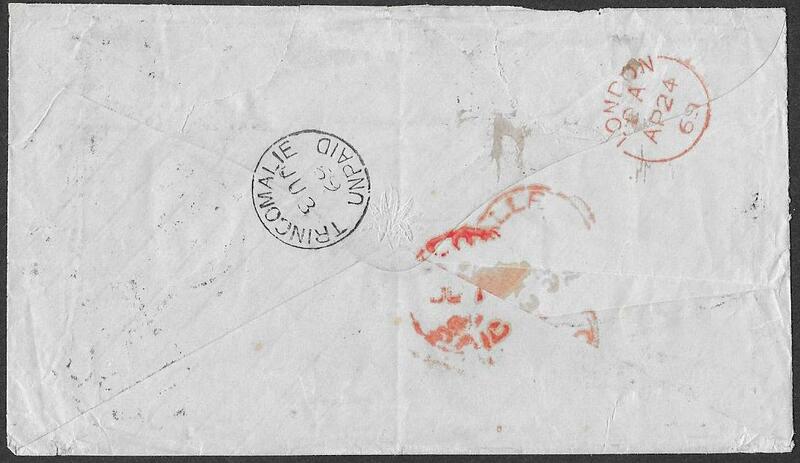 NB: envelope in better condition than the scan suggests. perfs and ‘TI’ with small fault at left side. London cds’s for November 22nd 1884. Priced by Giibbons at £1,500 plus a 100% premium for the cds cancellations. A very collectable block and rarely found with cds's.